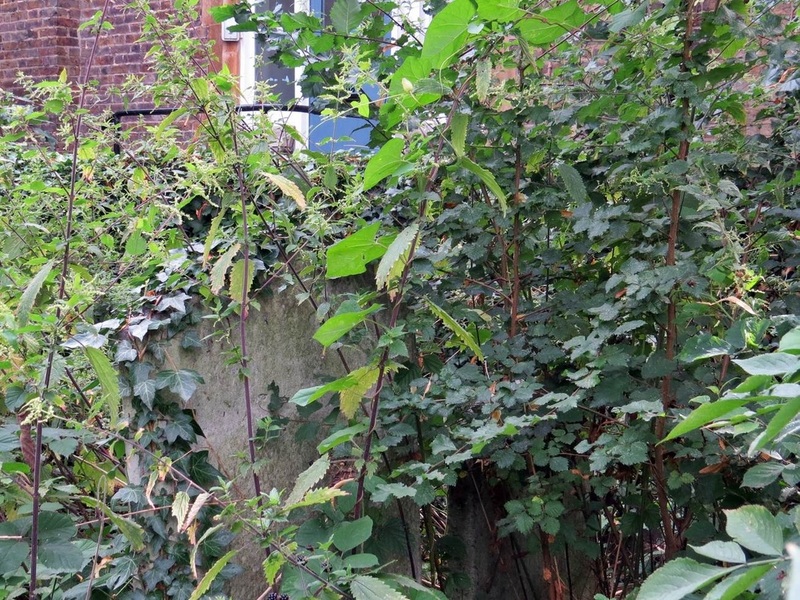 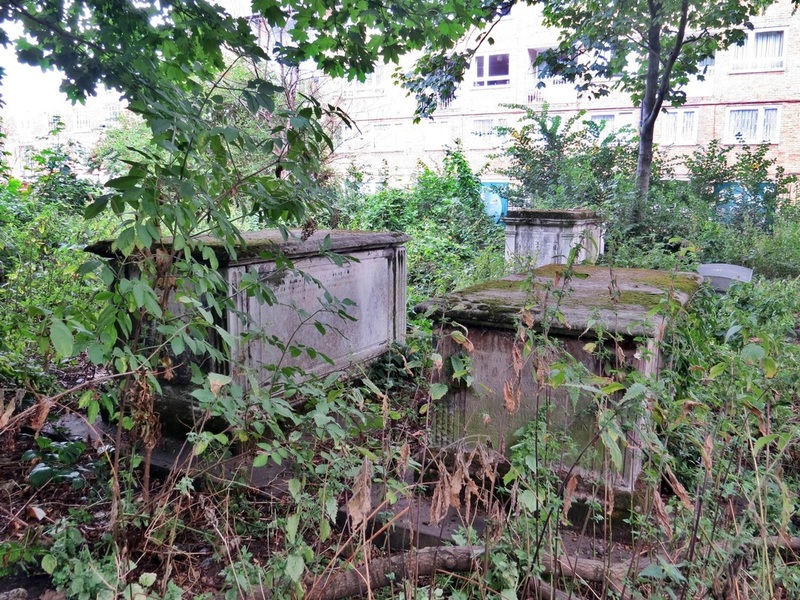 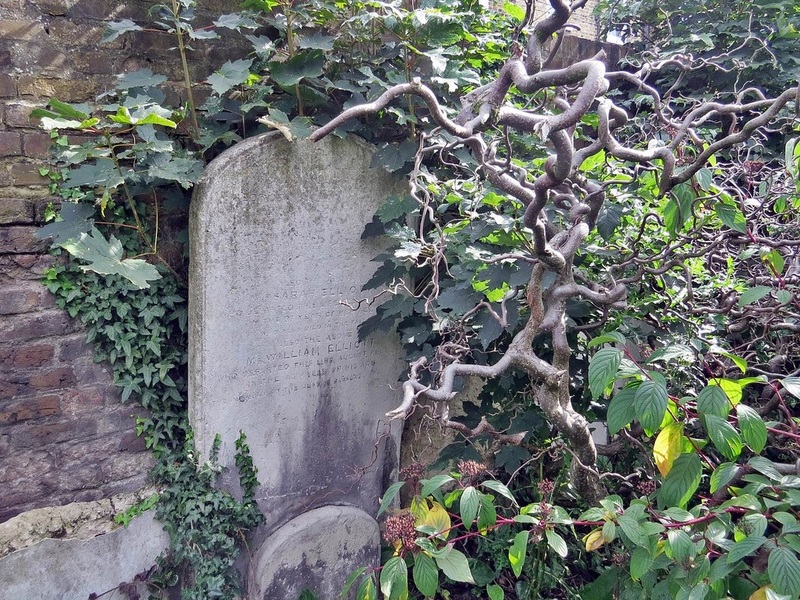 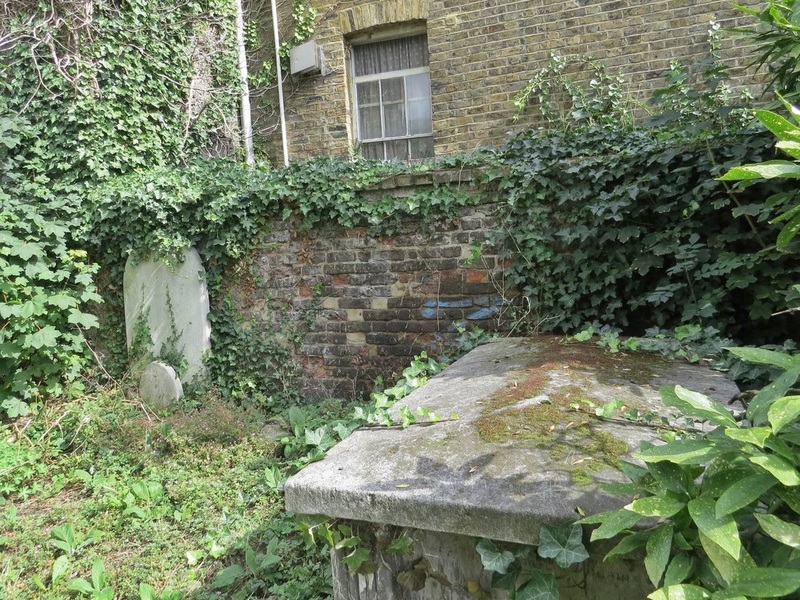 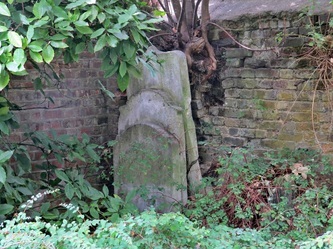 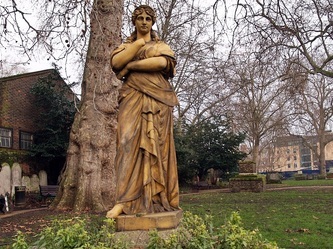 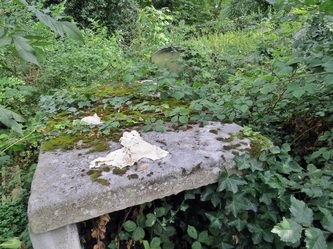 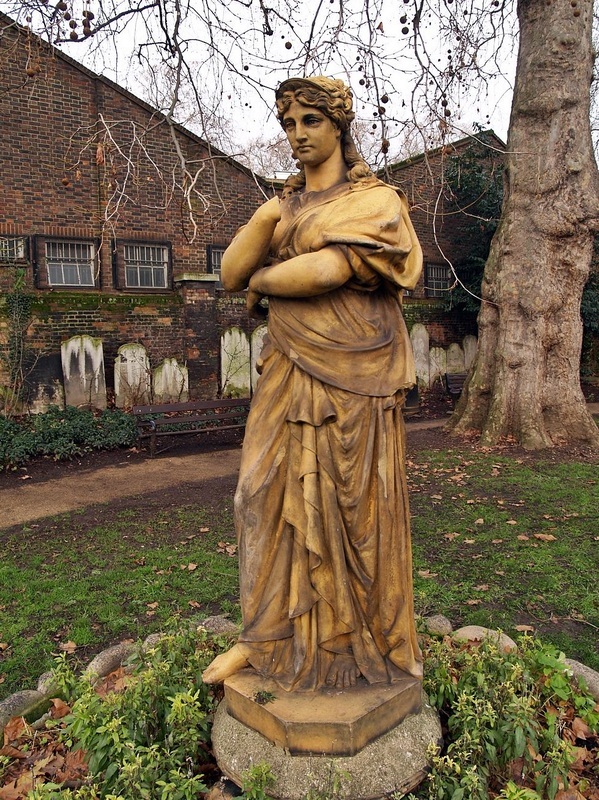 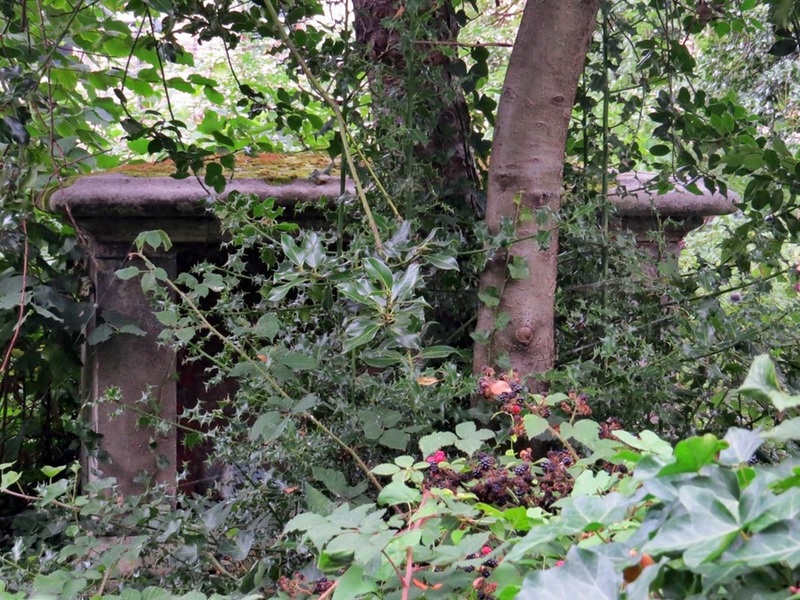 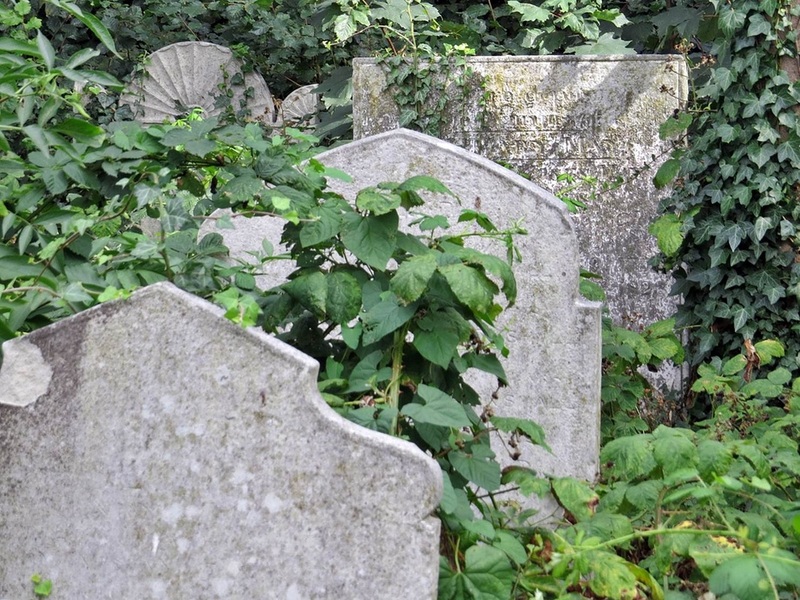 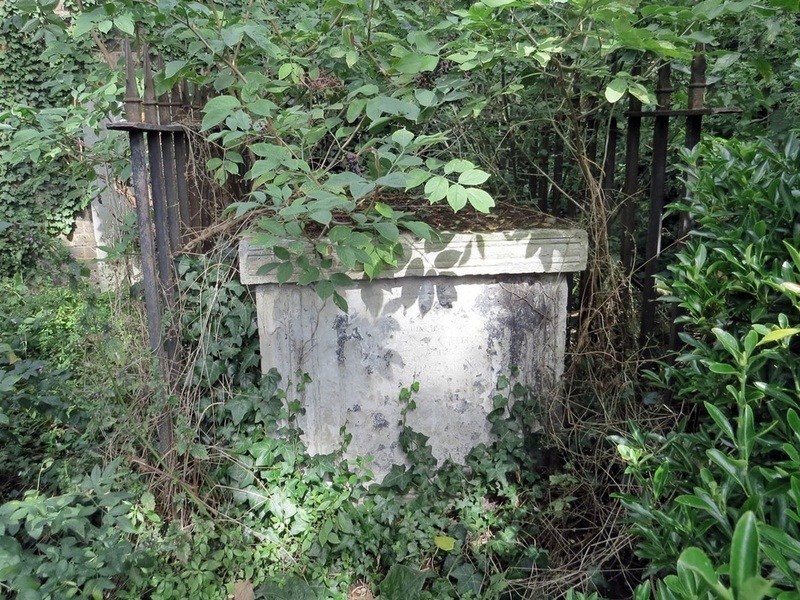 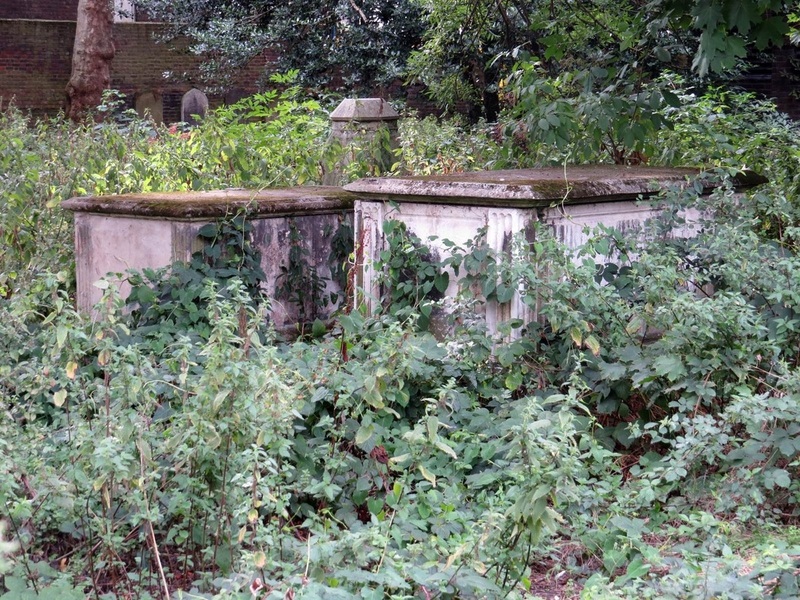 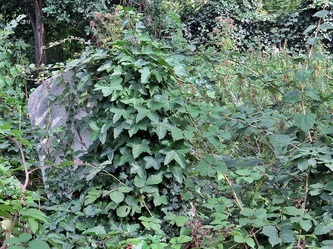 London has so many hidden and pretty much forgotten and in some cases, abandoned, burial grounds. 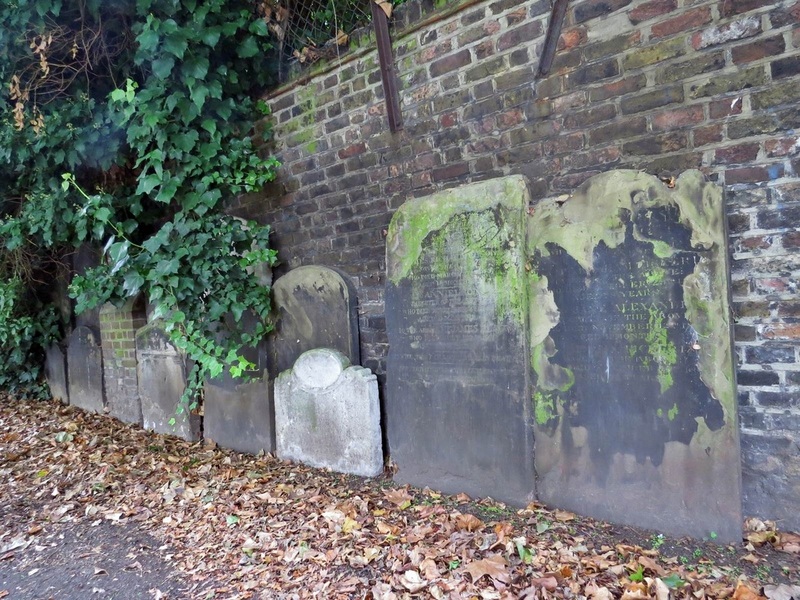 You may be familiar with one or two of these but most of you will find a few in this section that you are not familiar with. 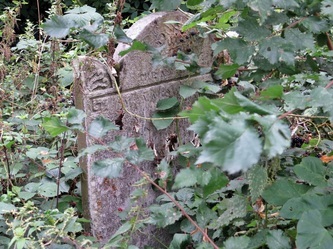 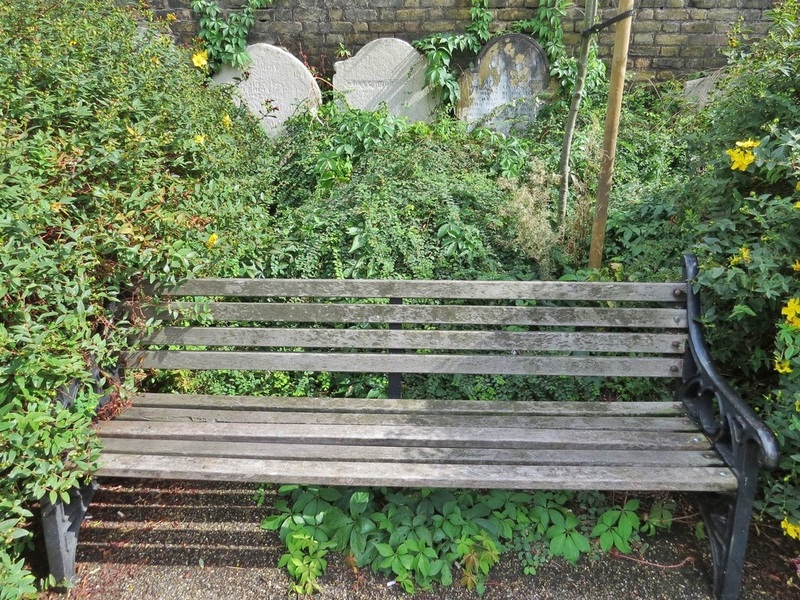 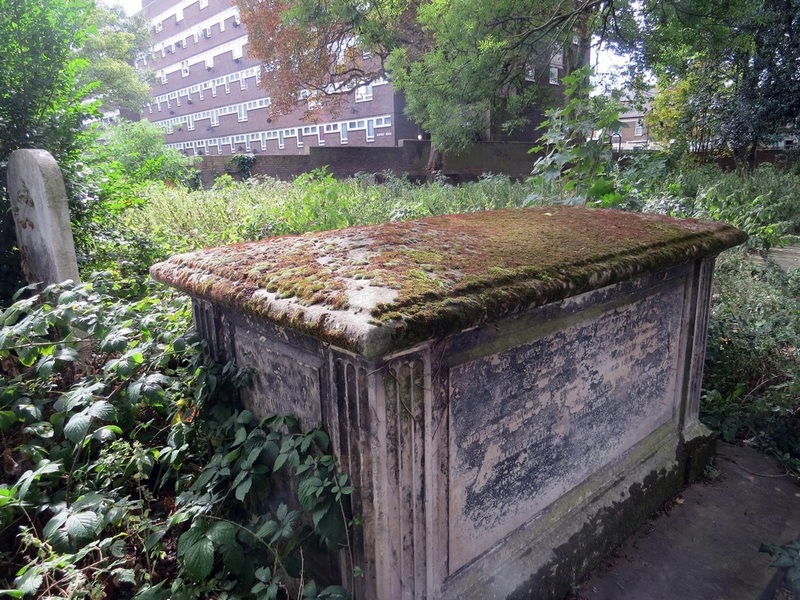 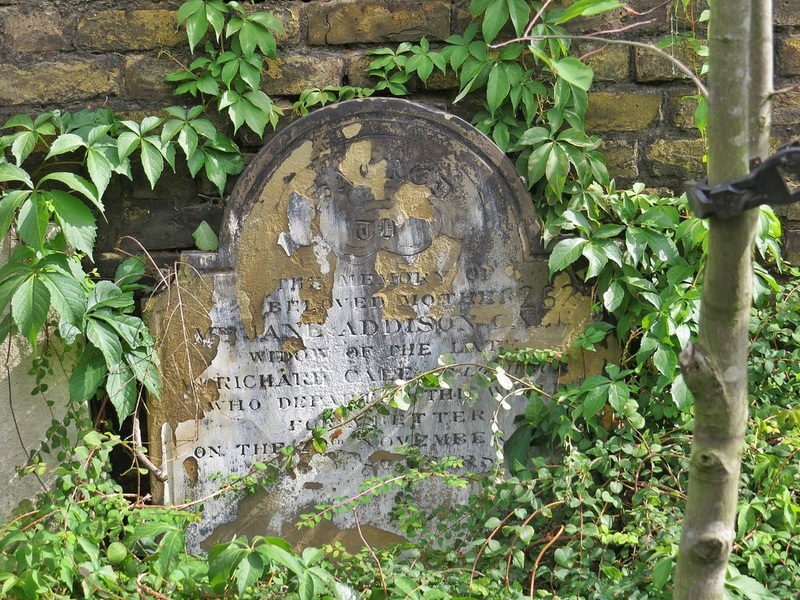 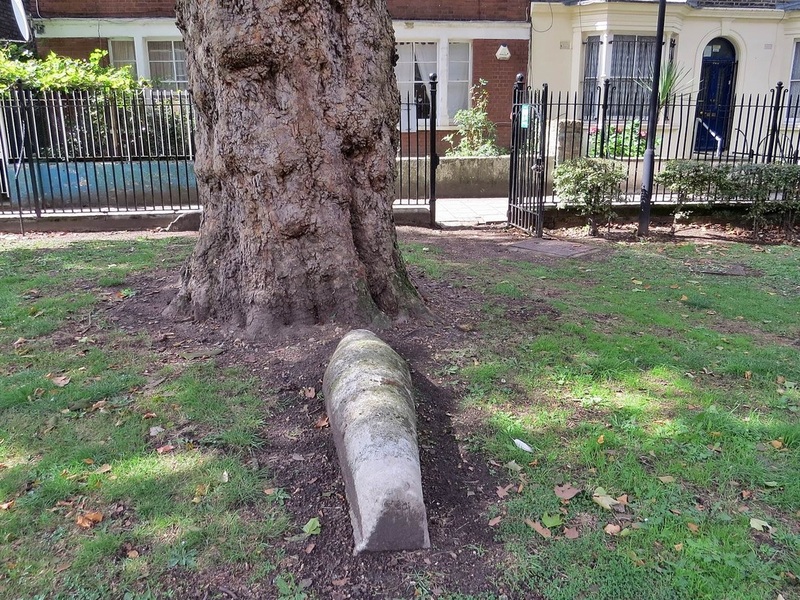 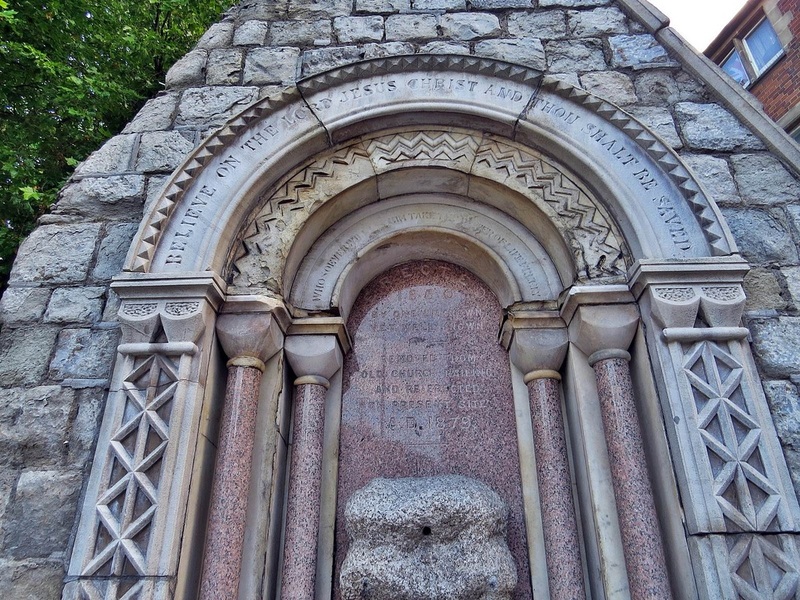 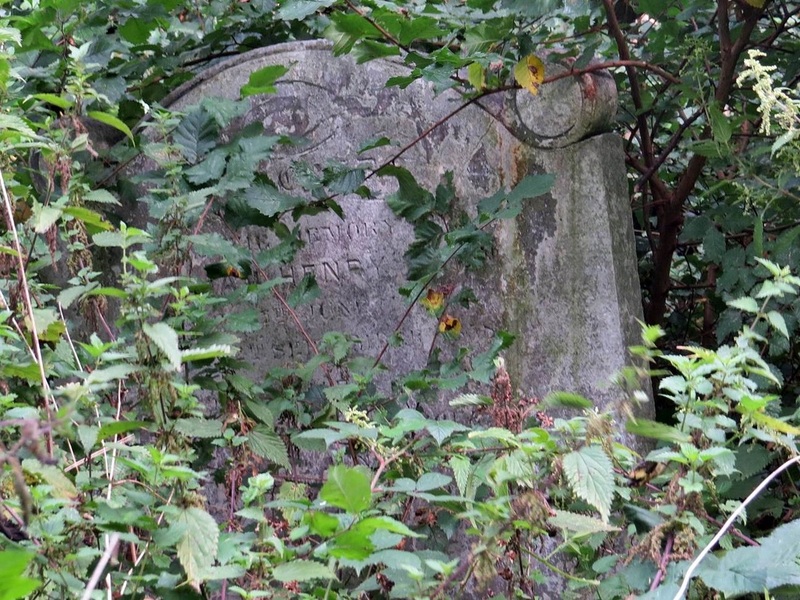 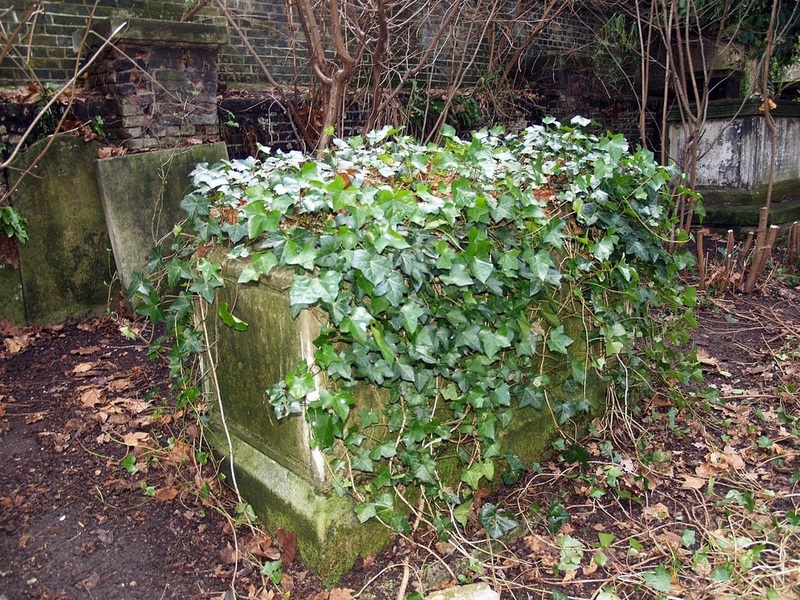 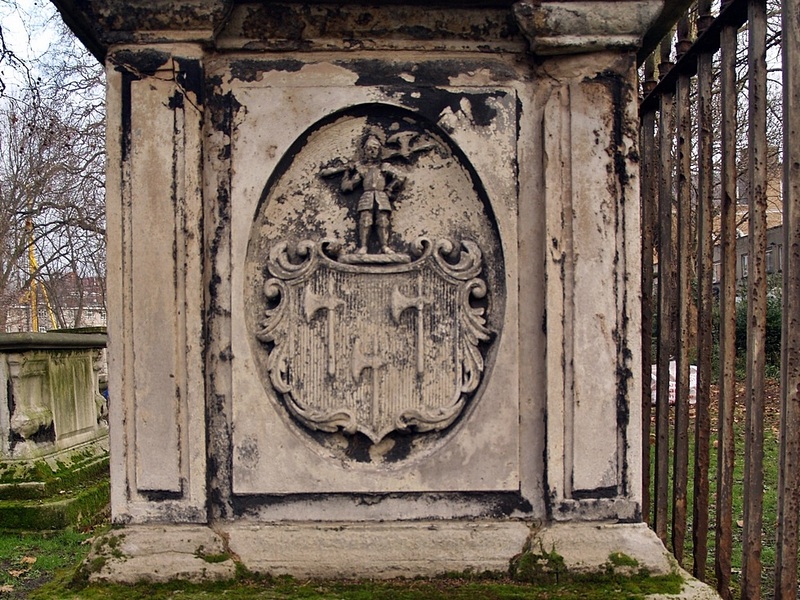 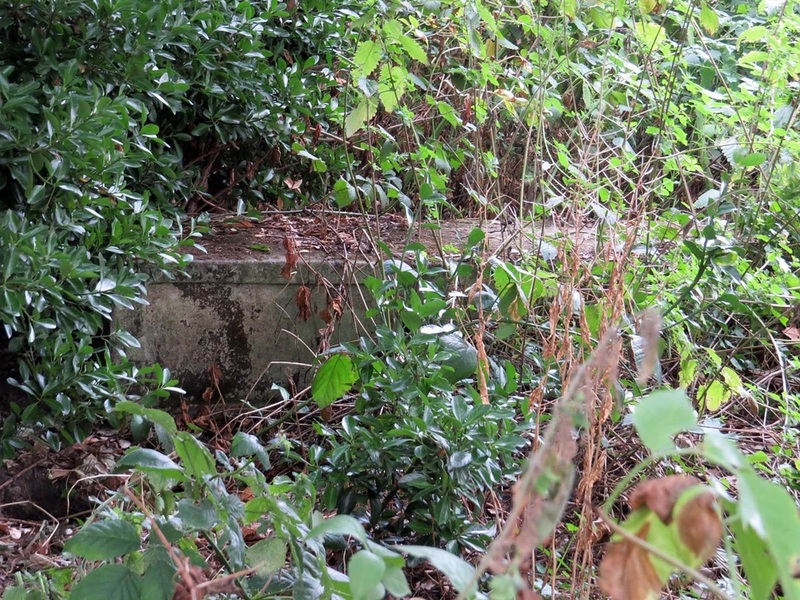 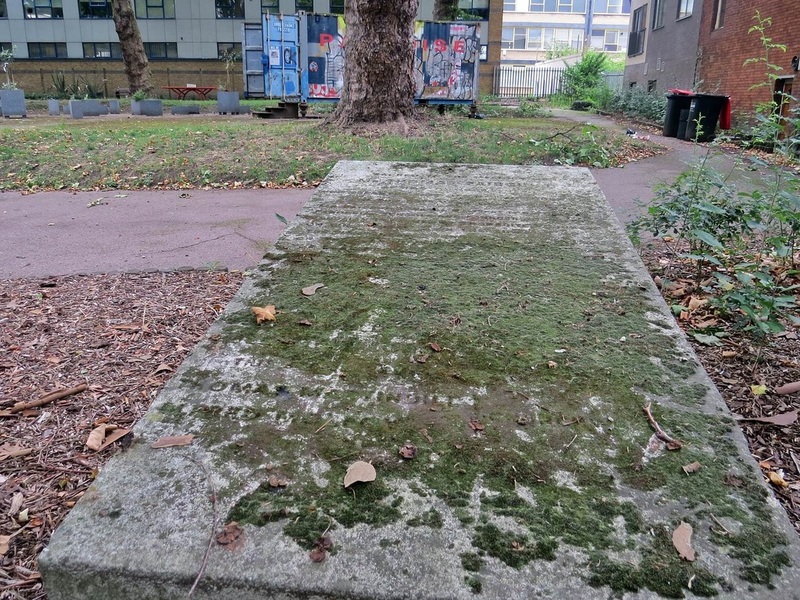 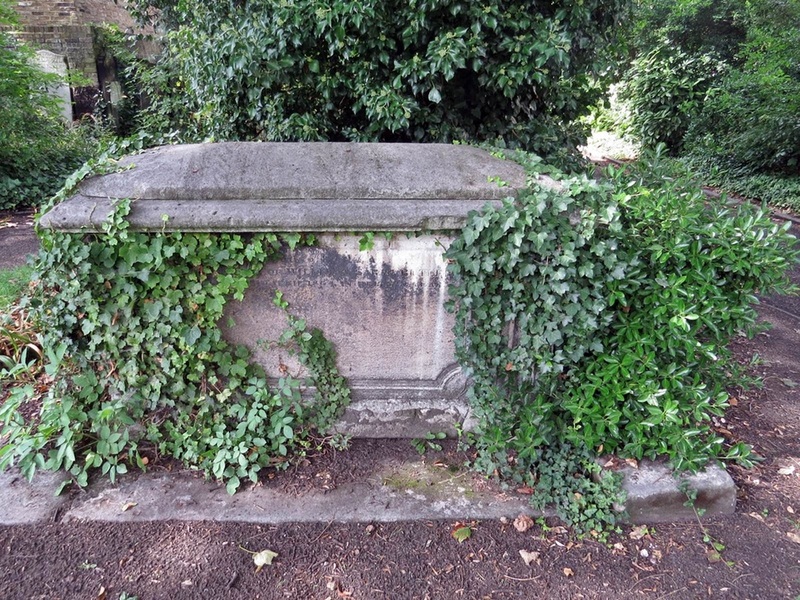 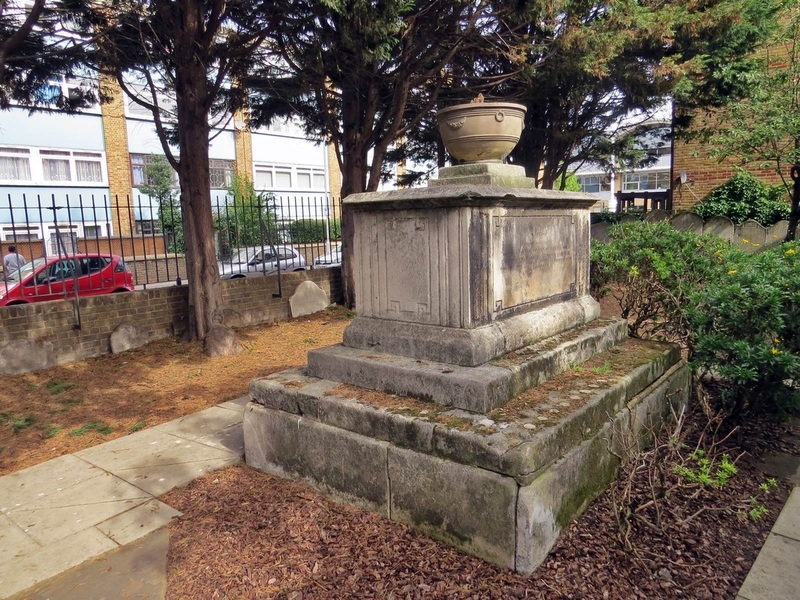 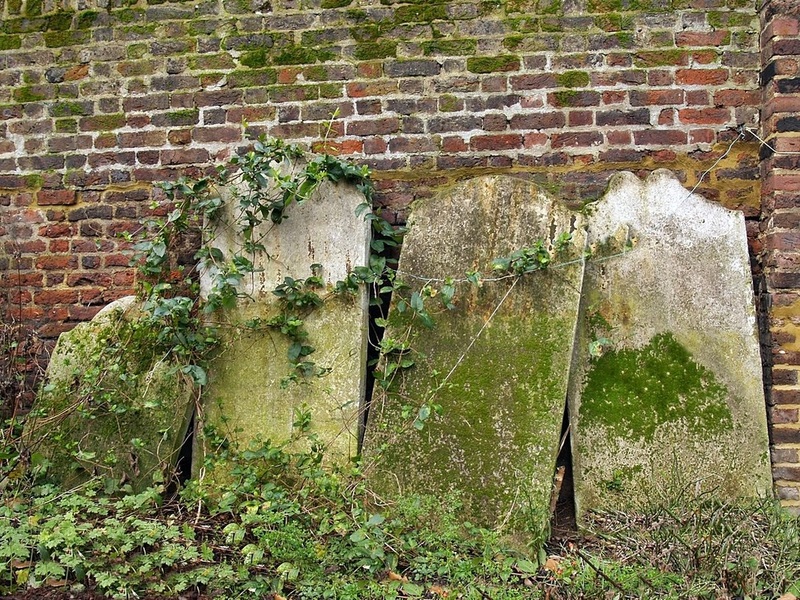 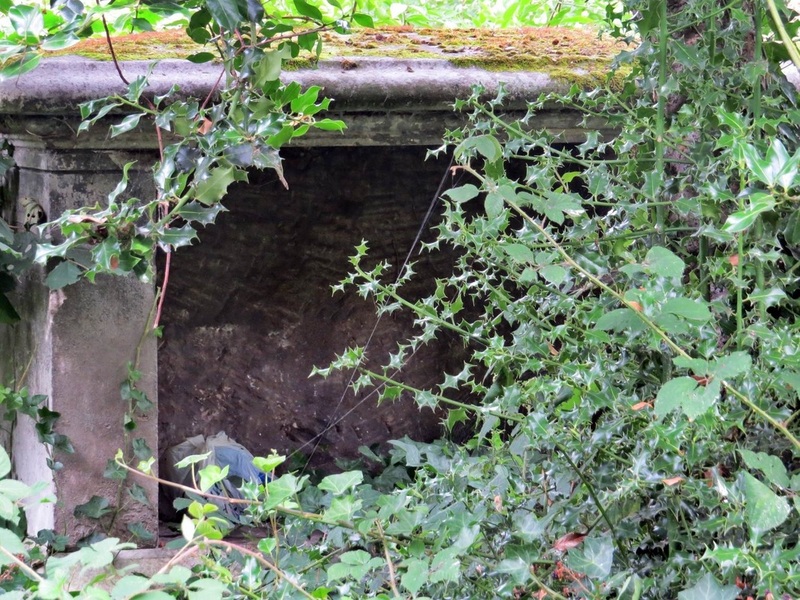 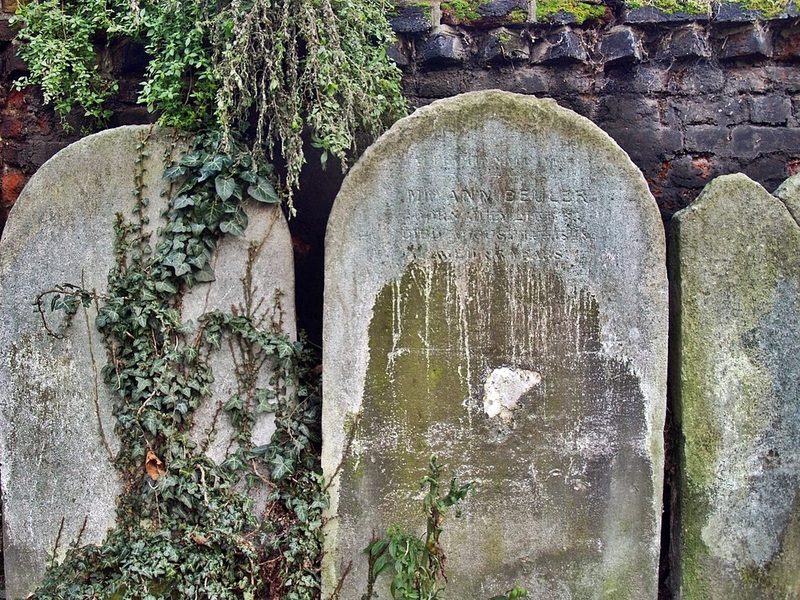 This is a collection of sites no longer used for burials that I have stumbled upon on my wanderings around London and is not a comprehensive guide to lost or hidden burial grounds as there are hundreds more to be found. 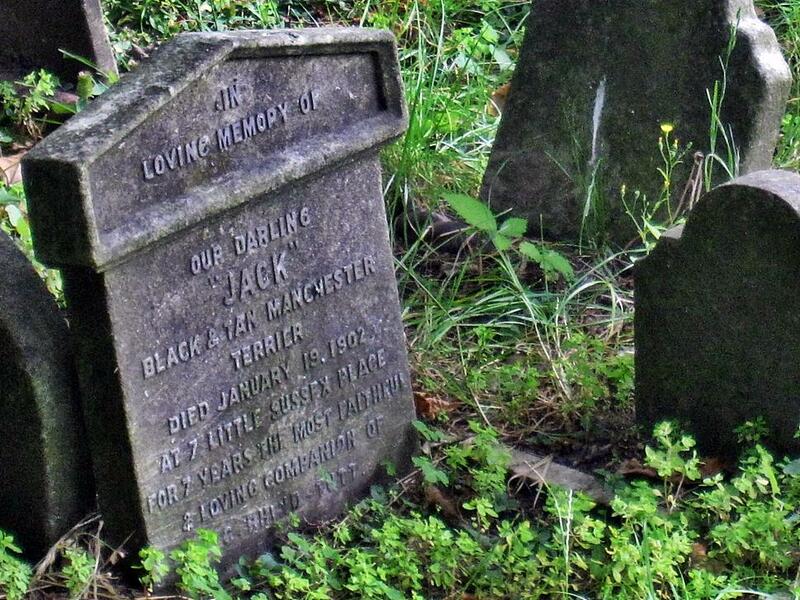 I am aware of many of these and shall be updating this page with more sites over the coming months. 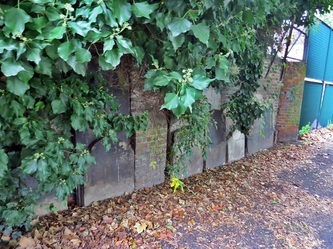 I am aware that there is a thin line between some of the subjects on this page and my Derelict London Cemeteries & Churches page. 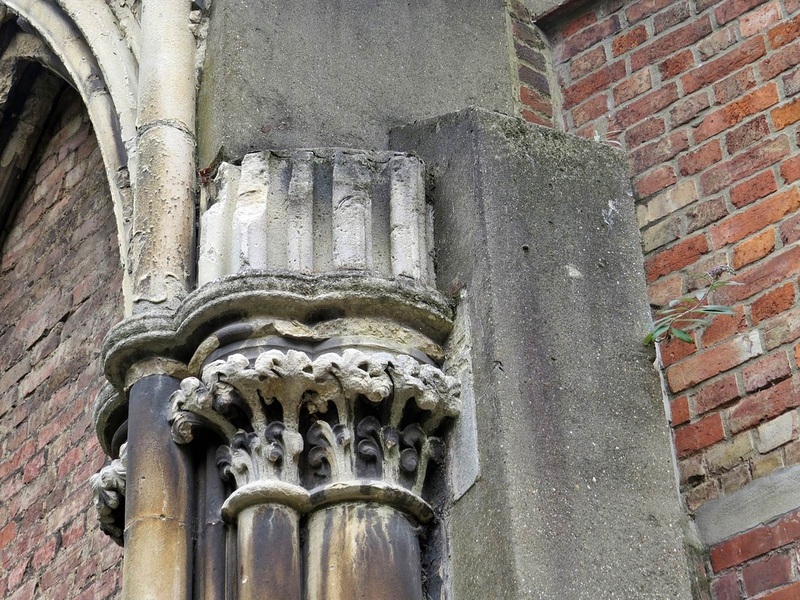 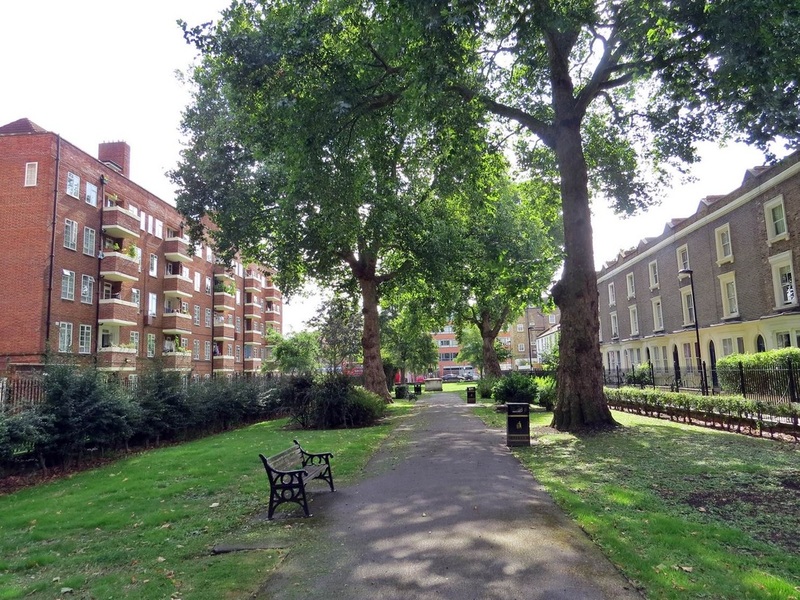 Enemy action during World War II virtually destroyed Poplar. 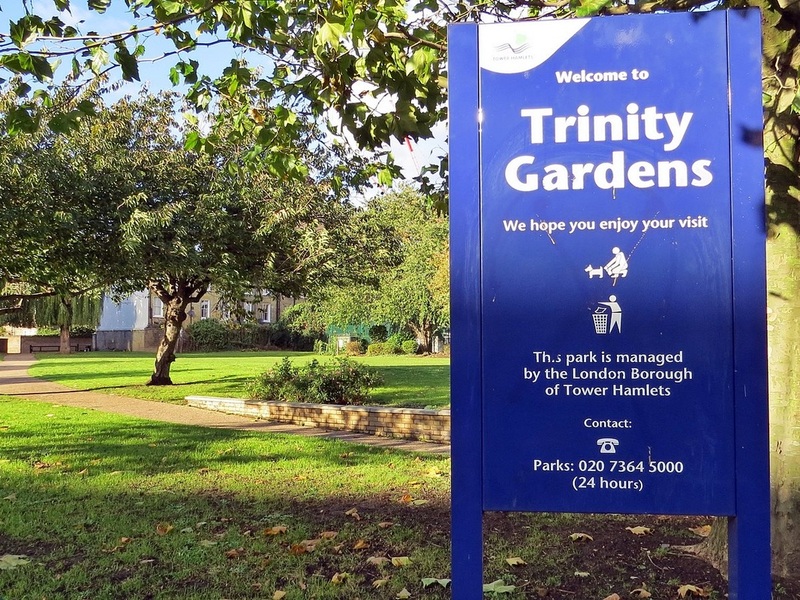 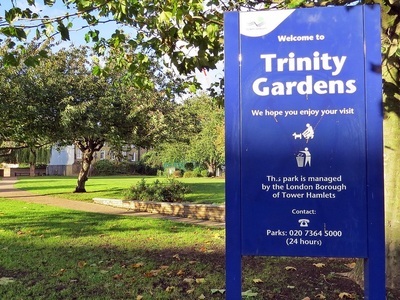 After the War some of the bombed ruins were made into a park, Trinity Gardens, and became part of the Lansbury Estate. This formed part of the live architecture exhibition of the 1951 Festival of Britain. 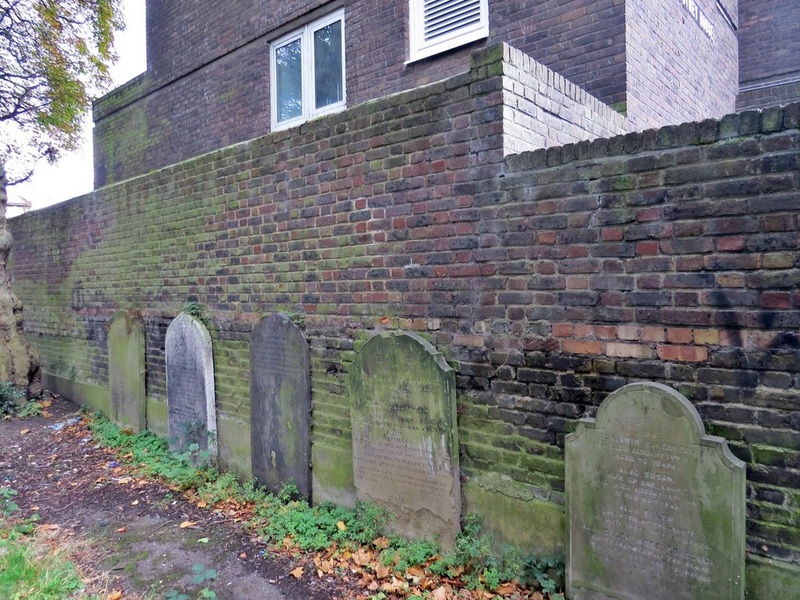 The very back of Trinity Gardens used to be part of a graveyard of the Trinity Congregational Chapel (whose original building was also destroyed during the war). 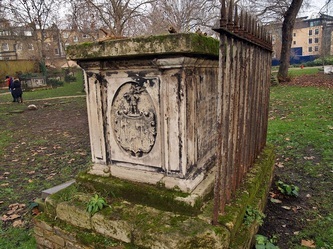 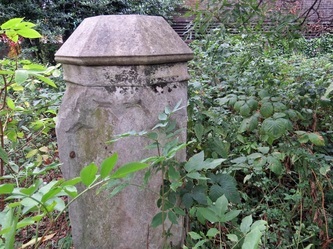 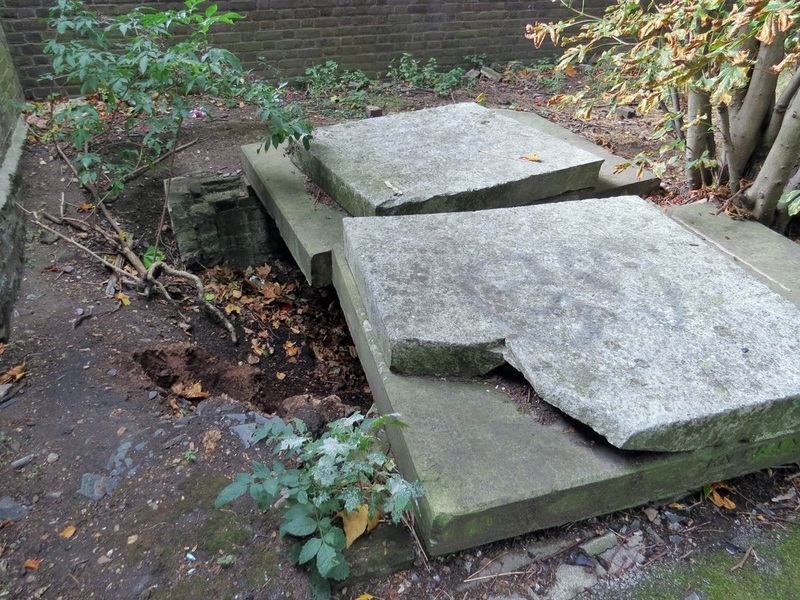 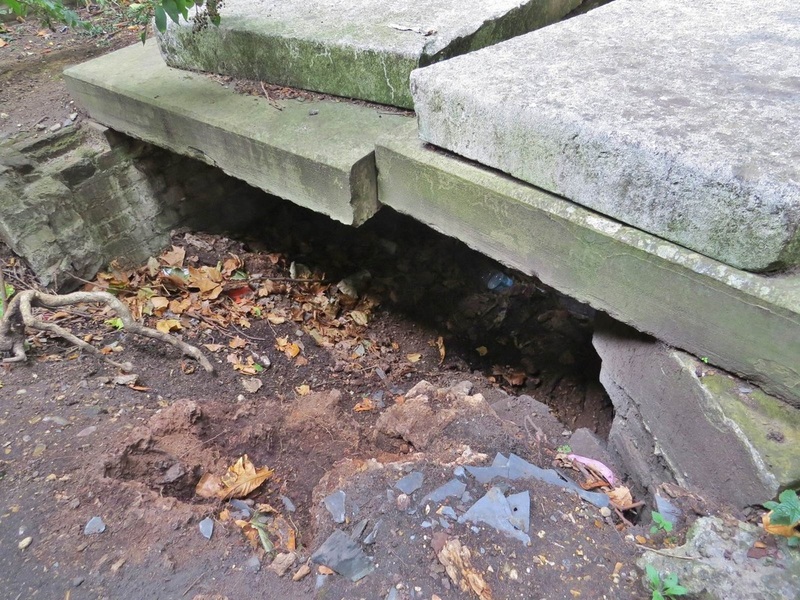 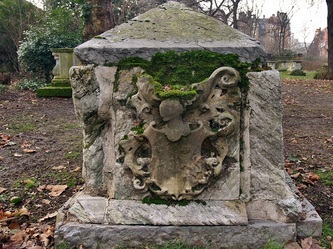 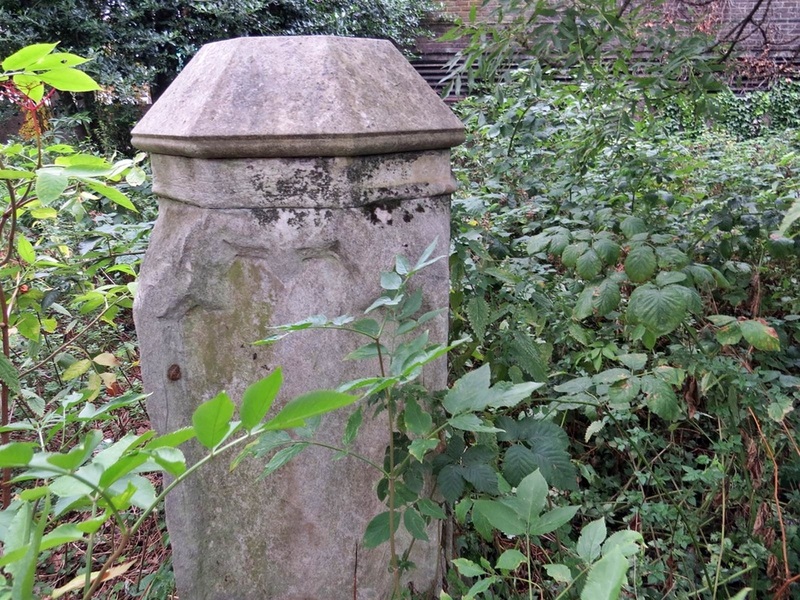 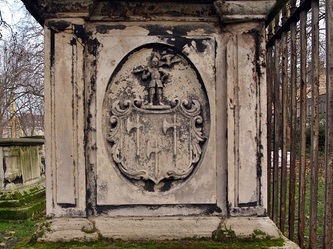 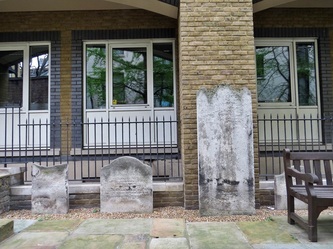 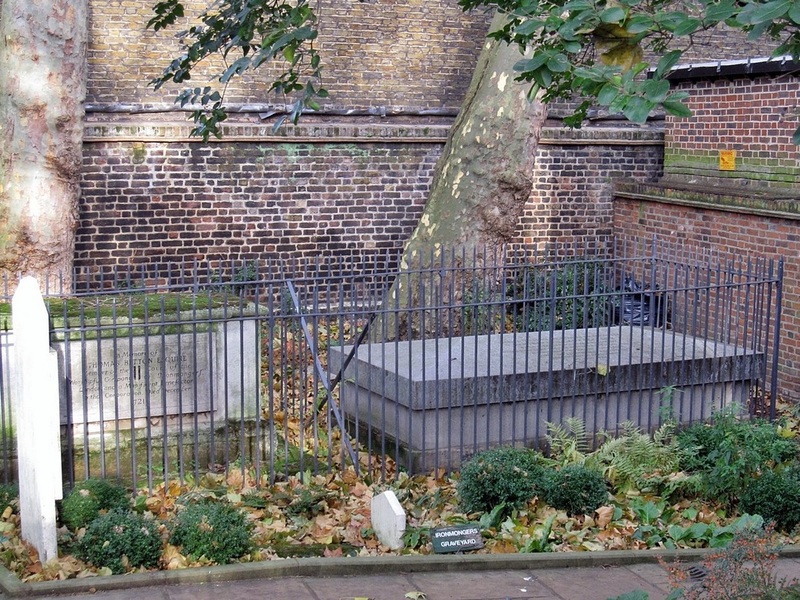 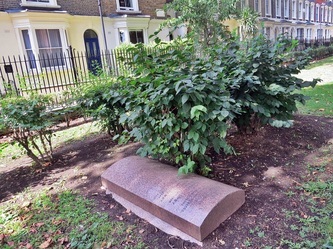 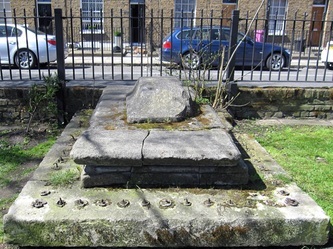 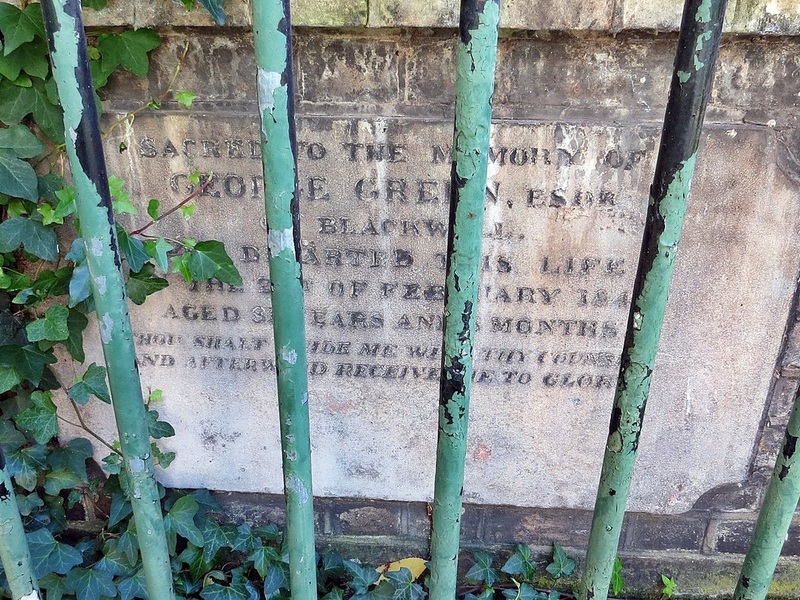 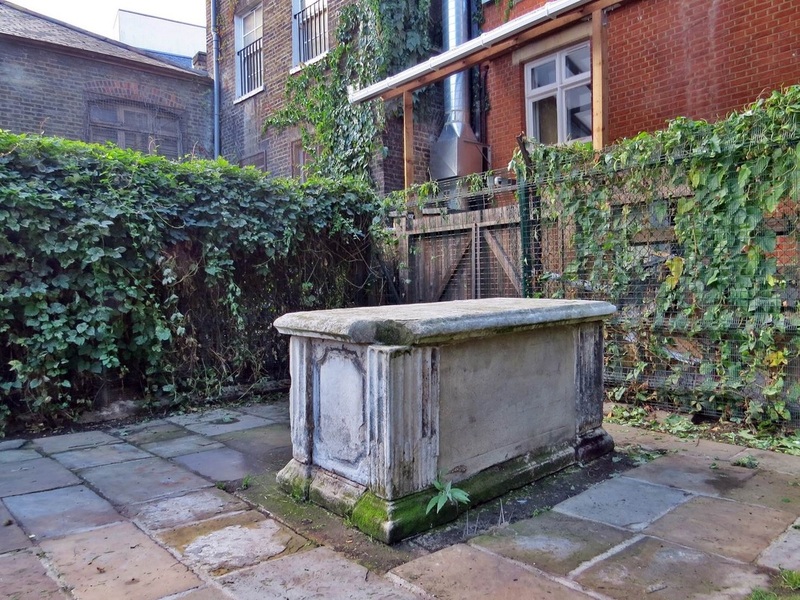 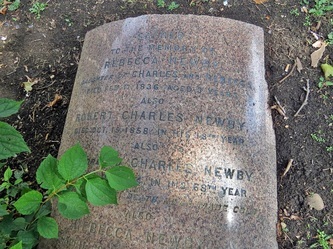 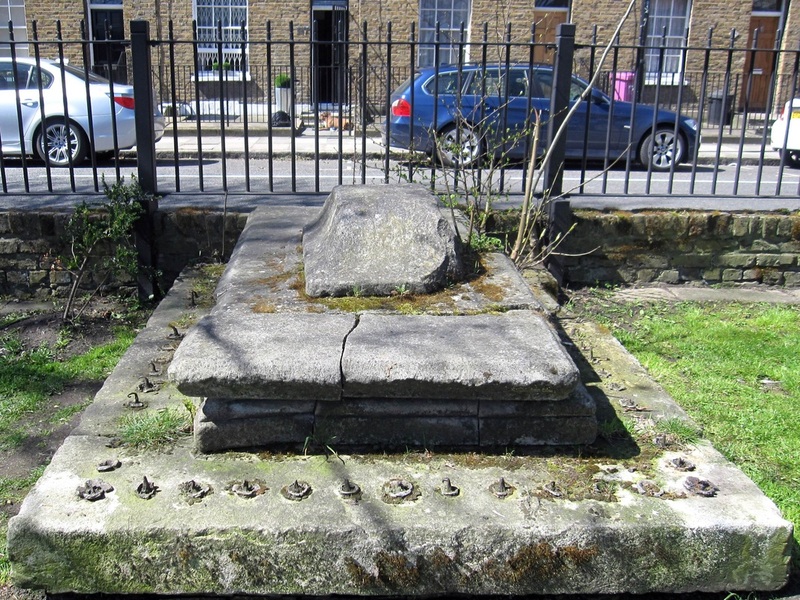 All the remaining monuments in the old Trinity churchyard were removed, except for the table tomb of George Green, which was repaired and kept. 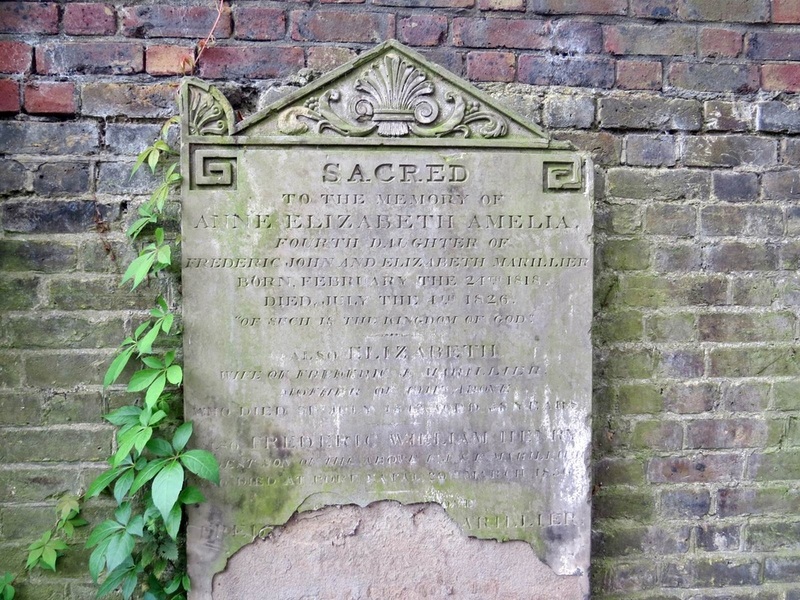 George Green (1767-1849) was a shipbuilder of the Blackwall Yard who funded a number of schools in Poplar as well as the adjacent chapel. 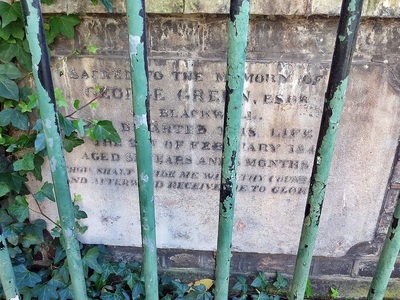 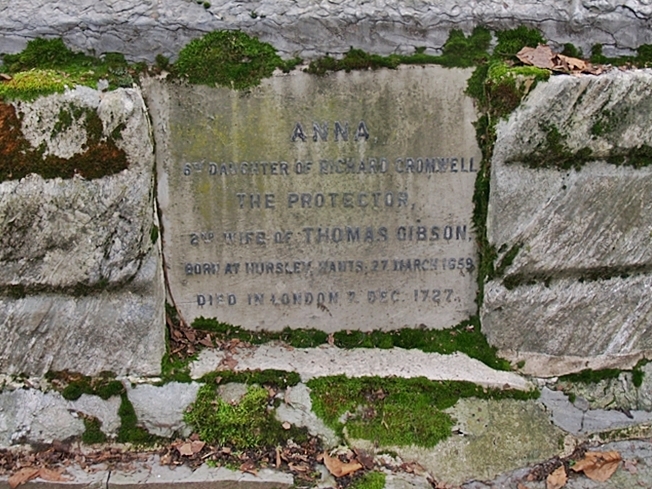 The tomb bears memorial inscriptions not only to Green himself but also to his wife, Elizabeth, and son, Richard. Unfortunately the tomb is now looking in a sorry state. 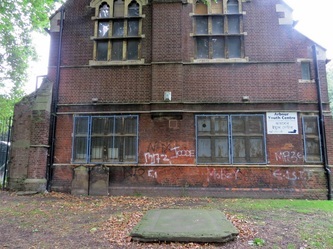 There is a statue (built 1866) of Richard Green, at the front of the derelict Poplar Baths. 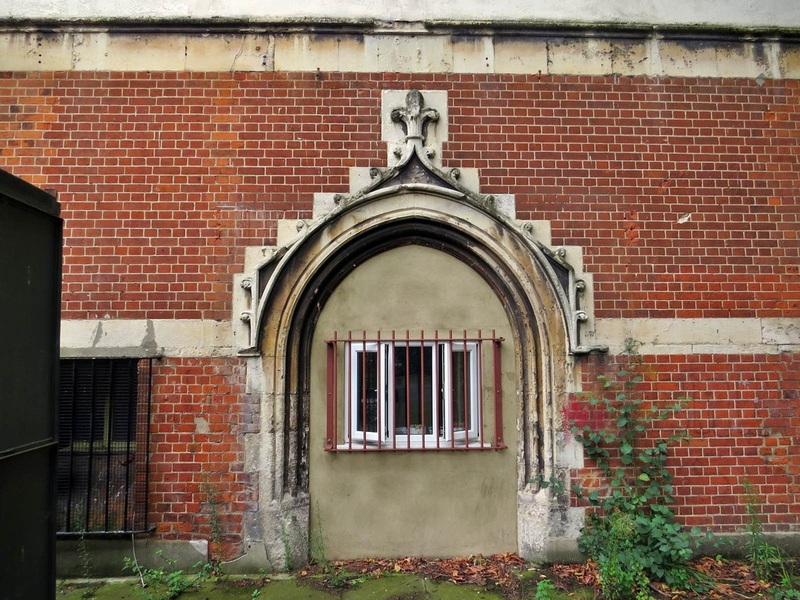 Now this is a quirky one. 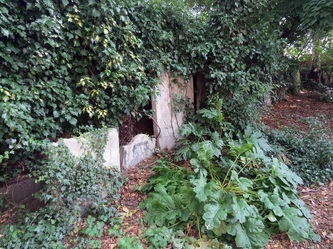 Its not really lost or derelict its just hidden away in someone's back garden so not accessible to the general public. 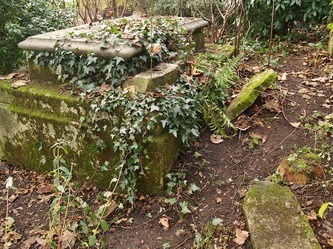 In 1881 the keeper of Victoria Lodge buried a local family's pet dog (who loved walking in the park) in his back garden. 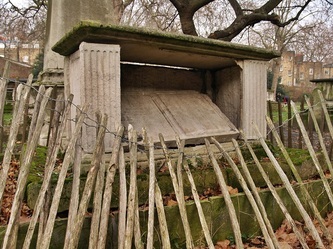 The idea caught on with other locals and very soon it unofficially became a cemetery often for dogs who came to their end after being trampled by horses and their carriages in Hyde Park such as a terrier belonging to the wife of HRH Prince George, Duke of Cambridge. 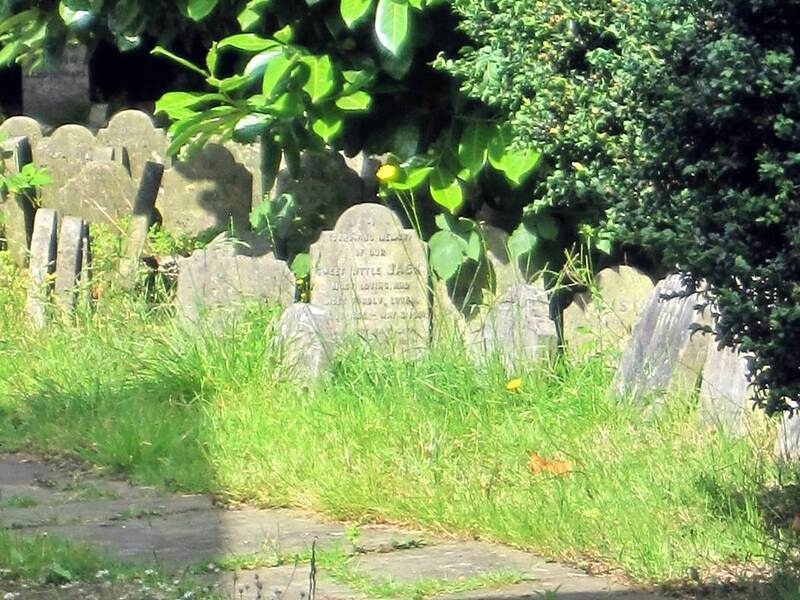 There are over 300 little graves here - mainly dogs but a few cats, birds and a monkey.The cemetery is mentioned in the Little White Bird novel by J. M. Barrie and "The Optimists" with Peter Sellers had scenes filmed here. George Orwell is reputedly to have described the cemetery as perhaps the most horrible spectacle in Britain. 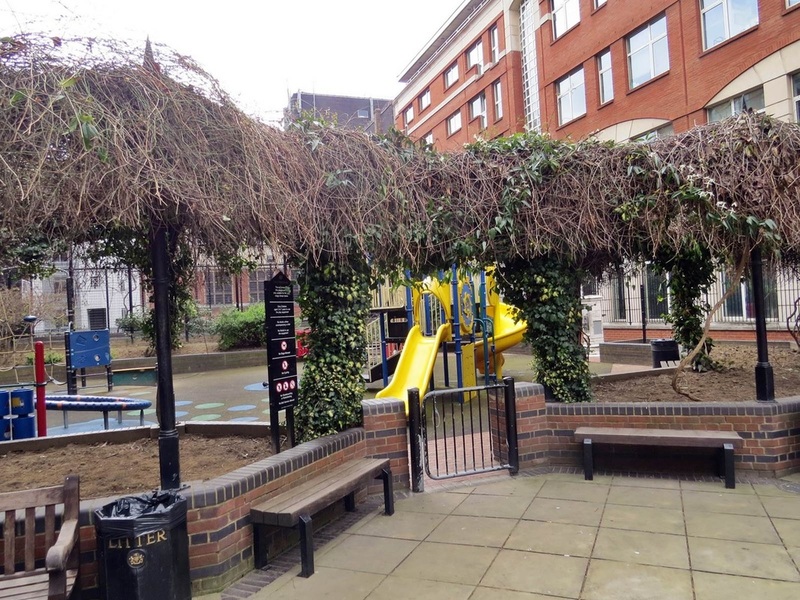 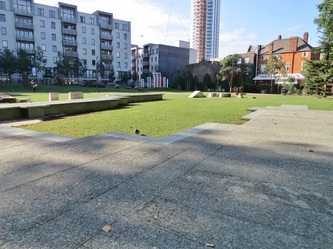 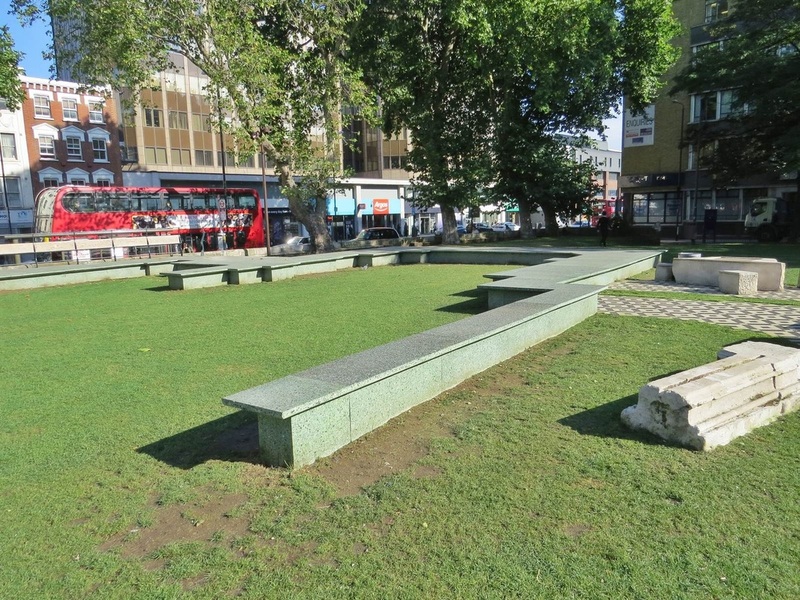 Altab Ali Park is a small park on Whitechapel High Street, formerly known as St. Mary's Park. 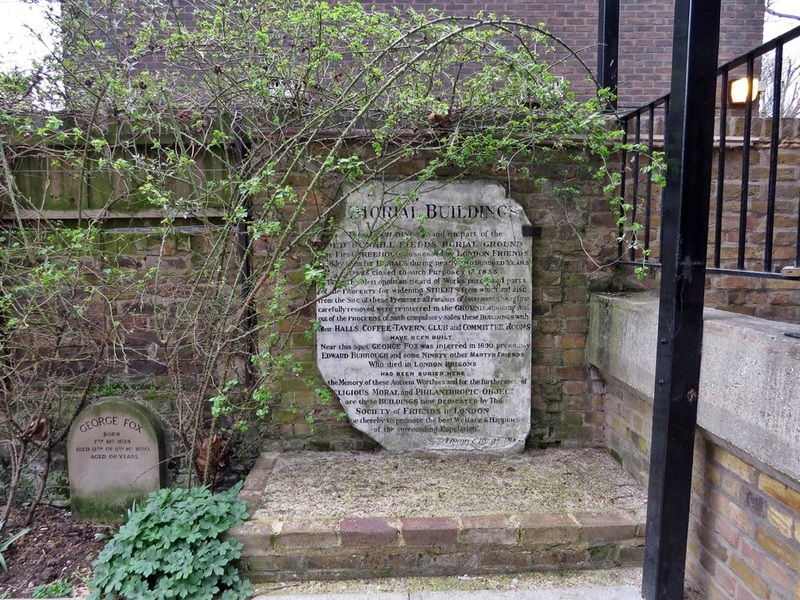 It is the site of the old 13th Century white chapel constructed from Kentish chalk from which the area of Whitechapel gets its name. It was rebuilt as St Mary Matfelon in the 14th Century and again in the 17th (but this time in red brick) and once again in 1875 but damaged by fire five years later so demolished and rebuilt again from scratch. It was badly damaged in The Blitz in 1940 after laying derelict it was struck by lightning in 1952 and the building was demolished, this time forever and was known as St Marys Park. 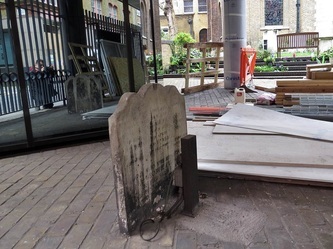 All that remains of the old church is the floor plan and a few graves. 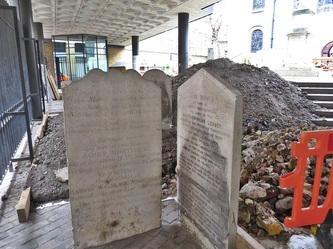 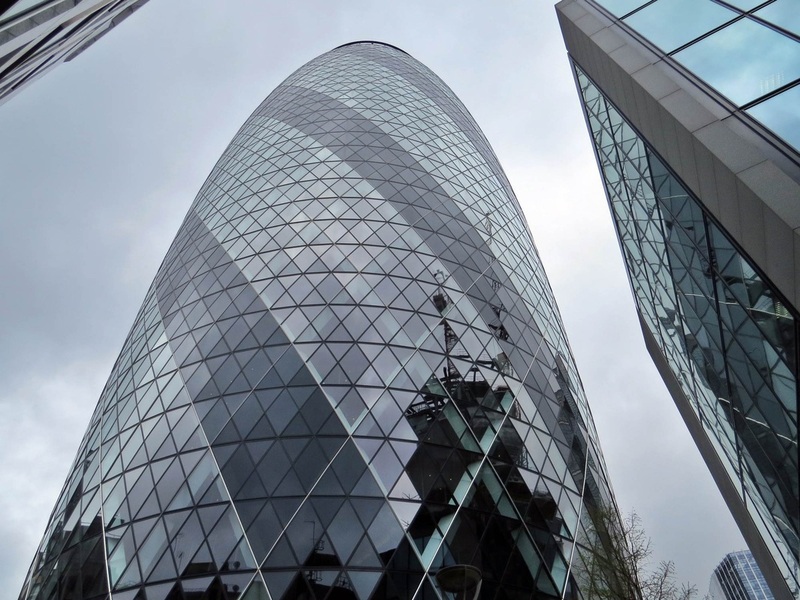 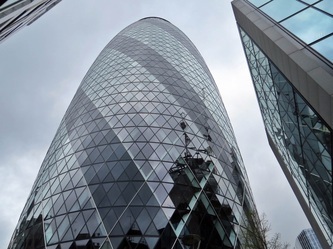 In 2012 an archaeological dig was undertaken by the Museum of London and various artifacts and remains of the old churches dating from 1673 were unearthed. 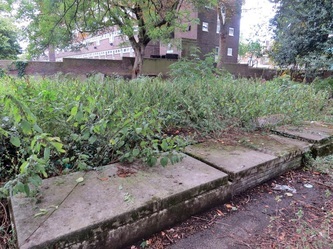 The footprint of the last church to stand on this site is traced by the raised walkway in the park. 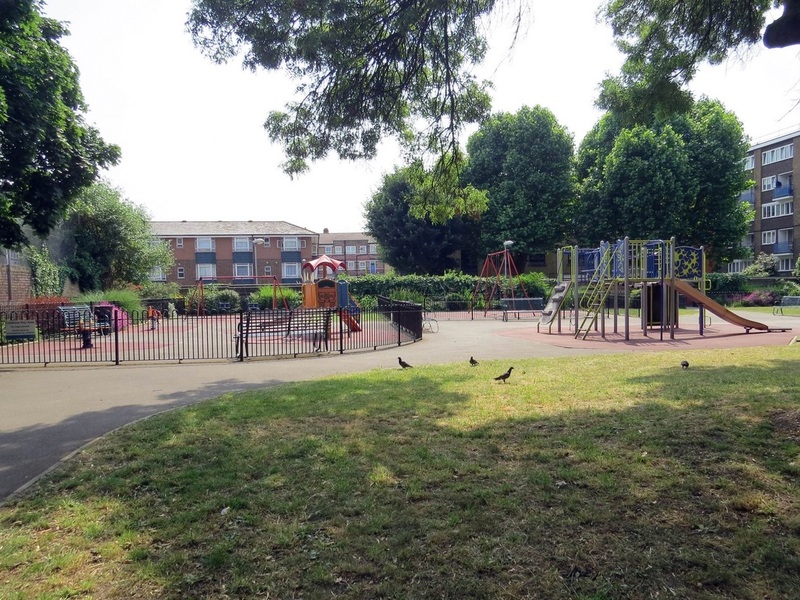 The park was renamed Altab Ali Park in 1998 in memory of Altab Ali, a 25-year-old Bangladeshi clothing worker, who was murdered in 1978 nearby by three teenage boys as he walked home from work. 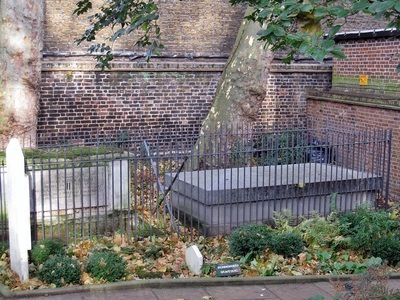 Richard Brandon the alleged executioner in 1649 of King Charles 1 is buried in these grounds. Sir John Cass an East End philanthropist who died in 1718 is also buried in this graveyard. 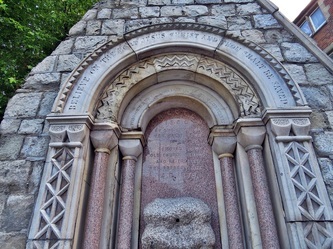 One of the trusts he established - the Building Crafts College carved the white stone plinths in this park in 2011. 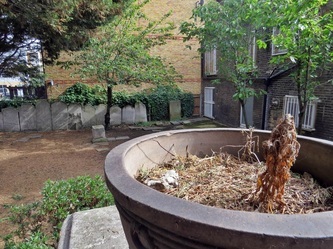 The Gentlemen's Magazine in 1850 observed "the churchyard is now planted with evergreen & deciduous shrubs & trees. 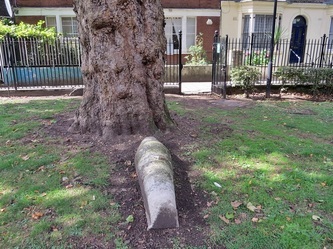 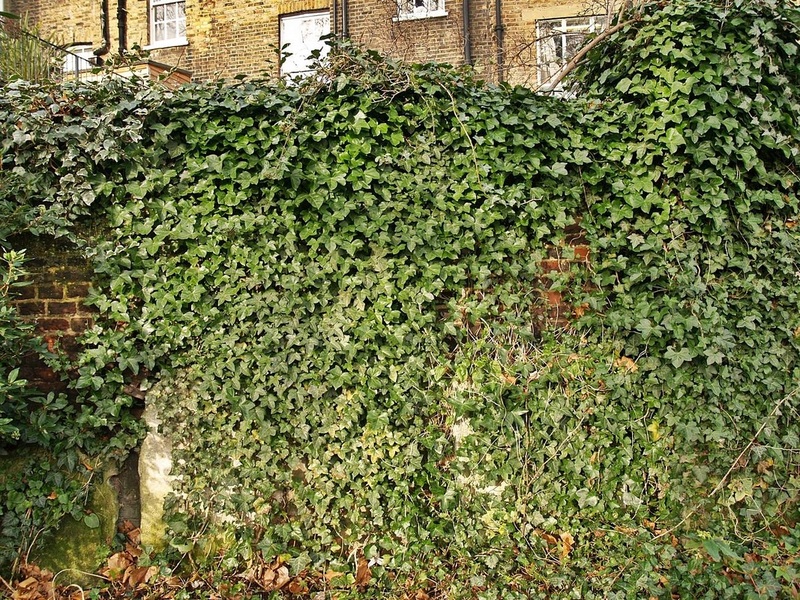 As it is a well ascertained fact that trees convert the noxious gases given off by the decomposition of the body, we hope this laudable example will be followed"
The Geffrye Museum in Shoreditch is set in the former Geffrye's Almshouse of the Ironmongers' Company. 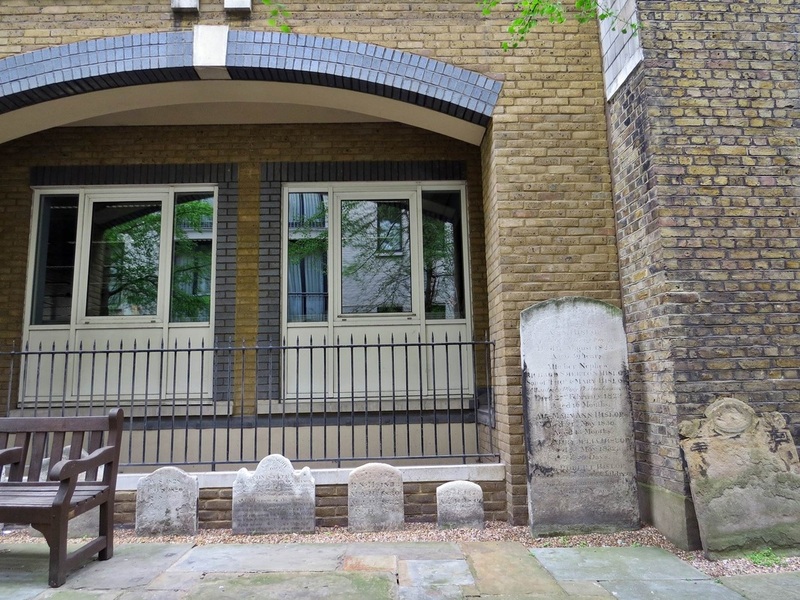 Built between 1712-14, the Geffrye Almshouses were one of the largest charitable foundations for the aged in London, and were built as directed by the will of Sir Robert Geffrye, Lord Mayor of London in 1685/6 and twice Master of the Ironmongers' Company (one of the Livery Companies of the City of London).In the gardens is the small Ironmongers' Graveyard where lie the remains of Sir Robert and Lady Geffrye. 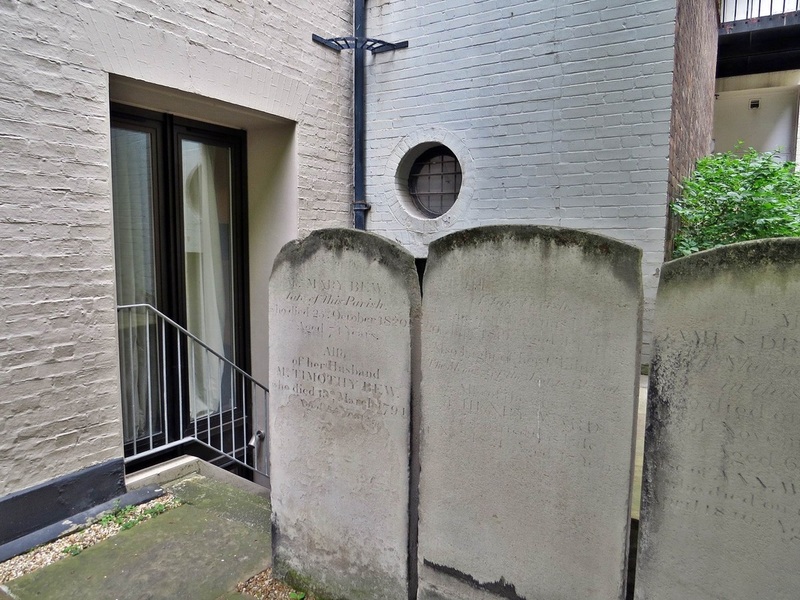 The burial ground also contains tomb for Thomas Bethon (a benefactor and member of the Ironmongers' Company) & one for Maria Chapman (a onetime matron of the Almshouses) plus a few various memorials set into the wall. 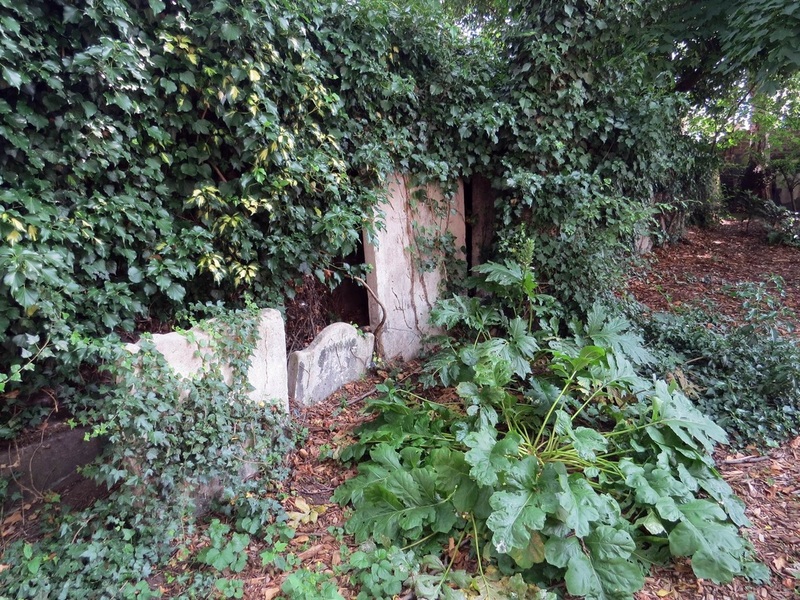 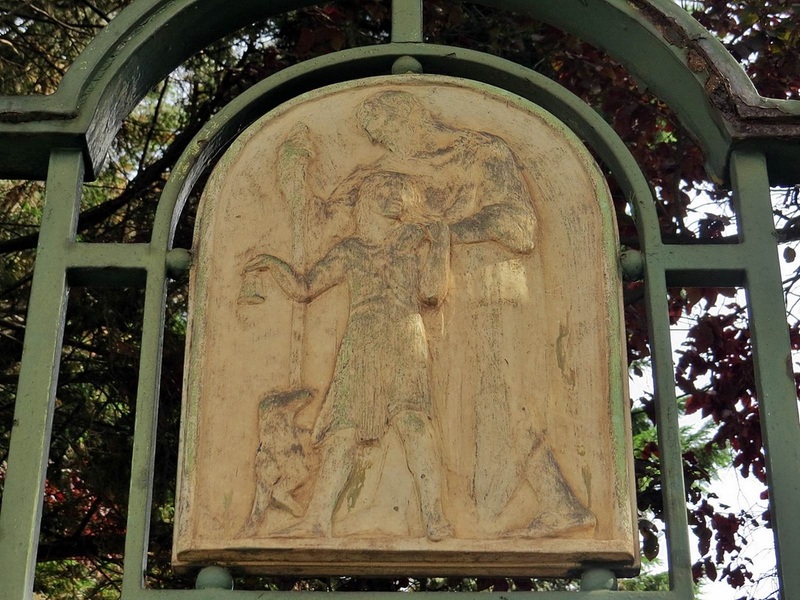 I recently stumbled upon this little park with its dilapidated remains of a burial ground and a terracotta figure which once decorated the facade of a pub. 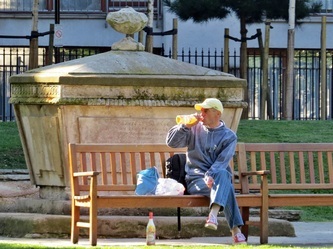 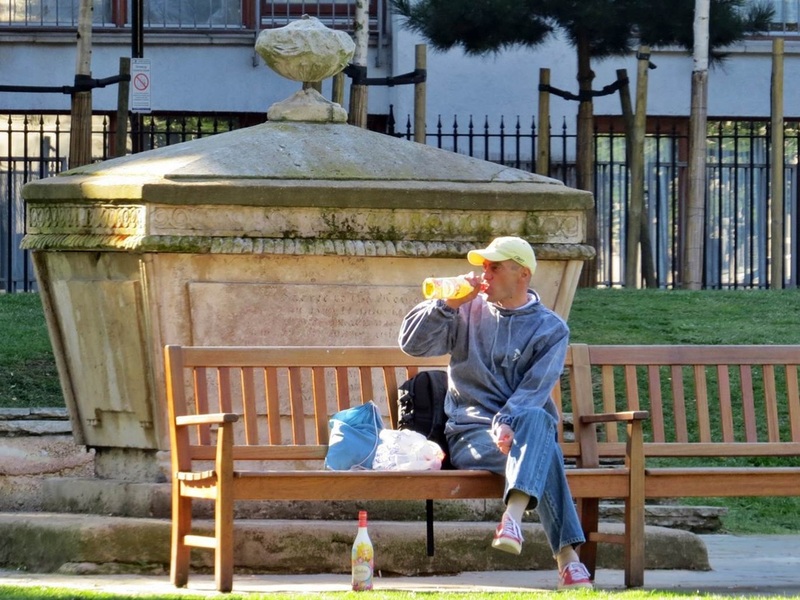 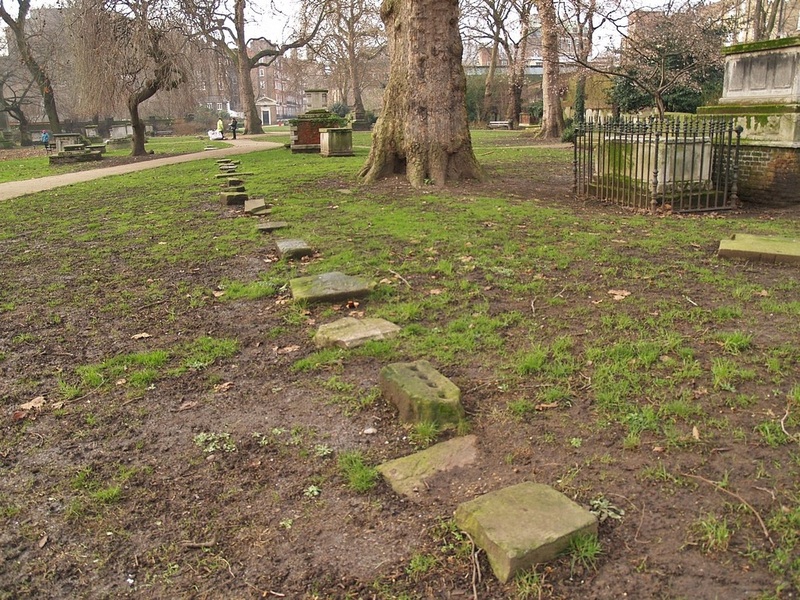 St George's Gardens was one of the very first burial grounds to be established away from a church. 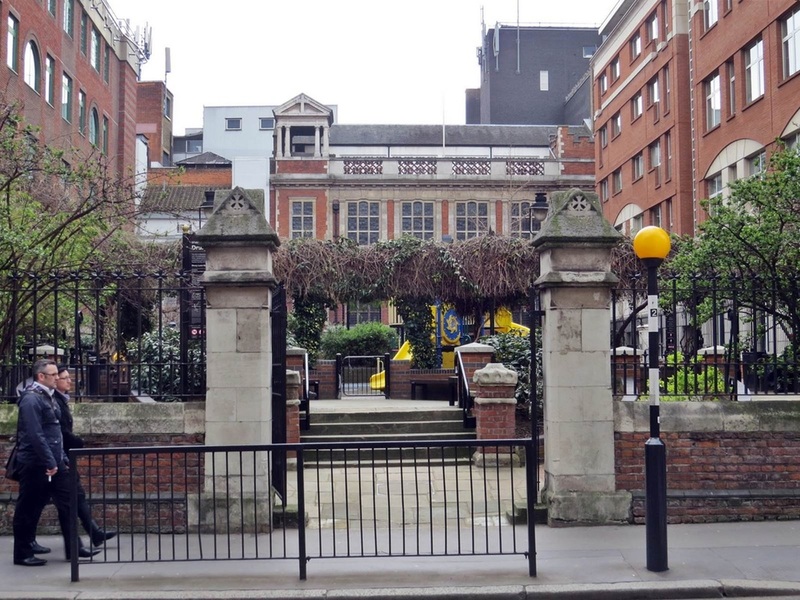 The land was bought in 1713 to serve the parishioners of two churches, St George the Martyr, Queen Square and St George, Bloomsbury. 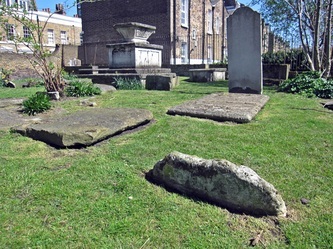 The plot was in an open field divided in two by stones demarcating the two parishes. The most famous tomb here is of Oliver Cromwell's grand-daughter. 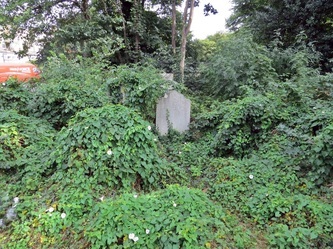 The few monuments still standing represent the many hundreds of people buried in unmarked graves in this space. 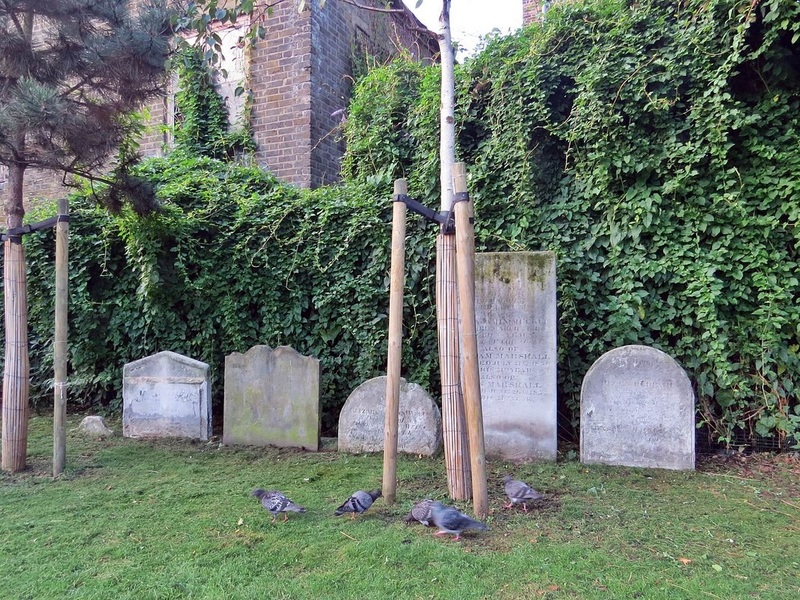 More than a dozen Jacobites were hanged, drawn and quartered in 1745 on Kennington Common and their headless bodies were buried here. Also, It was here in 1777 that the first indictment for stealing a body for dissection arose. 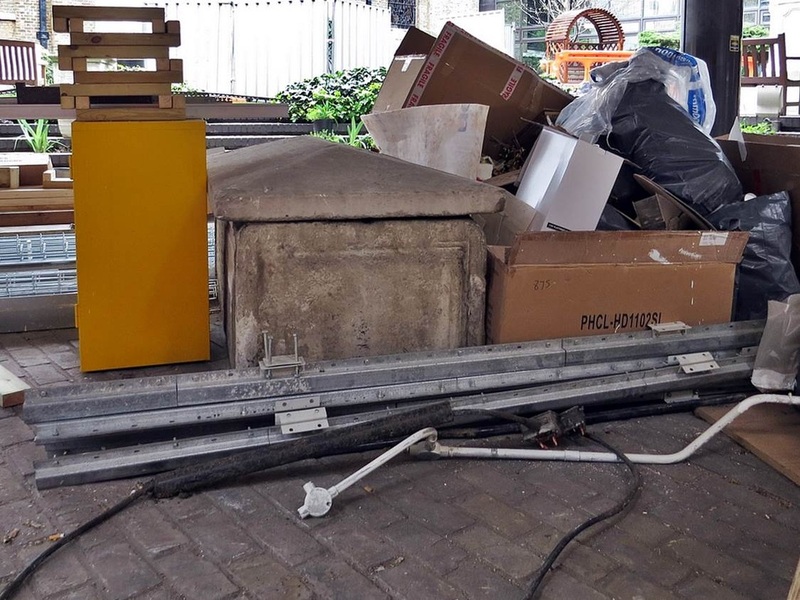 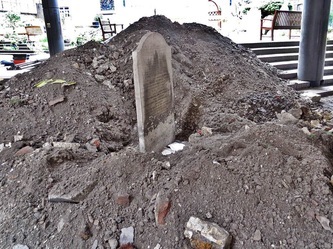 A gravedigger was charged with stealing the body of a woman after he was caught carrying her in a sack down a nearby street. 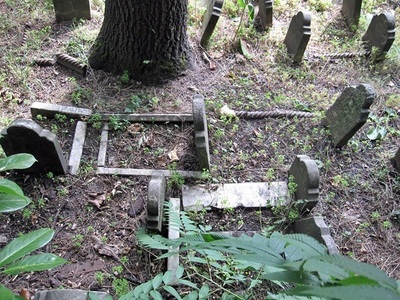 By the early 1800s the burial ground was already in a very bad state and by 1855 the overcrowding was such it finally closed. 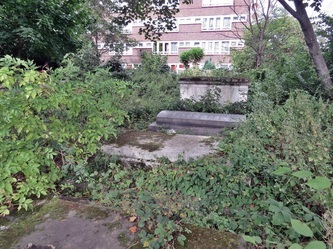 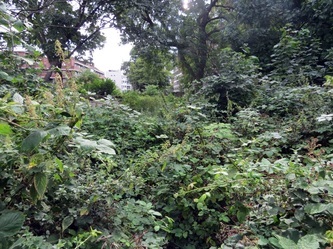 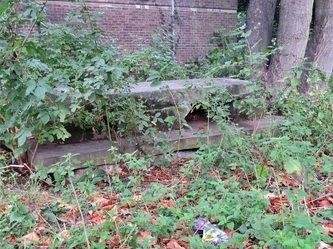 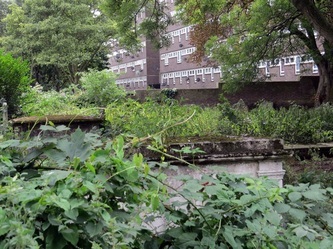 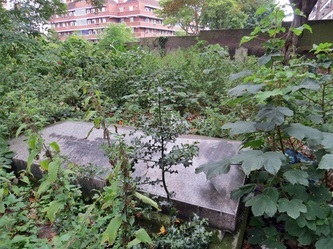 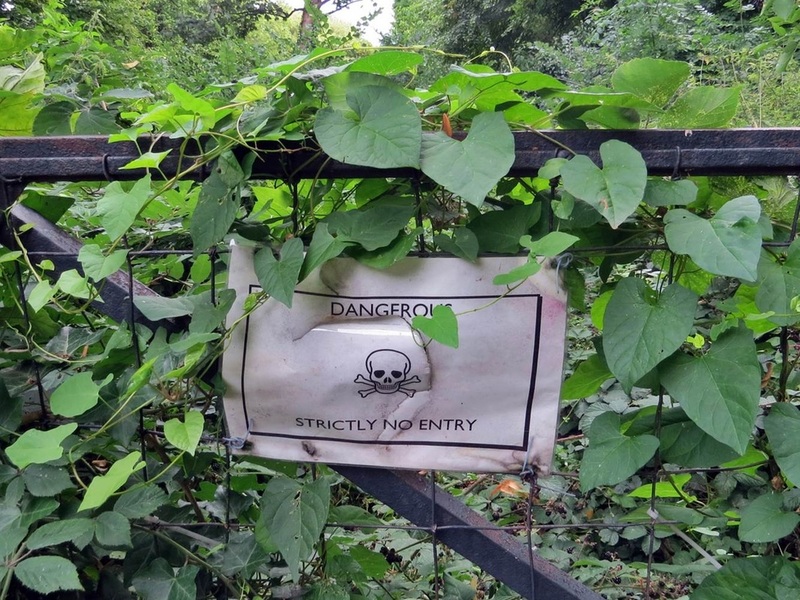 Thirty years later it was reopened as a public garden as part of a movement aimed to make many overgrown urban graveyards into "open air sitting rooms" for the poor. 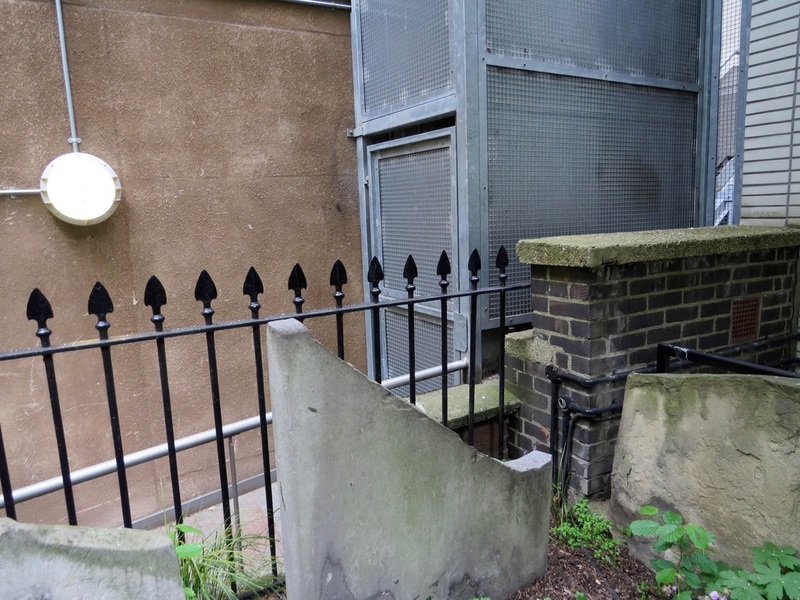 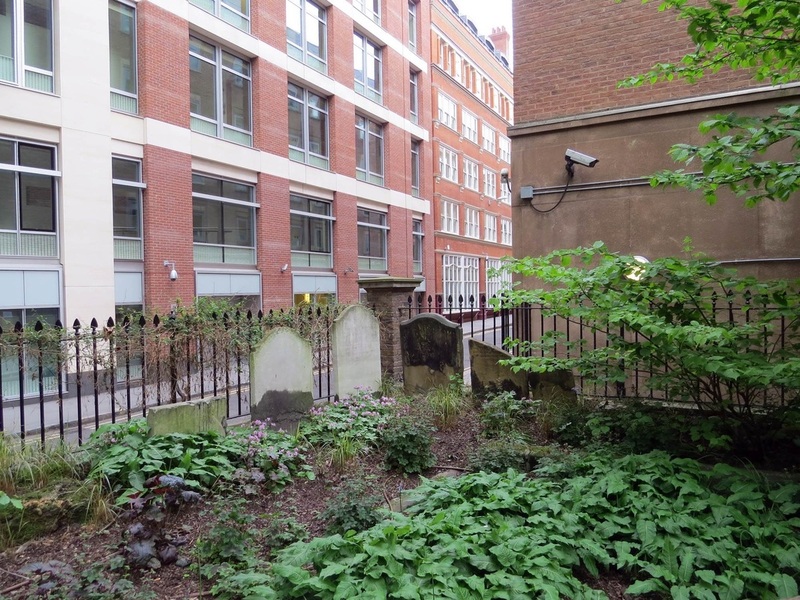 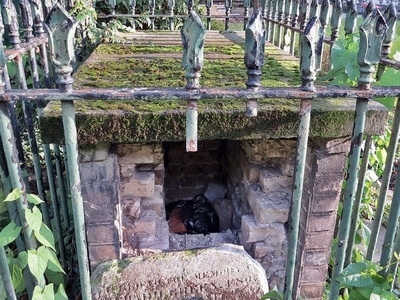 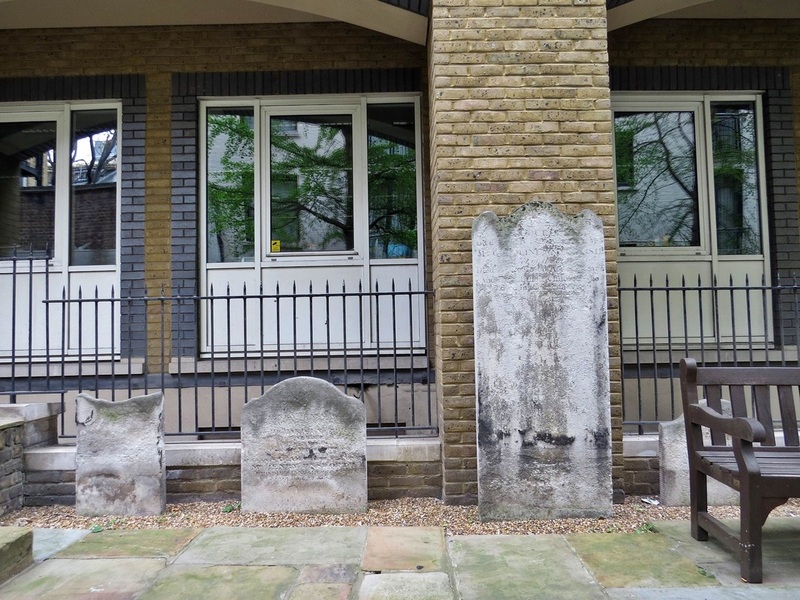 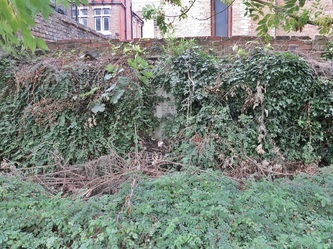 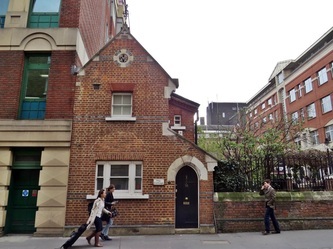 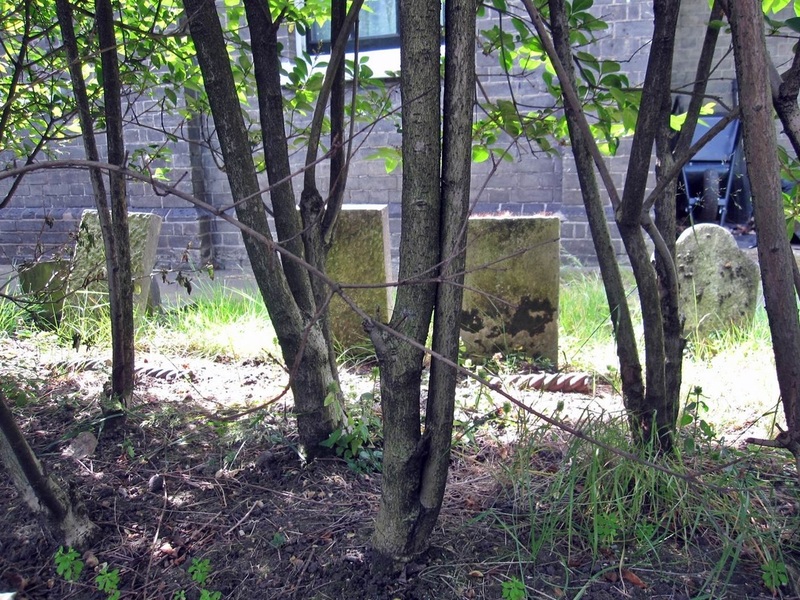 This is the former burial ground of a Nonconformist Chapel established in 1672 at St Thomas Square. The Chapel's first minister was Revd Dr W Bates, an Anglican priest who once served at St Dunstan's in the City, and who was once chaplain to Charles II. The chapel is long gone. 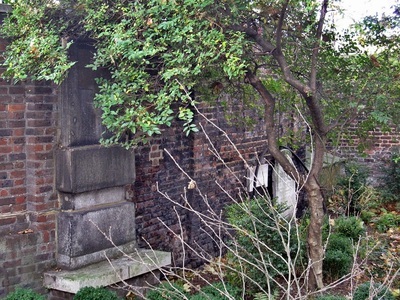 The burial ground was on land leased by St Thomas' Hospital and was used from at least the late 18th Century. 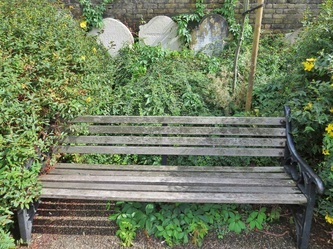 Following closure for burial, it was eventually laid out as a public garden in 1888. 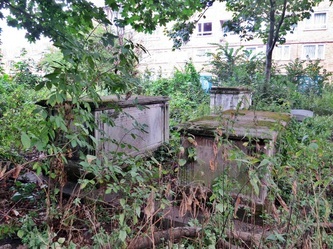 Most of the headstones were moved against the walls, though chest tombs remain in their original position. 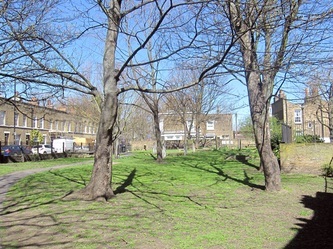 The burial ground is now known as St Thomas' Recreation Ground. 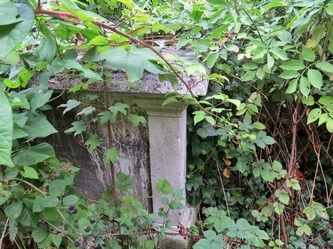 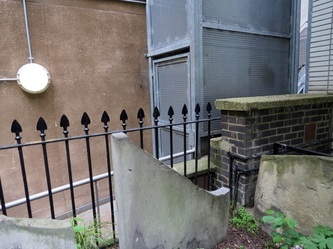 It is at the back of the present day Greek Orthodox Church of St John the Theologian (formerly known as the Catholic Apostolic Church) though this burial ground has never had an any connection with that church. 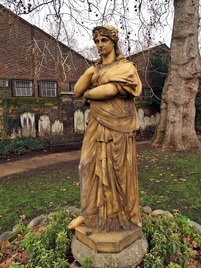 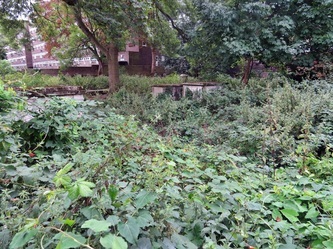 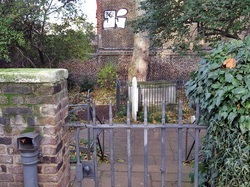 This garden was the site of the burial ground to a chapel of ease (a church building other than the parish church, built within the bounds of a parish for the attendance of those who cannot reach the parish church conveniently) of the parish church of St John at Hackney in 1810 by the Hackney Phalanx, a group of Anglicans. 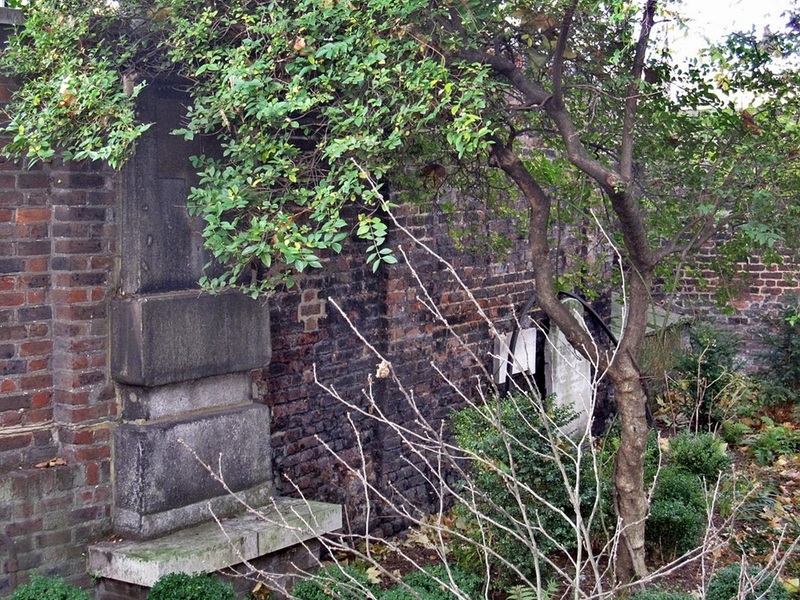 The chapel closed and demolished around 1848 with burials continuing until 1876. 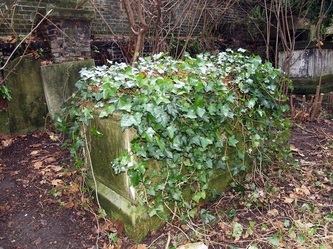 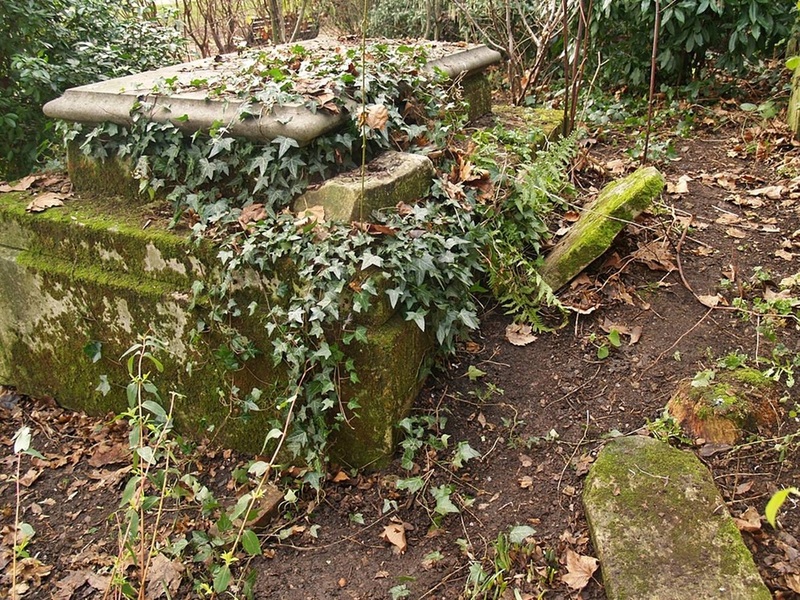 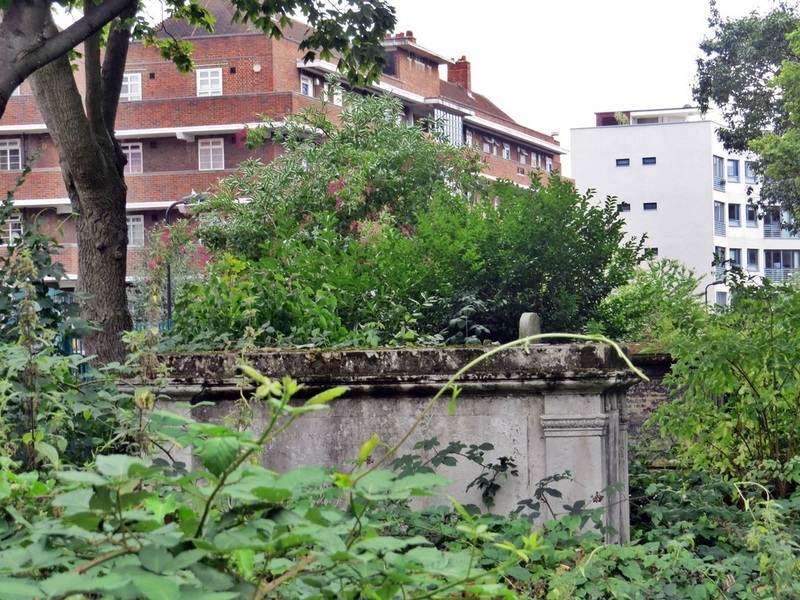 It was converted into a public garden following agreement of the Bishop of London in 1884, with some chest tombs left in position. 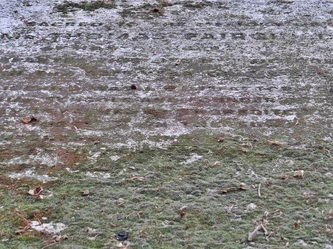 Among local people buried here were members of the Frampton family after whom the nearby 1960s Frampton Park Estate is named. 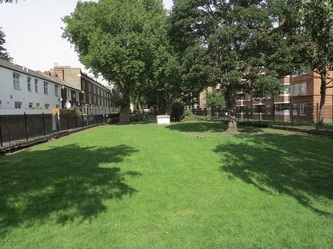 In 1888 a passage was made to join the garden with the burial ground, now known as St Thomas's Recreation Ground with the two sharing a single caretaker. 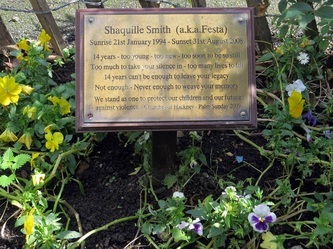 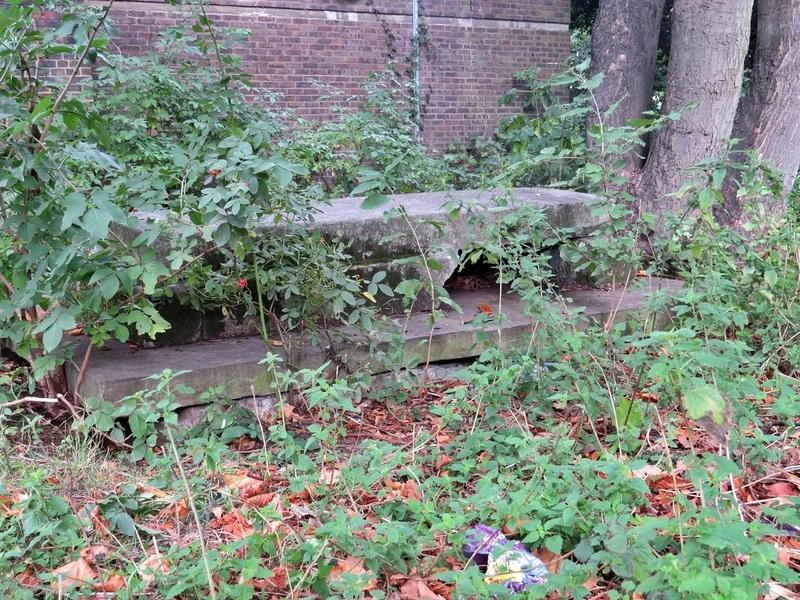 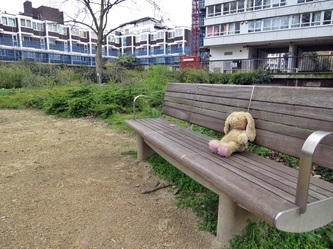 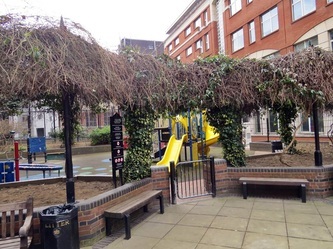 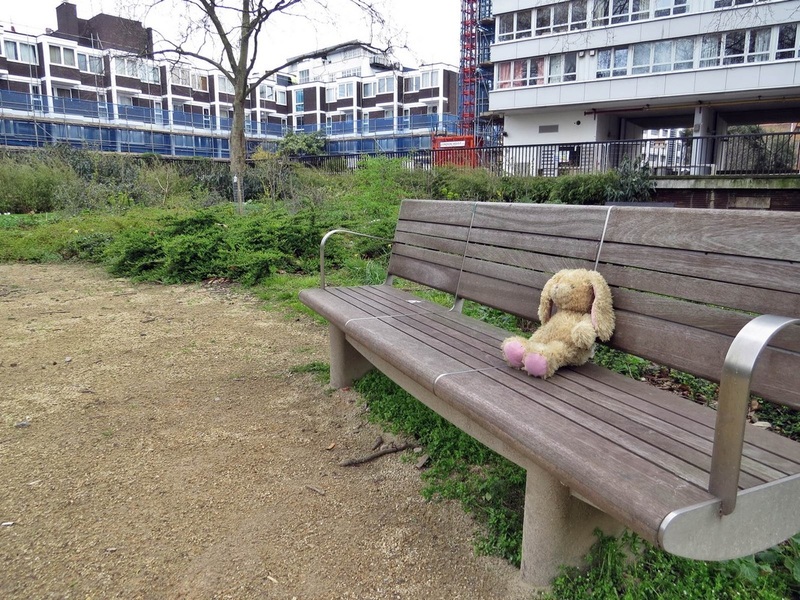 Six gang members were jailed for life for the murder of 14 year old Shaquille Smith who was stabbed as he sat in these gardens with friends one evening in 2008. 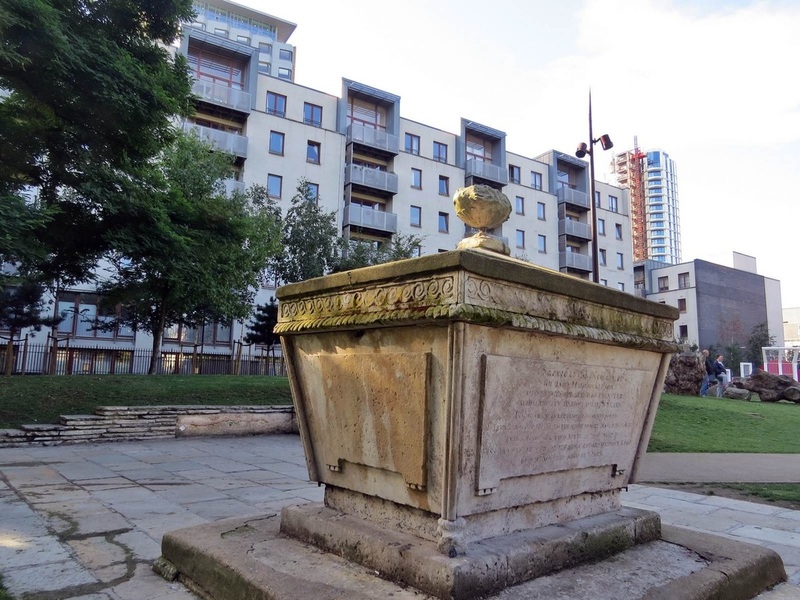 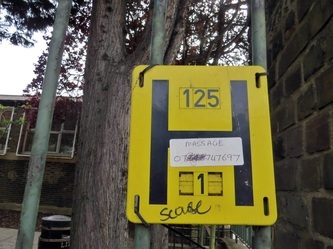 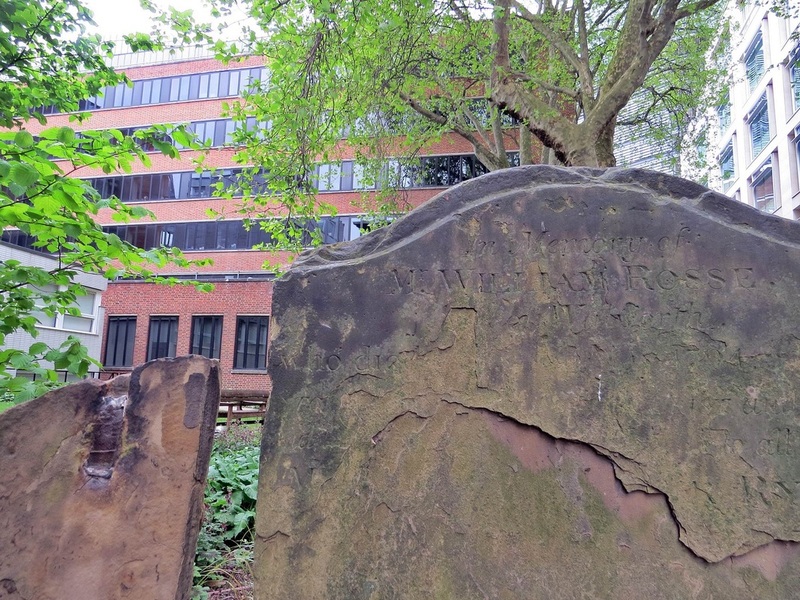 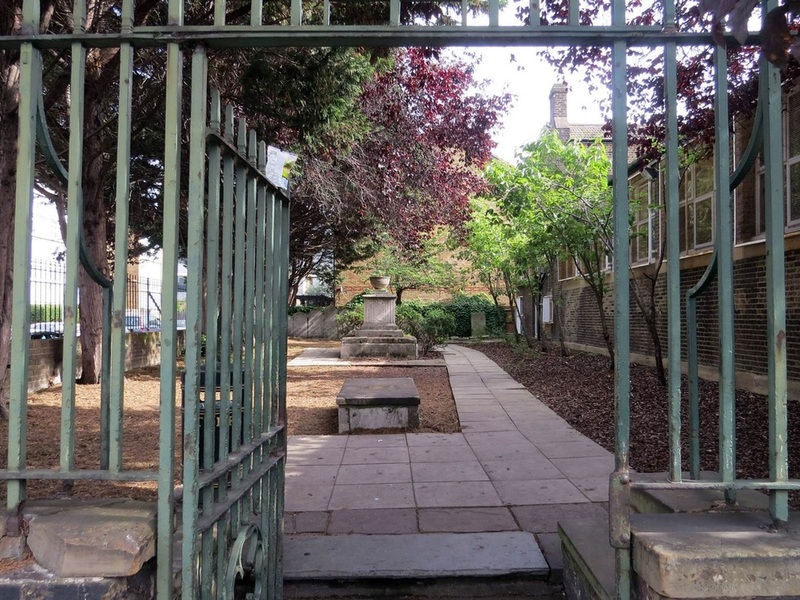 This was a burial ground situated in Bath Street (formerly Pest House Row) Originally a pest house ( a place where plague sufferers were consigned) stood across the road from here. 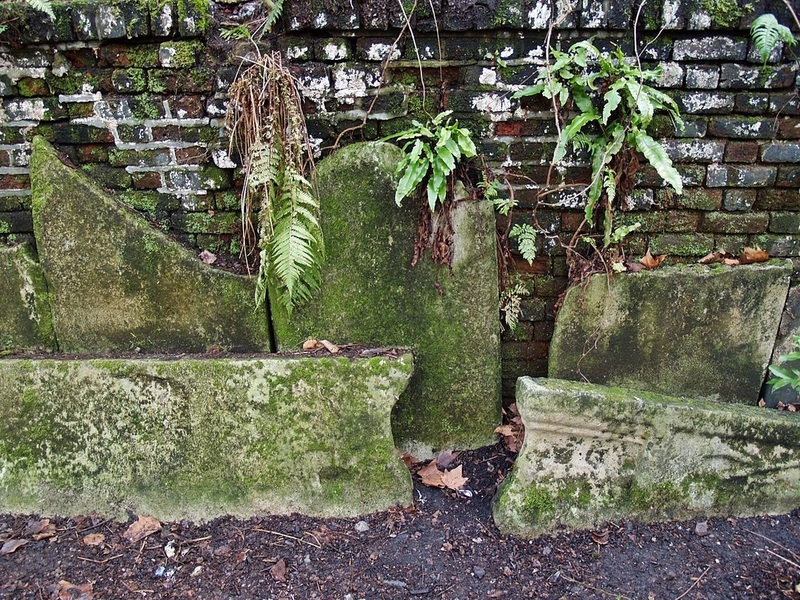 The burial ground was consecrated in 1662 for the parish of St. Giles, Cripplegate, and called the Pest House ground. 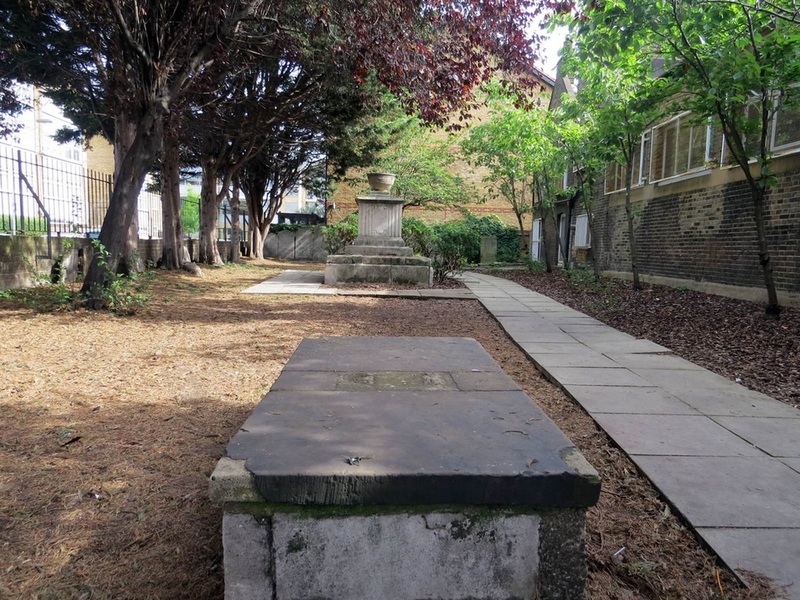 After 1732, it was used by St Lukes in Old Street and renamed The Poor Ground and used as a burial ground for the nearby workhouse. 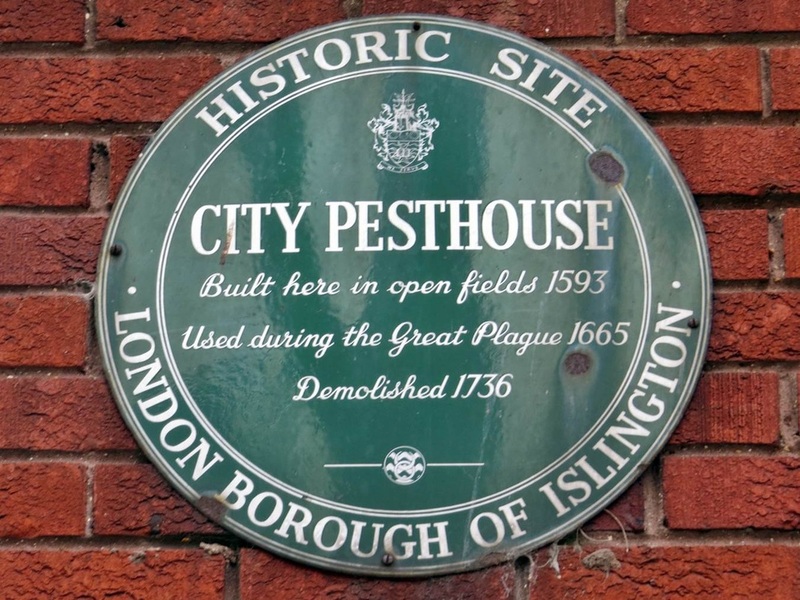 The site of the Pest House was later taken over by Huegenots and subsequently rebuilt as the French Hospital. 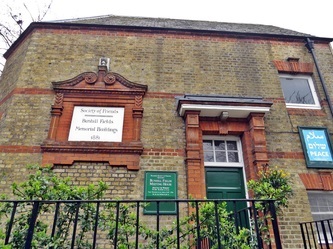 It is now occupied by a car park. 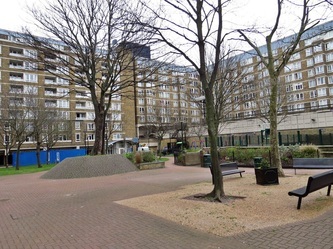 The burial ground itself is now communal gardens for the residents of the surrounding flats. 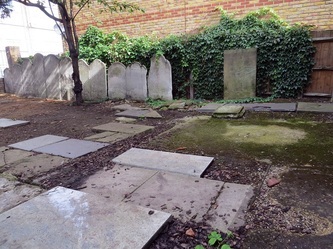 The grounds in front of the Wesley Chapel in City Road.are neatly laid out as gardens but an office block has been built over the burial ground at the back. 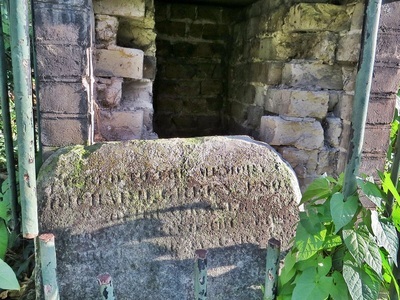 The church of St Ann was built on part of the site of the monastery of the Dominicans or "Black Friars". The monastery was dissolved by King Henry VIII and demolished. 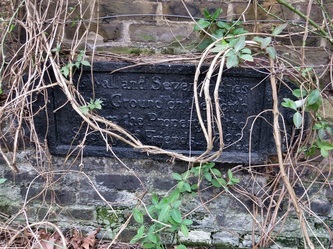 During the reign of Queen Mary I St Annes church was built here but was destroyed in the Great Fire of London of 1666. 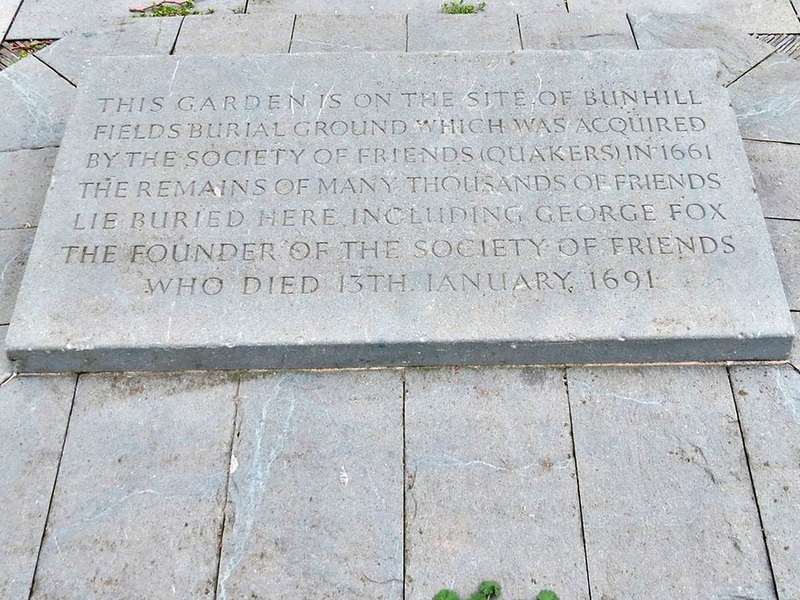 It was not rebuilt and site of the church was retained for burials until 1849 and part of it is now a public garden. 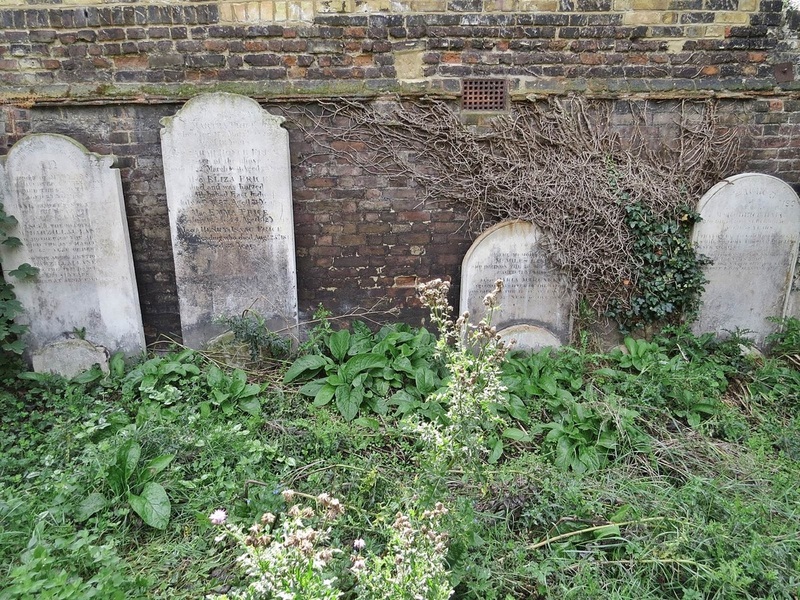 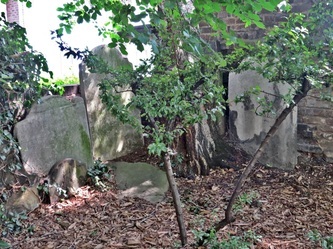 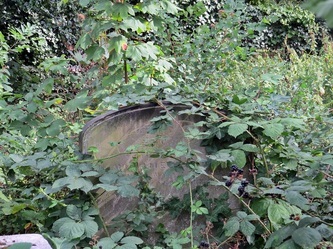 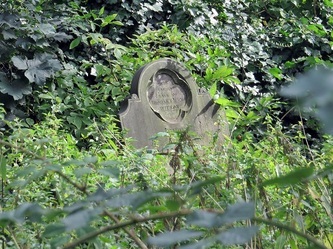 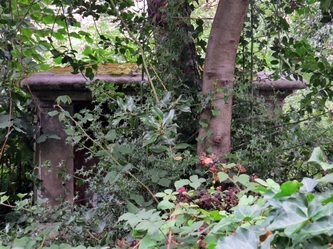 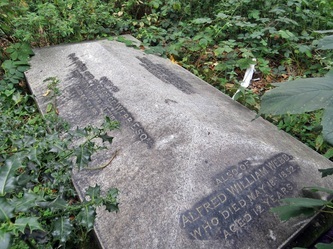 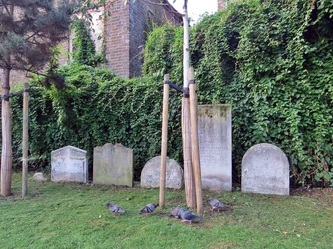 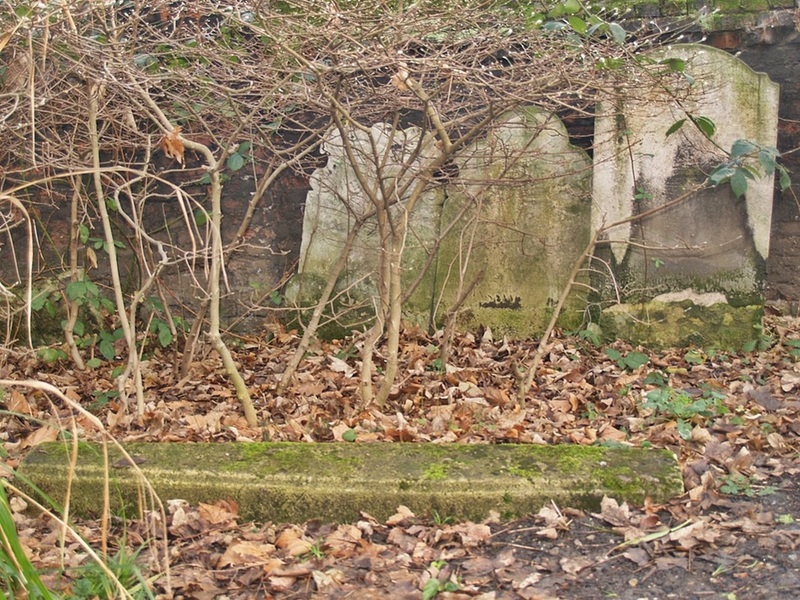 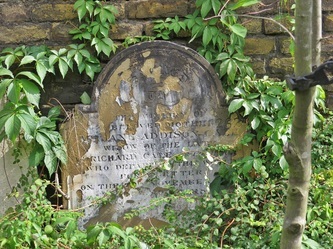 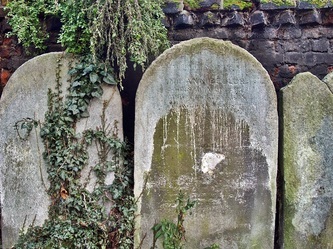 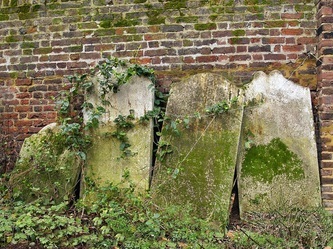 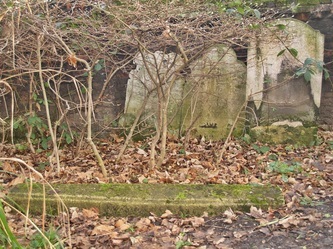 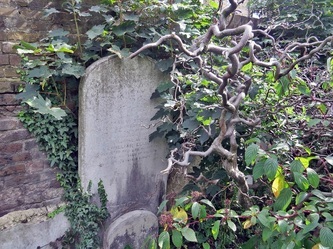 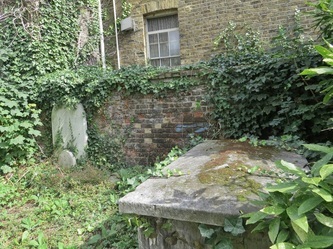 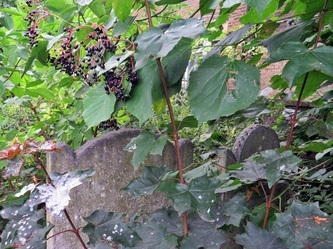 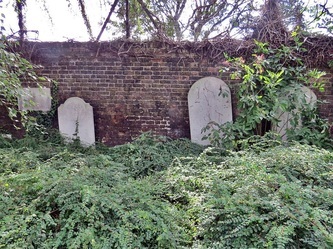 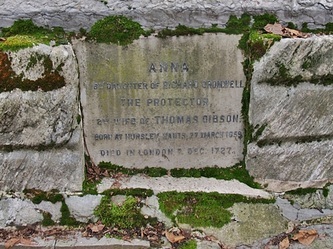 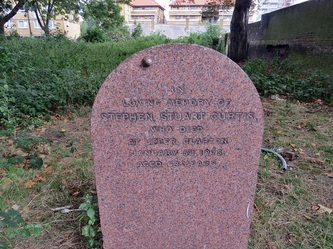 This burial ground is visited on my guided walking tour of the River Fleet as part of my London's Lost Rivers project. 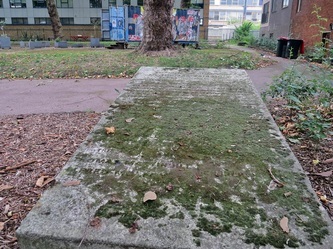 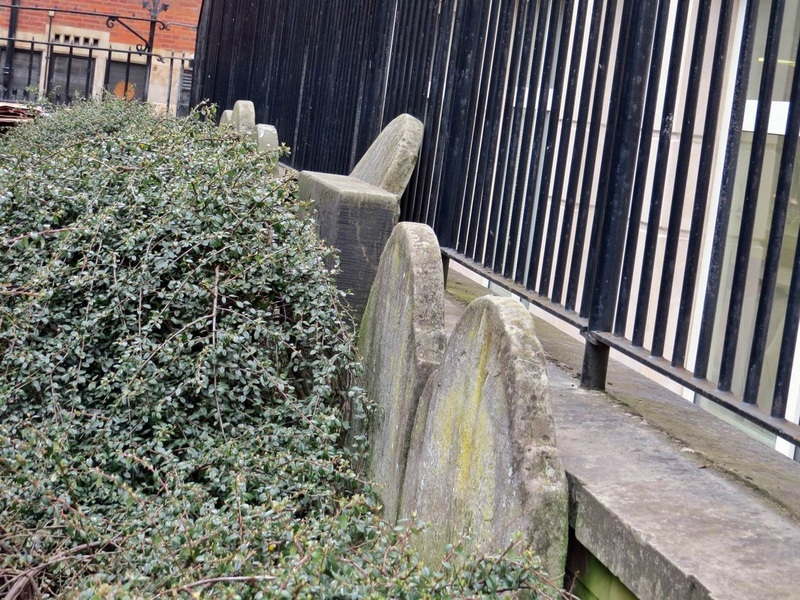 This was the burial ground of St Martin-in-the-Fields and was the first burial ground to be made into a public garden in Westminster following closure as a result of the Open Spaces Act of 1877. By the passing of the act it became illegal to build on any ground that had been set aside for interments. 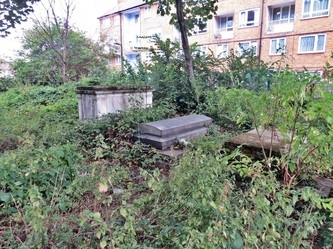 When open as a burial ground became overcrowded and had quite a horrible reputation.In "Gatherings from Grave Yards" by George Walker (published 1839) "This ground is a most intolerable and highly dangerous nuisance to the entire neighbourhood. 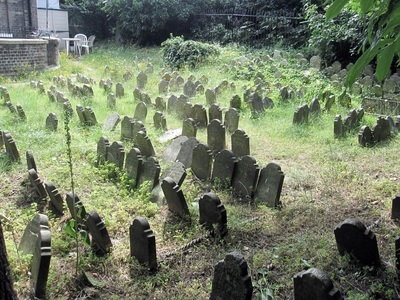 Rather more than two years ago, in making three areas to the centre houses on the western side of this burying ground, many bodies were disturbed and mutilated; the inhabitants of the houses are frequently annoyed by the most disgusting and repulsive sights." The Globe Road Wesleyan Chapel, was built here in the early 19th Century with a ground in use for 14,000 burials between 1820 to 1857 and was described as a very overcrowded burial ground. The chapel is long gone and today the burial ground is much smaller due to clearance for construction of the railway line. 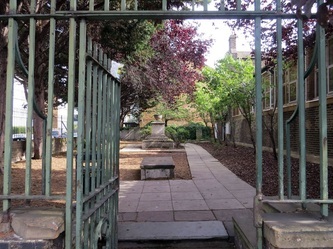 The Crafts School took over the site in 1895 and in 1926 the disused burial ground was laid out as an open space. 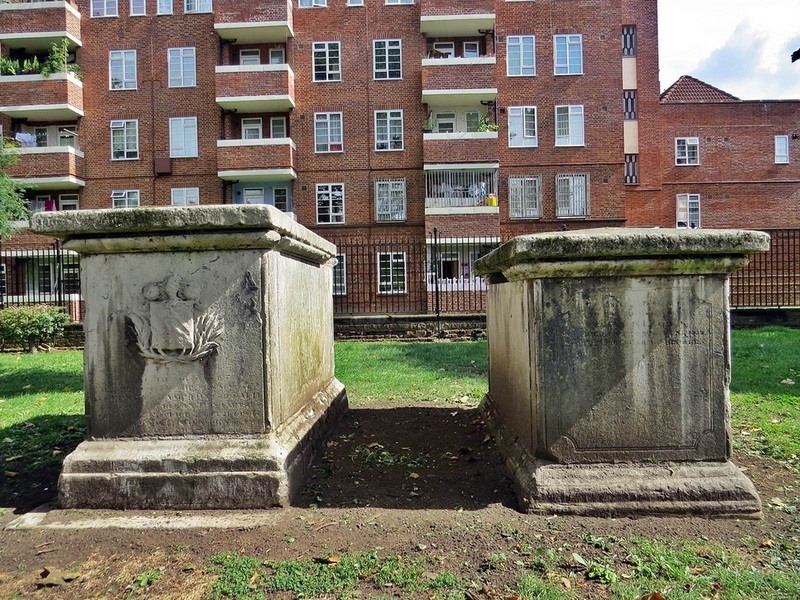 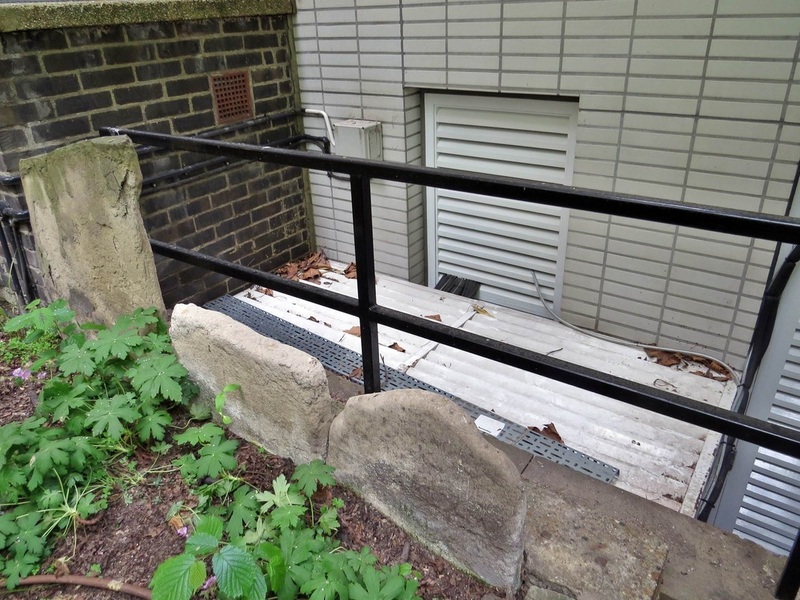 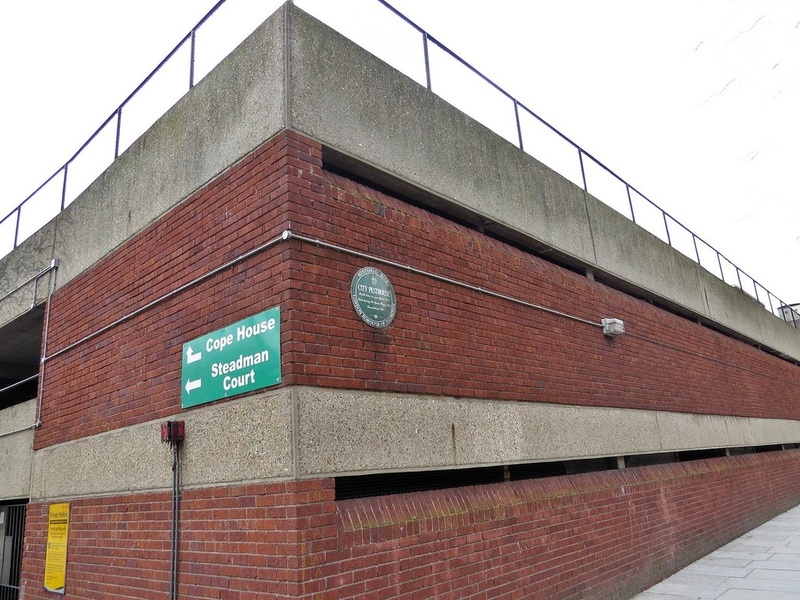 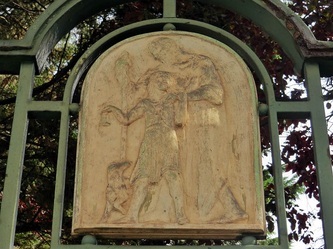 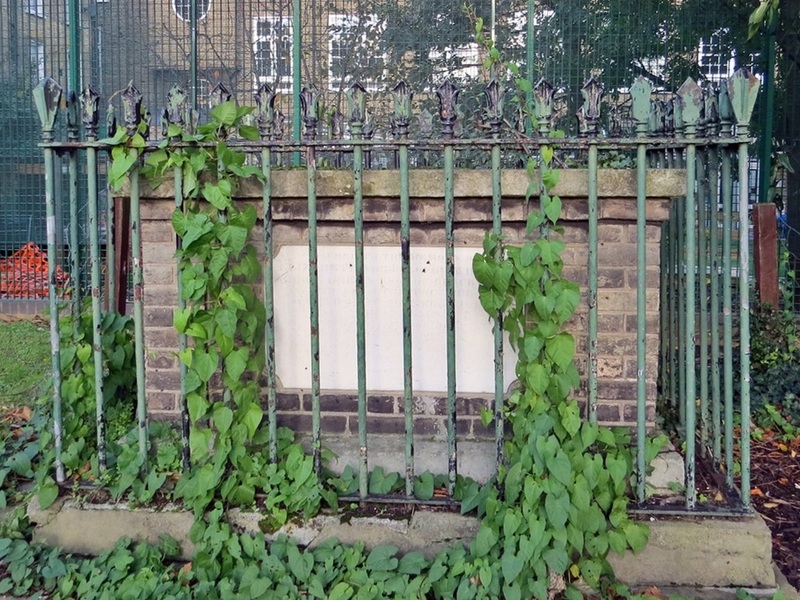 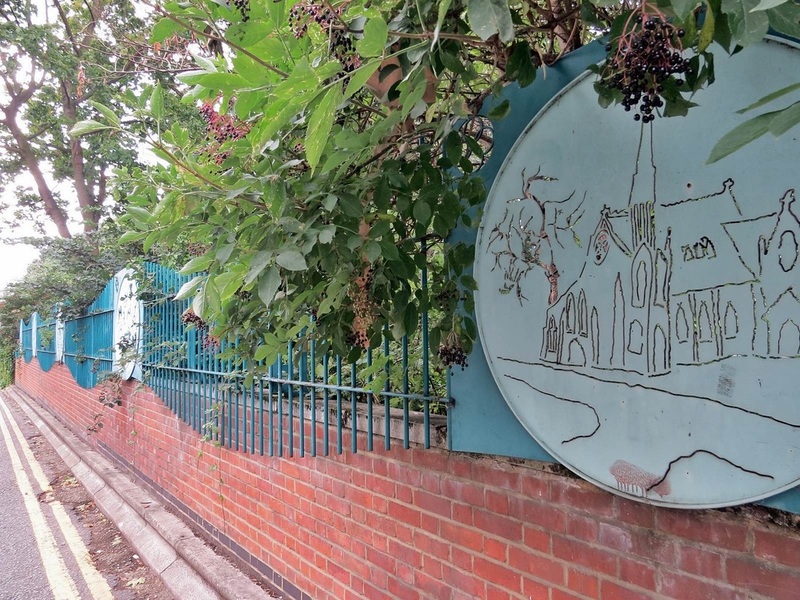 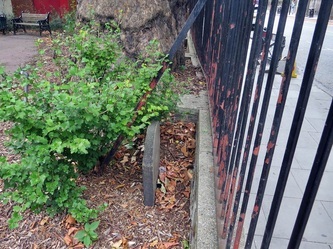 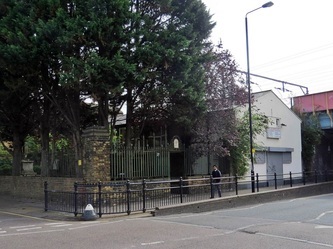 The entrance gate and boundary railings, which remain along Globe Road were created by a former blacksmith who had taught at the School and features a bronze plaque on the outside face of the gate of The Blind Beggar of Bethnal Green. 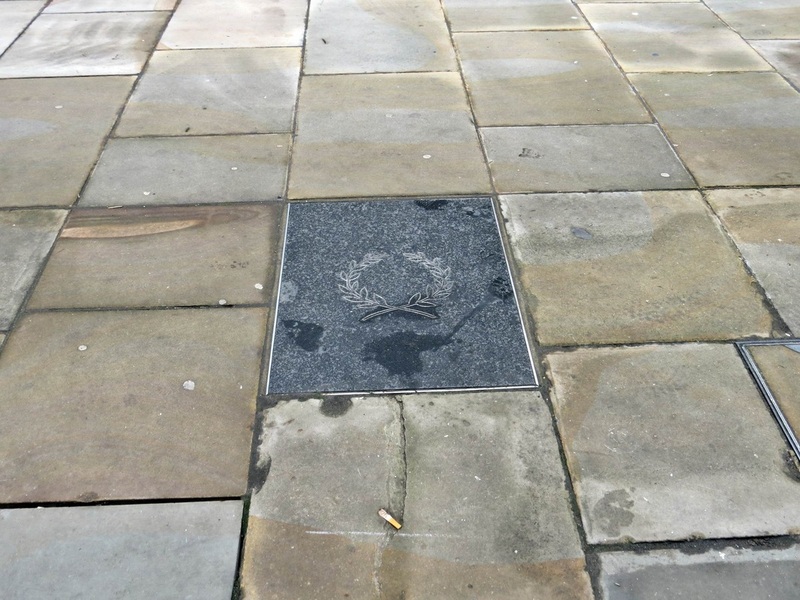 In the Blind Beggar legend, a landed gentryman Henry de Montfort was wounded and lost his sight in the Battle of Evesham in 1265 and used to beg at the nearby crossroads (where a pub of that name now stands). 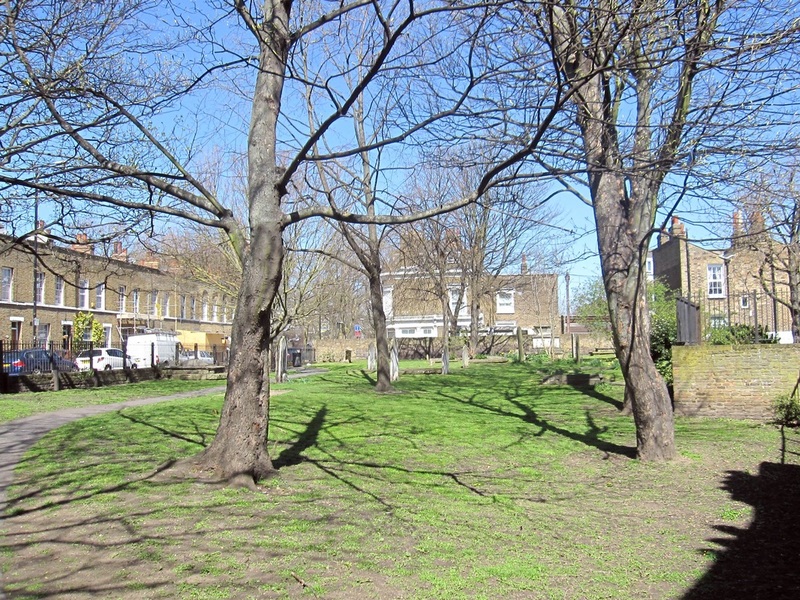 Hackney Road Recreation Ground was formerly the site of Shoreditch Burying Ground (an extension of nearby St Leonards) in the 18th Century. 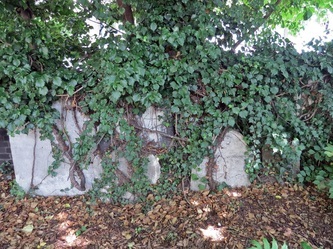 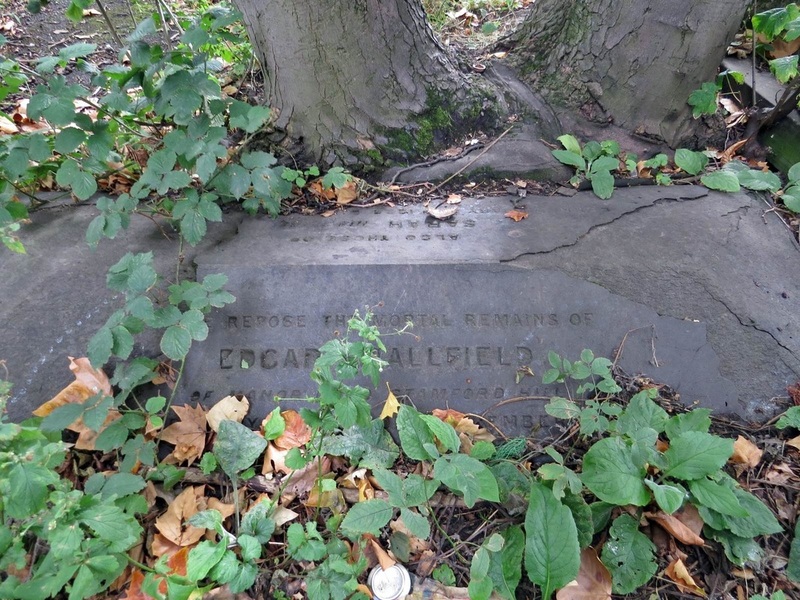 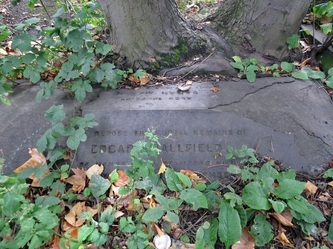 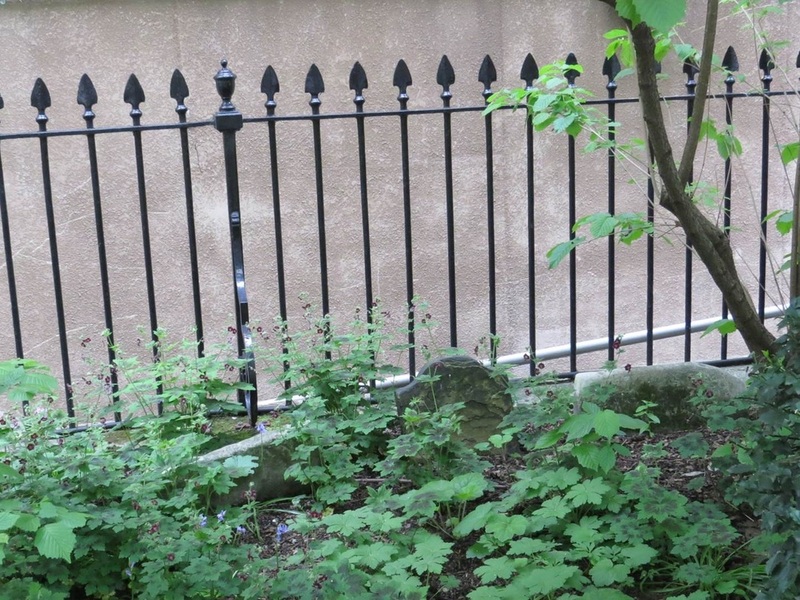 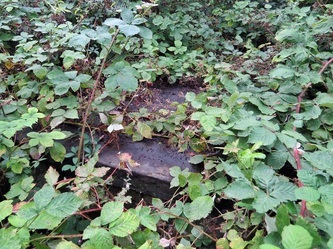 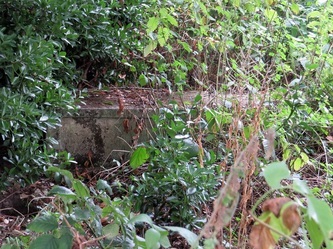 The site still contains two memorial stones - one of these marking the grave of Thomas Fairchild a leading nurseryman and botanist who sought to beautify the city. 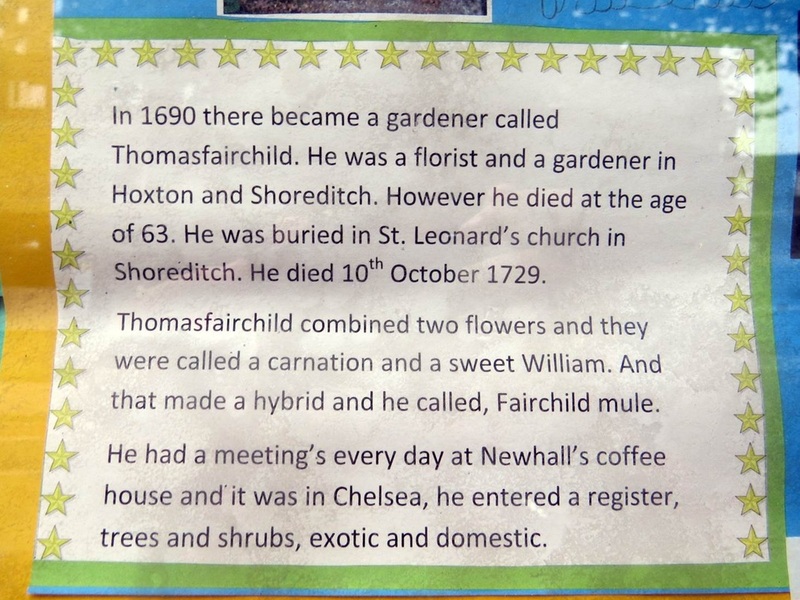 Fairchild's Nursery in Shoreditch existed from 1691 to 1740 and specialised in flowering plants.In 1717 Fairchild crossed the Carnation with the Sweet William to create 'Fairchild's Mule'. 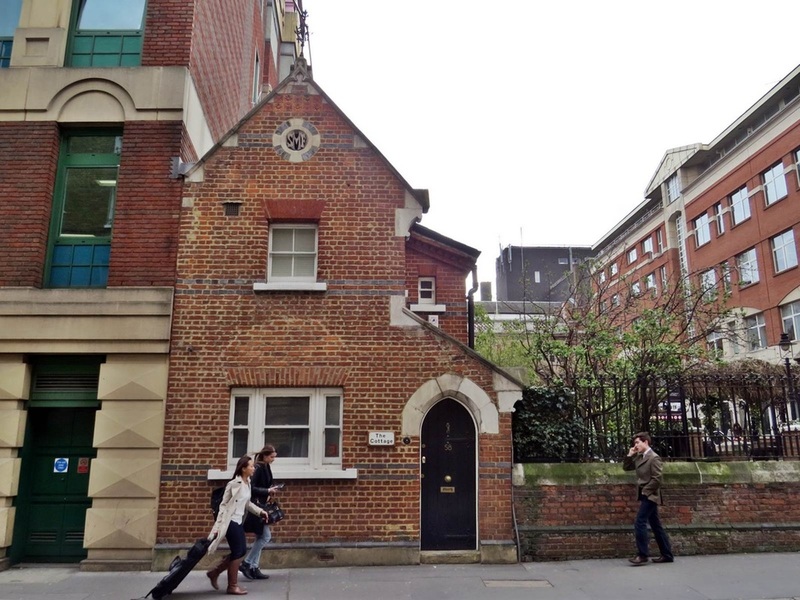 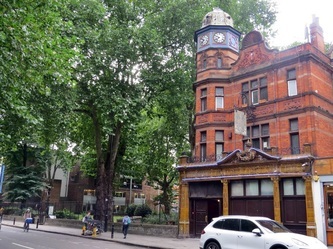 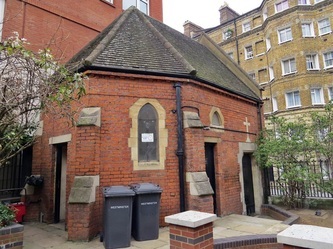 Mrs Basil Holmes in her book "The London Burial Grounds" (published 1896) referred to an 'ancient watch-house' in the burial ground that was later used as a cholera hospital. The burial ground became a recreation ground complete with tennis courts in the 20th Century though only the hardstanding of the tennis courts now remain. 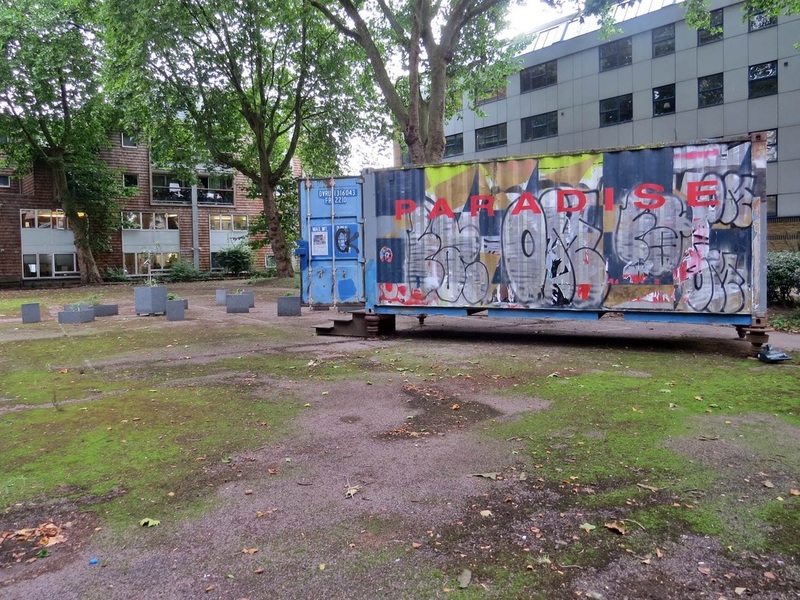 A recycled shipping container houses arts exhibitions. 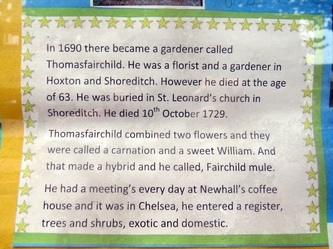 Probably not what Fairchild would have envisaged! 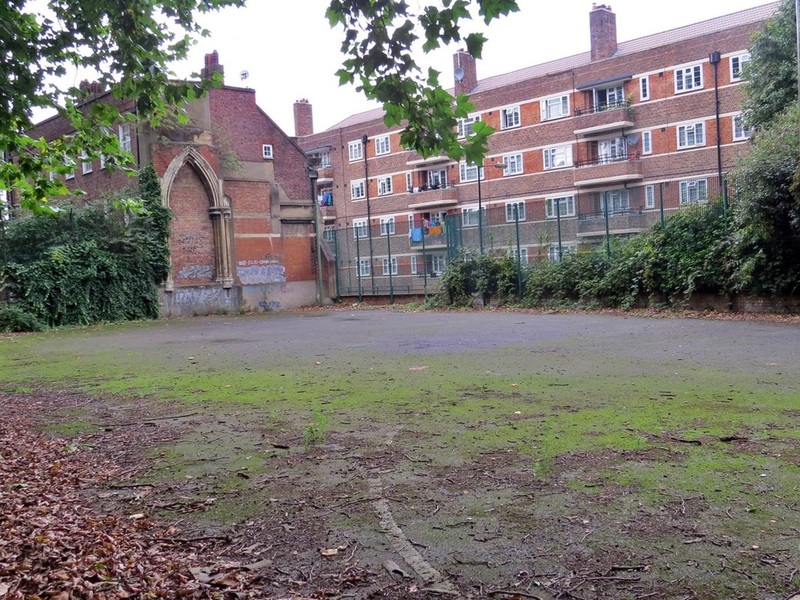 Its easy to miss this unassuming little recreation ground overshadowed by the fading grandeur of the Ye Olde Axe pub, a neon lit strip joint. 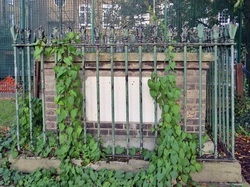 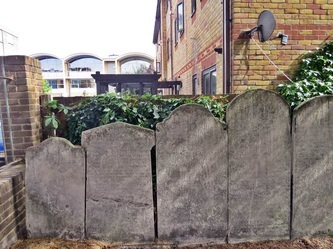 Long Lane Playground in Bermondsey is on the site of a Quaker Burial Ground whose perimeter wall remains as the wall to the recreation ground. 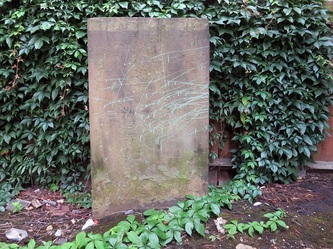 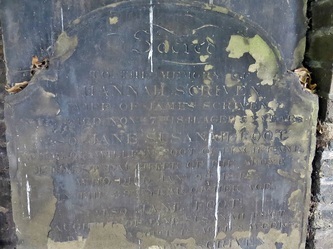 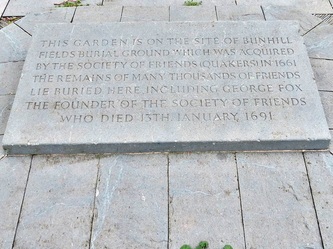 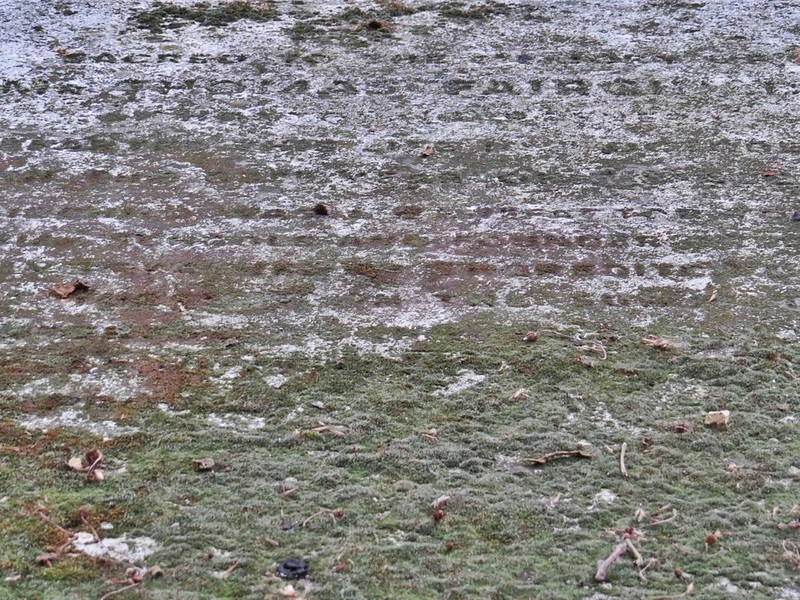 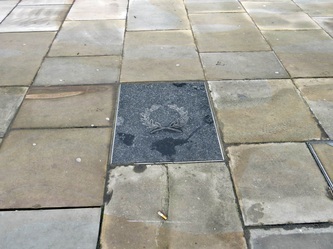 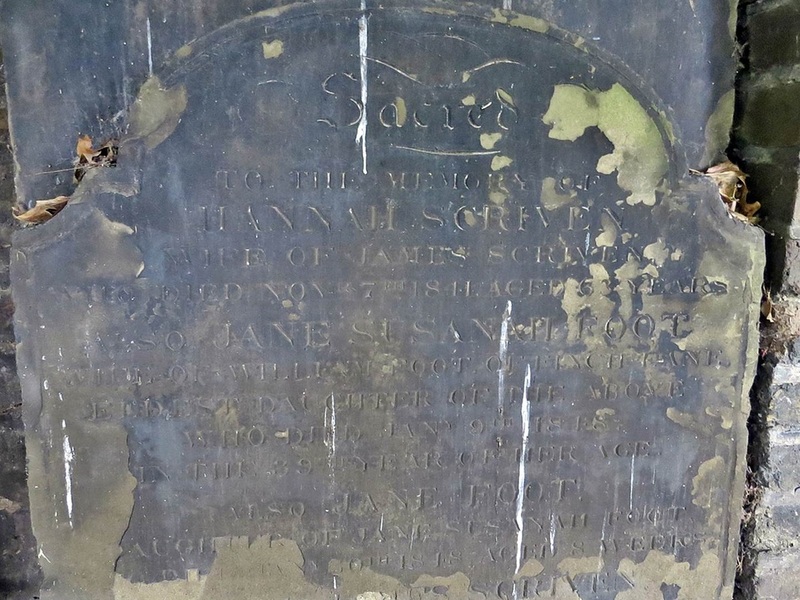 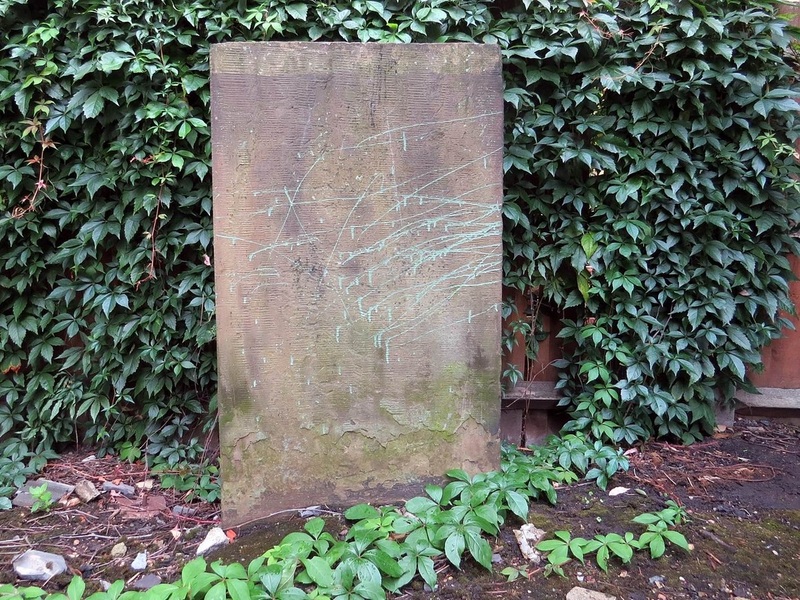 A slab records the opening of the Society of Friends burial ground in 1697 and its closure in 1855. 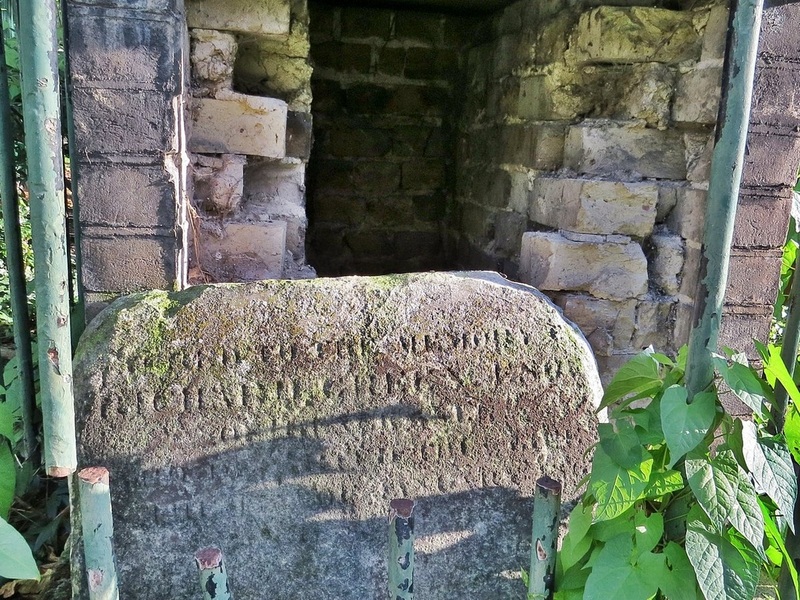 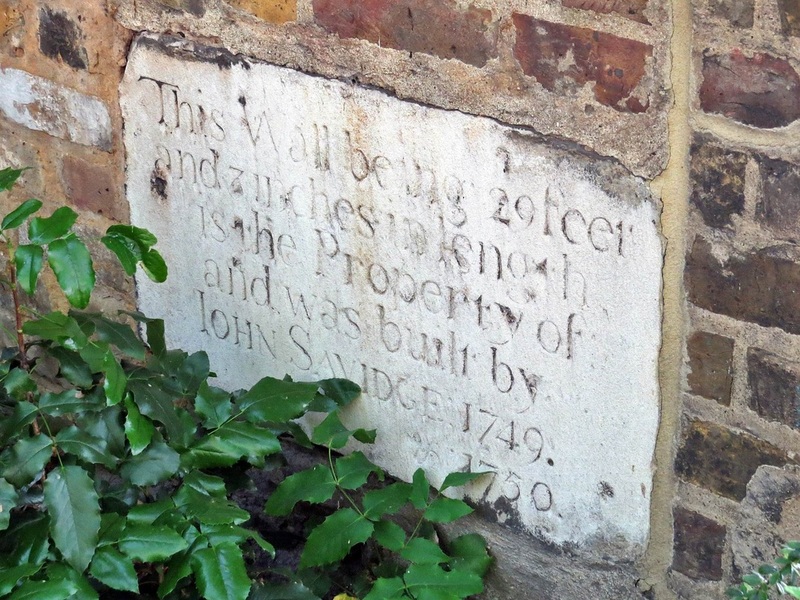 A stone tablet set into the wall records that it was built in 1749 - 1750 by John Savage. 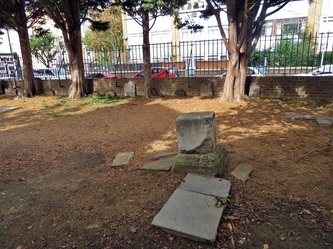 The burial ground adjoined that of the Neckinger Road Baptist Chapel established in 1690, which joined with the Back Street Independent Chapel and bought the piece of land for a burial ground. 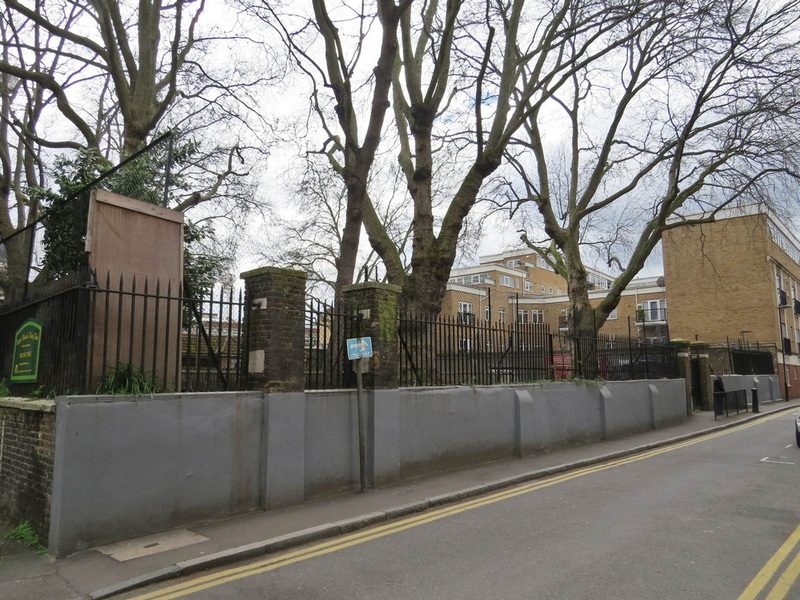 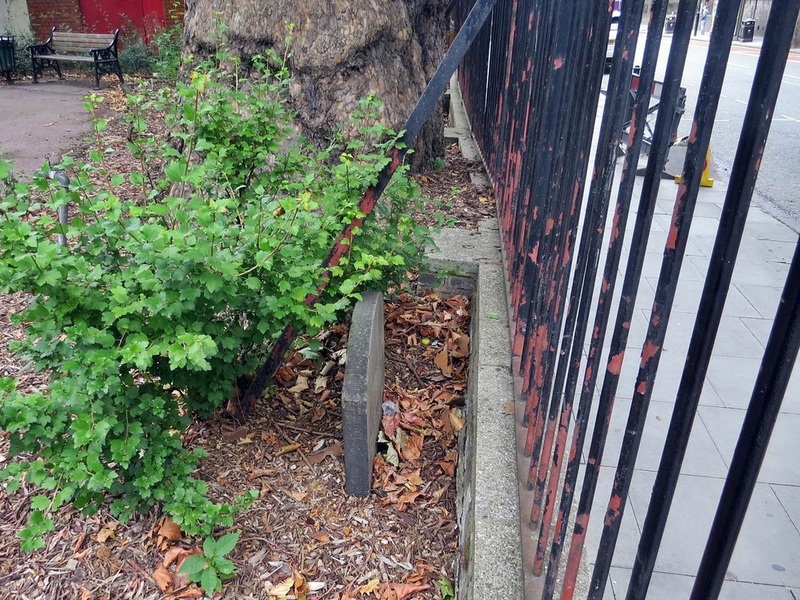 Both were laid out as a children's playground by Bermondsey Vestry in 1885. 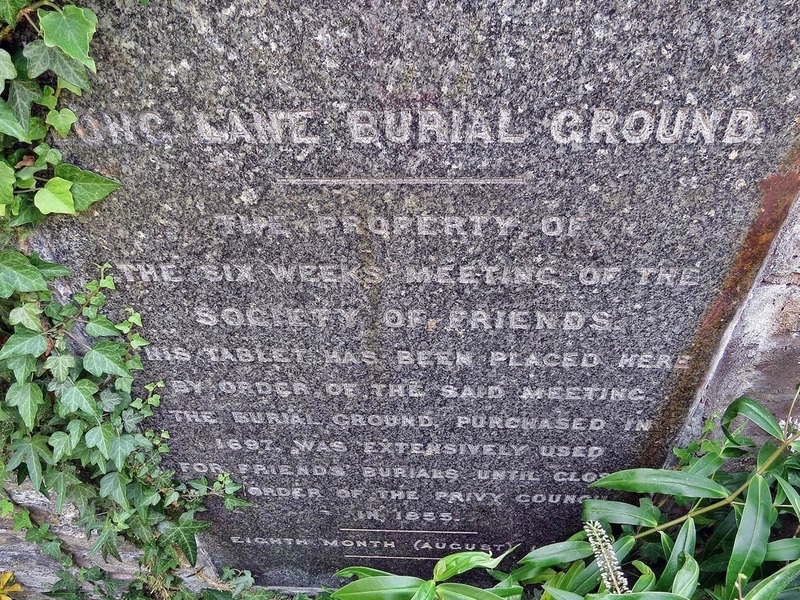 The London Gazette records that burial were to be discontinued by order of the Privy Council (dated 1853) in the interest of public health and to prevent diseases. 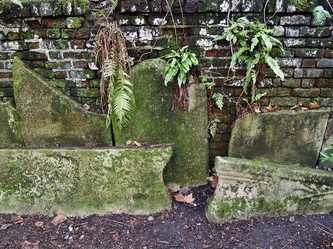 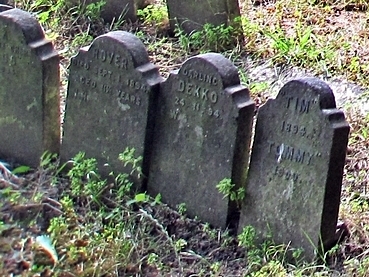 Some tombstones from the Chapel Ground still exist. 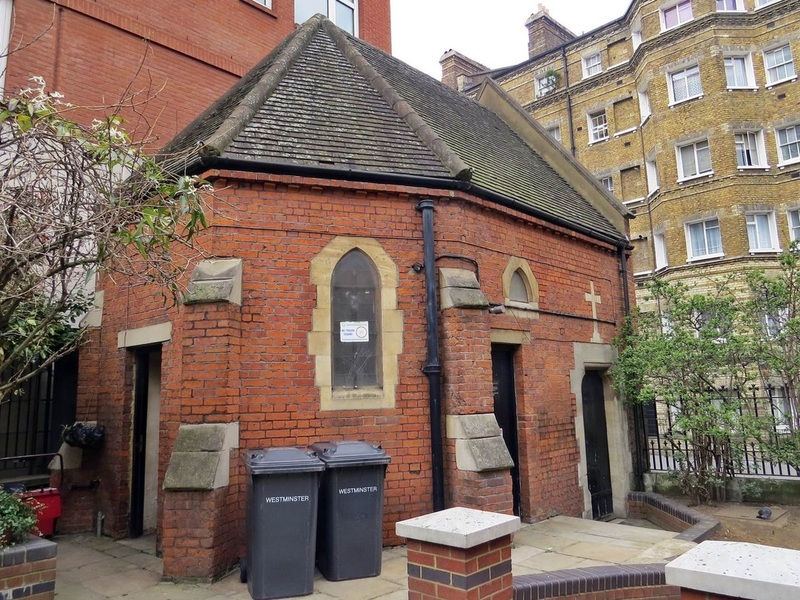 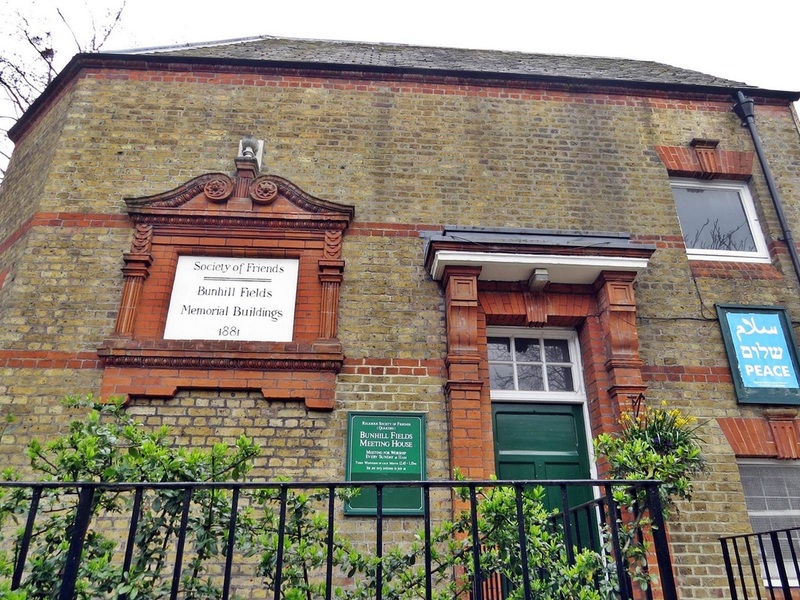 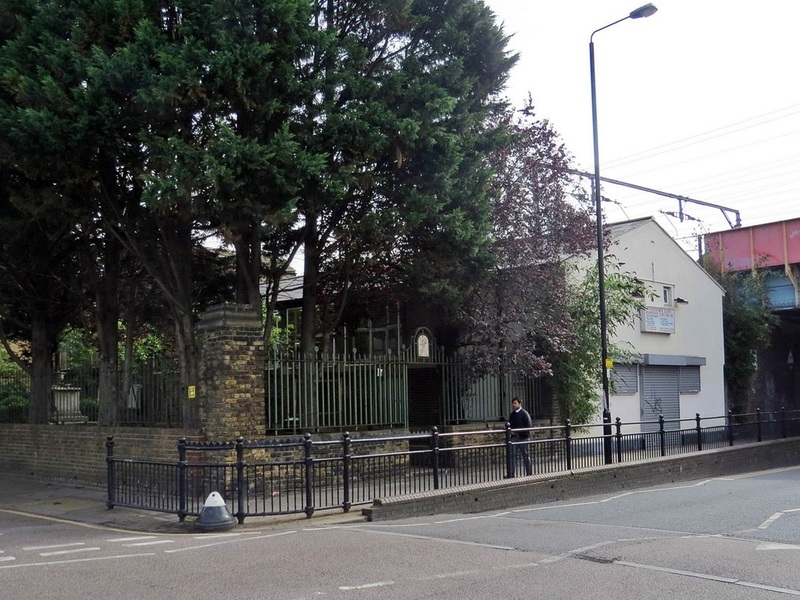 The Gravel Pit Chapel was established in 1715 in Hackney for a nonconformist congregation, which by the early 19th century begun to identify itself as Unitarian. 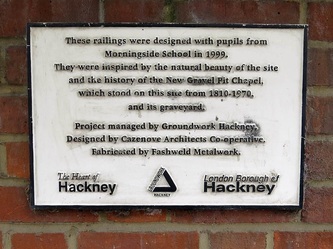 It took its name from the gravel pit near the bowling green in Mare Street. In 1809 the congregation moved to the New Gravel Pit Chapel nearby. 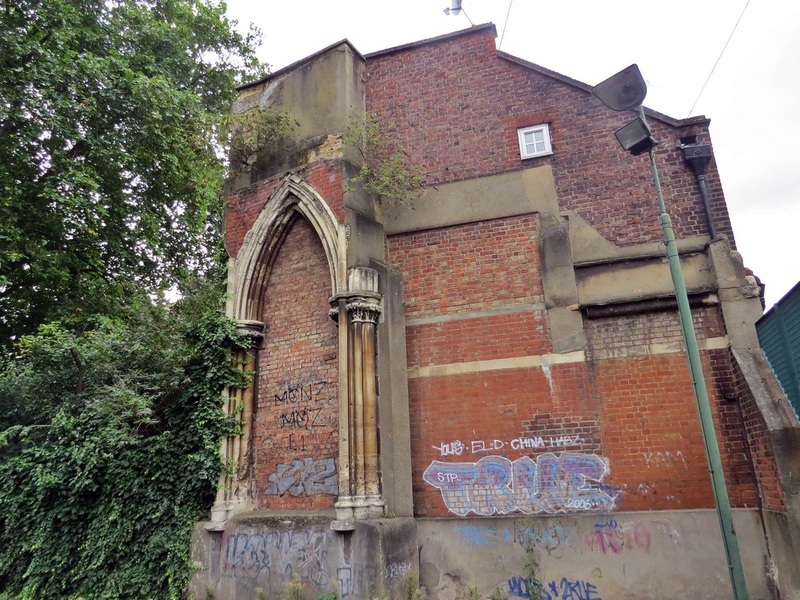 The New Gravel Pit Chapel was rebuilt on this site in a Gothic style in 1857 and closed and demolished in 1970. 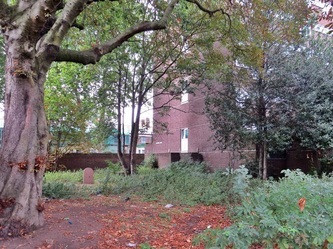 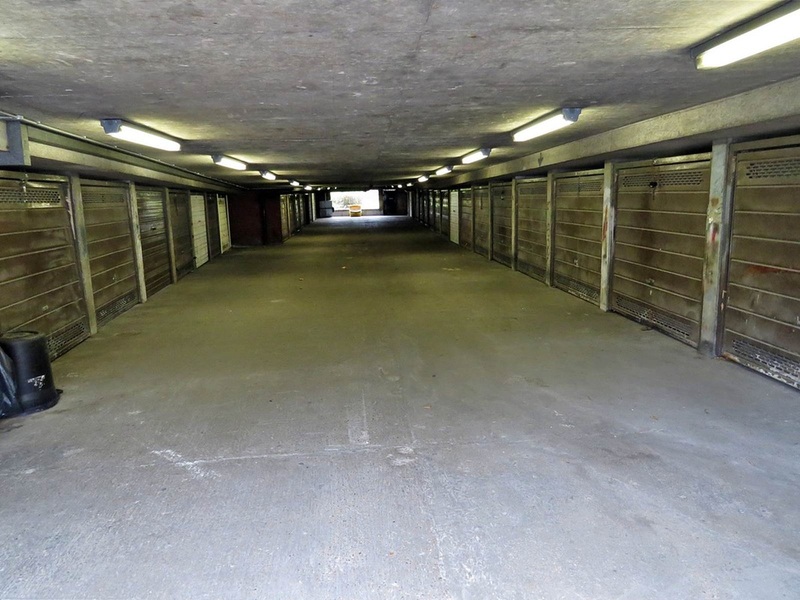 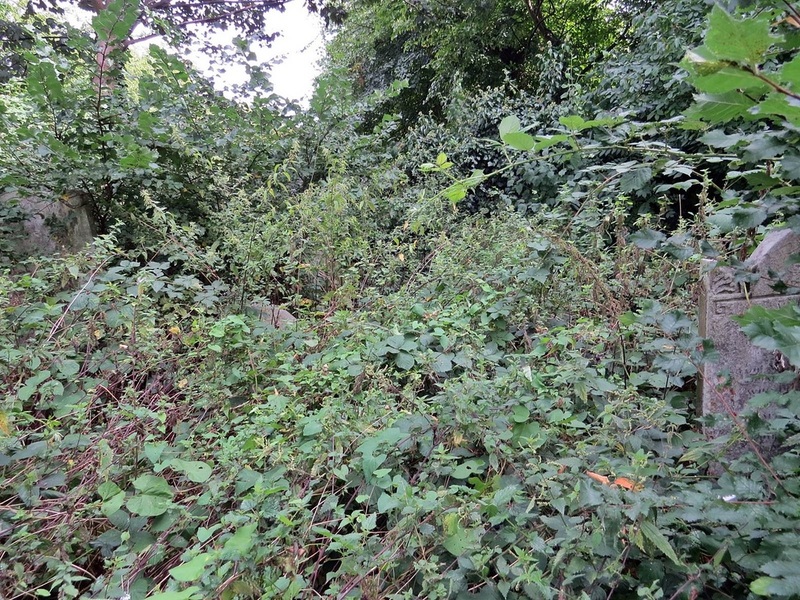 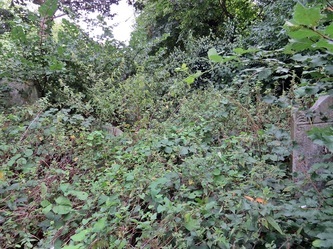 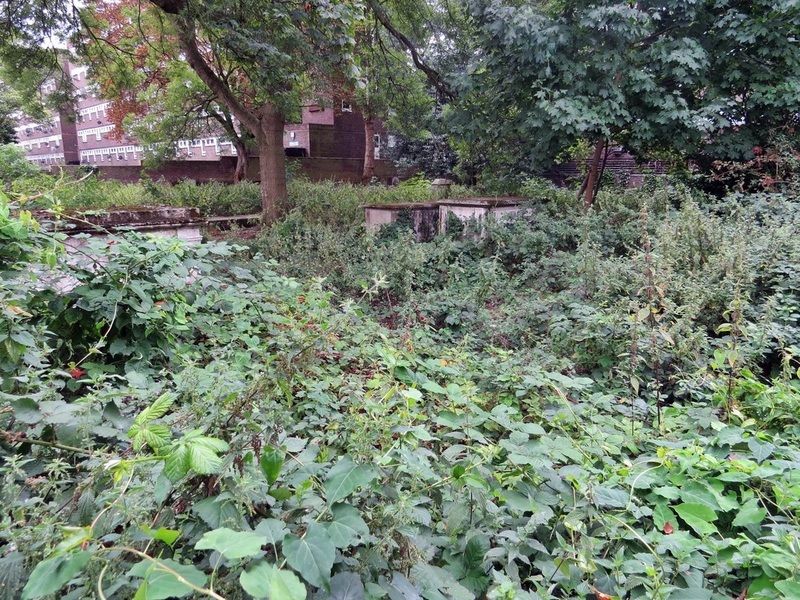 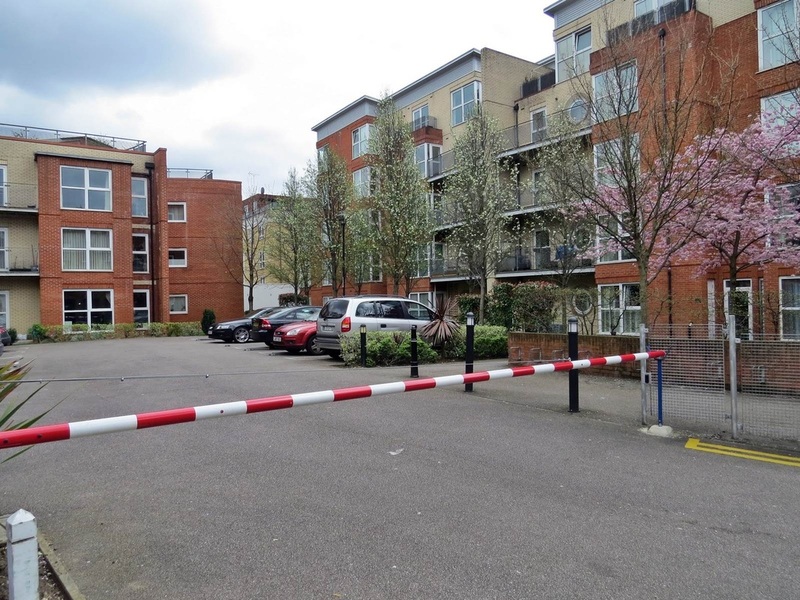 The area was acquired for new housing by the GLC, leaving only the burial ground which is now surrounded by tall blocks of flats and has been fenced off to the general public. 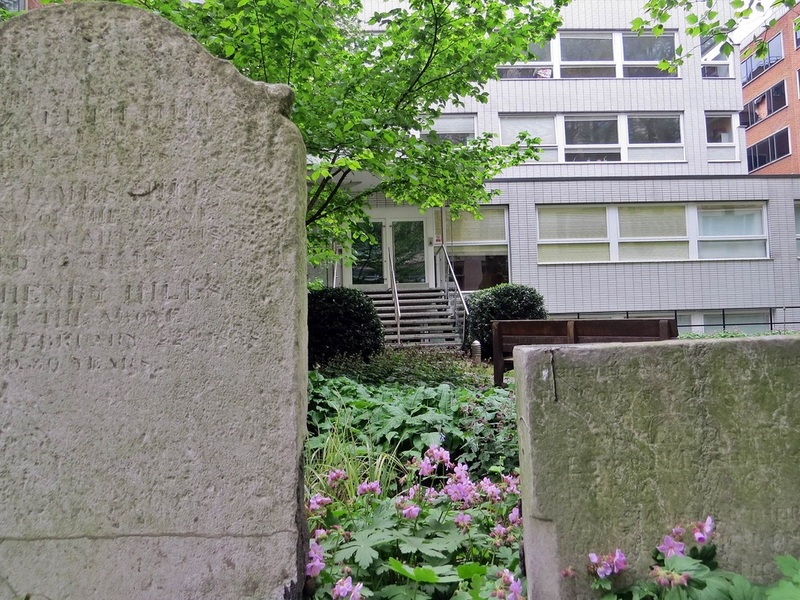 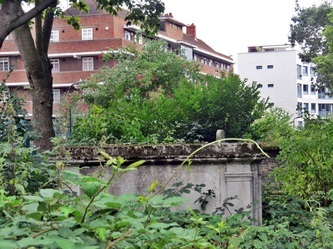 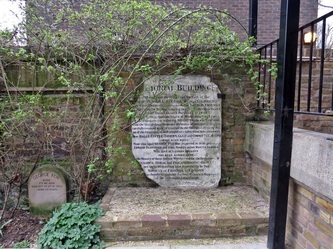 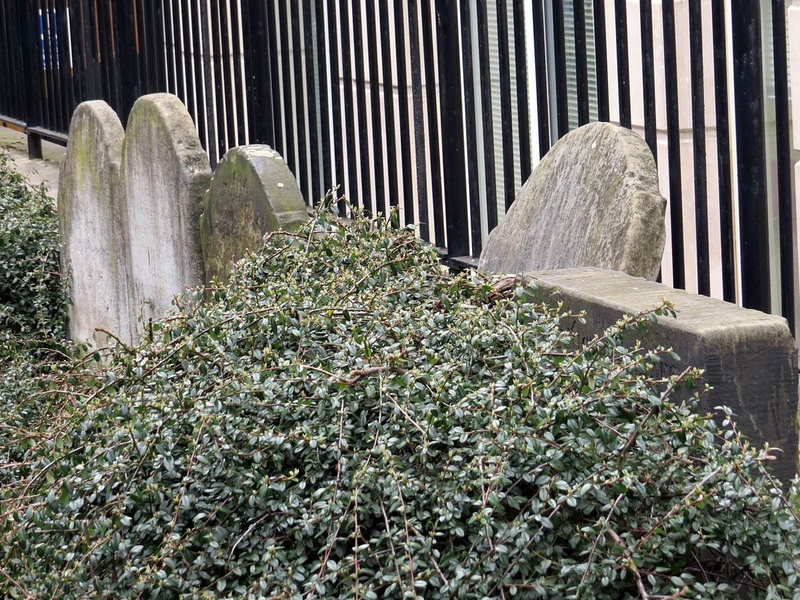 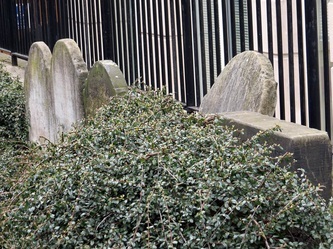 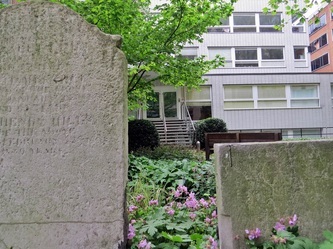 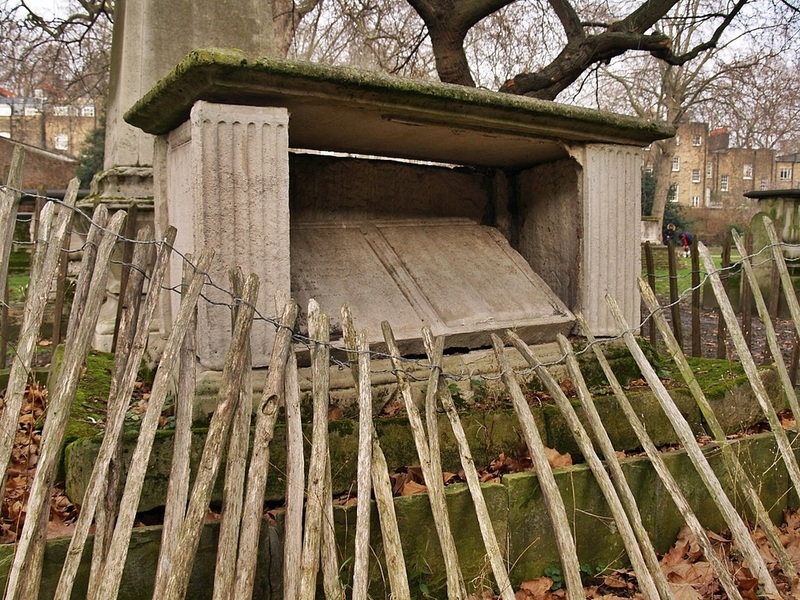 Bunhill evolved from bonehill an that area had been used as a burial ground as far back as Saxon times. This land was bought by Quakers in 1661 for burials.It was the first freehold property owned by Quakers in London and was in use as a burial ground until 1855. 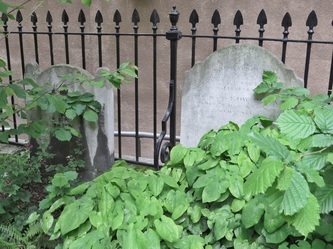 12,000 Quakers were buried here in unmarker graves although there is one stone for George Fox (founder of the Quakers) who is buried here. 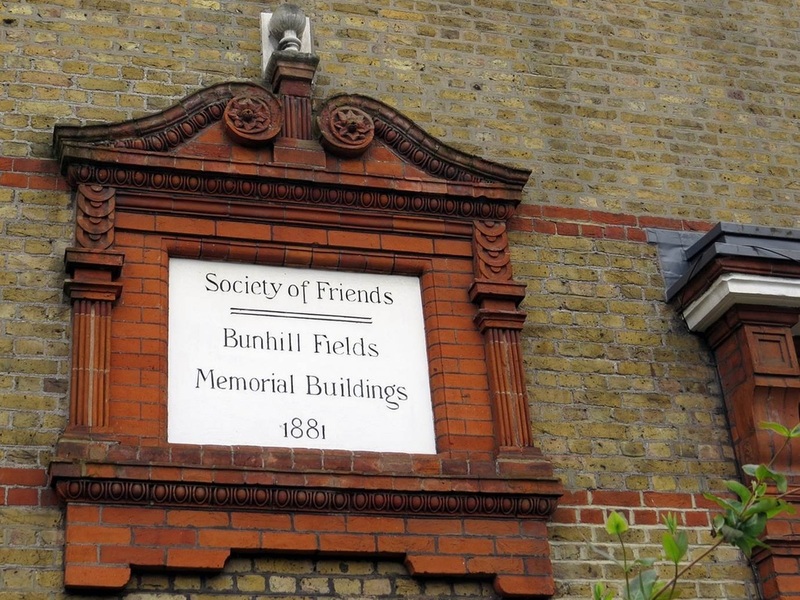 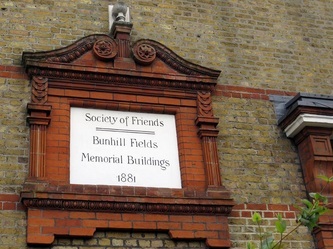 In 1881 Quakers had Bunhill Memorial Buildings built for philanthropic purposes on the adjacent site. 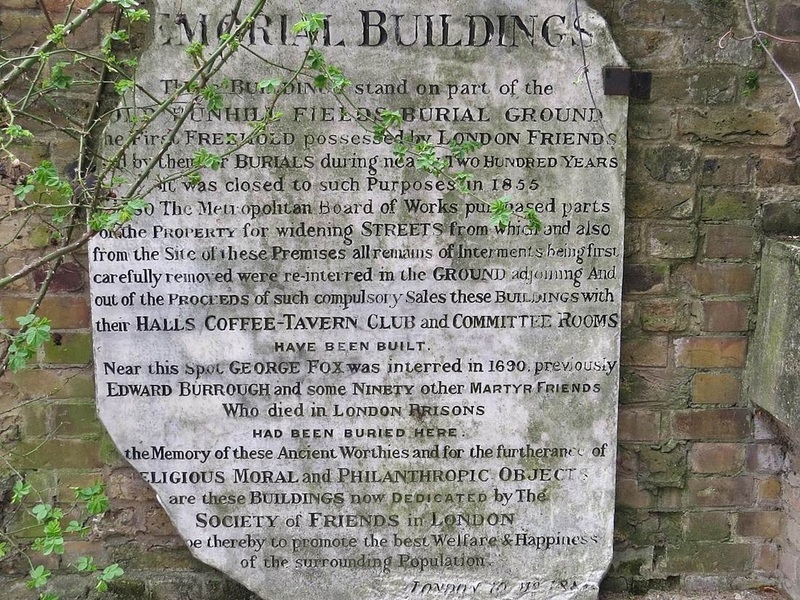 This provided a coffee house, adult school, medical mission & a large Quaker Meeting House. 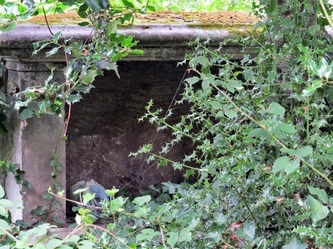 As a result of wartime bombing only the caretaker's cottage remains which is now used as a Meeting House. It later became compulsory to sell part of the old burial ground for roads and housing. 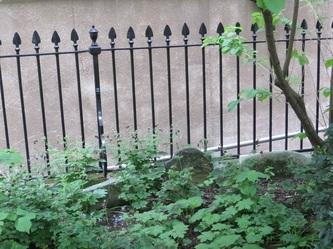 The remaining burial ground is now maintained as Quaker Gardens for public enjoyment. 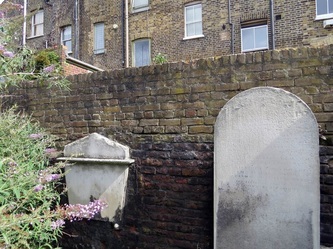 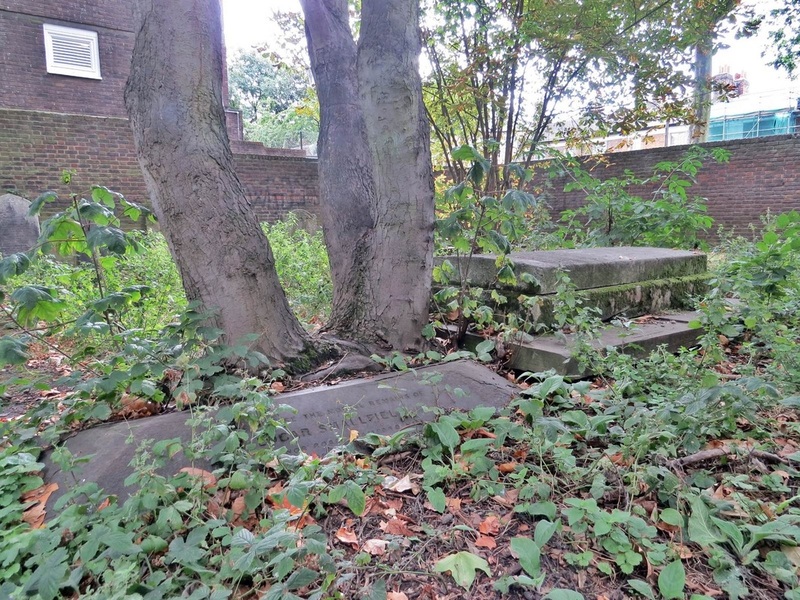 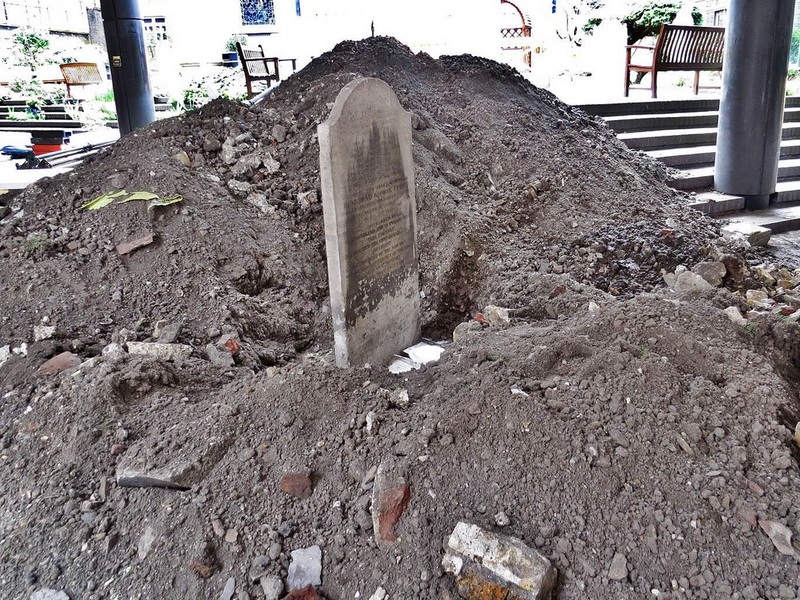 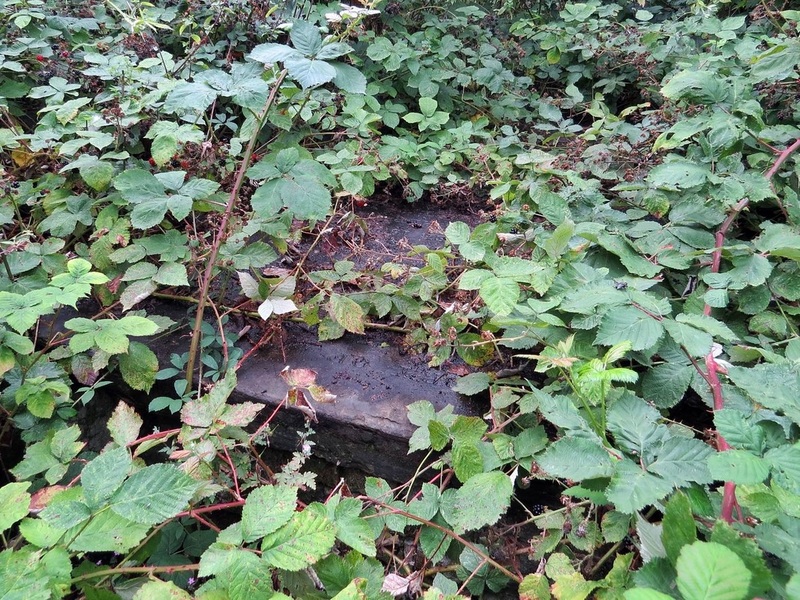 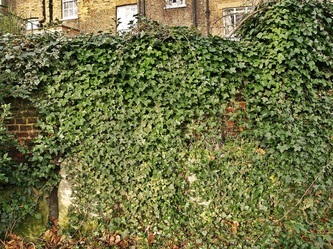 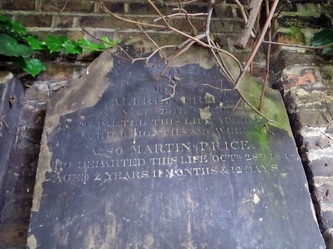 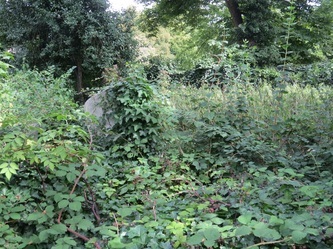 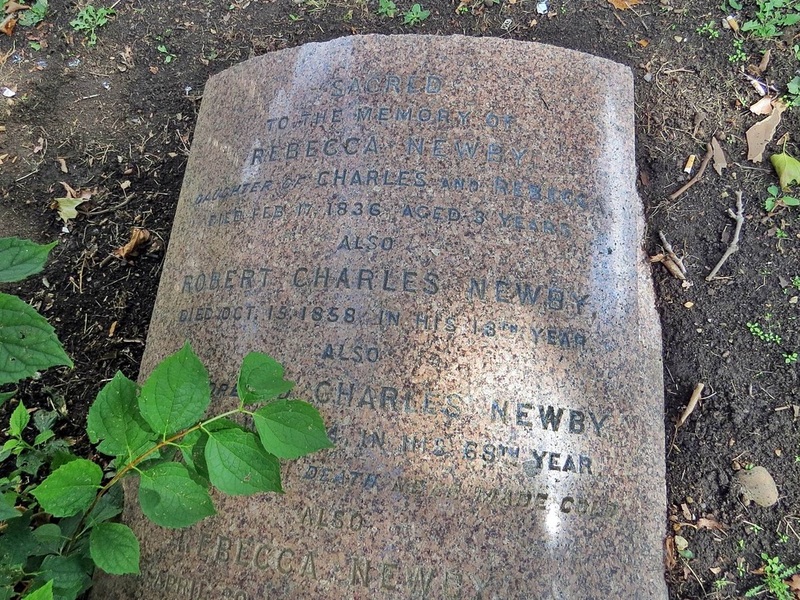 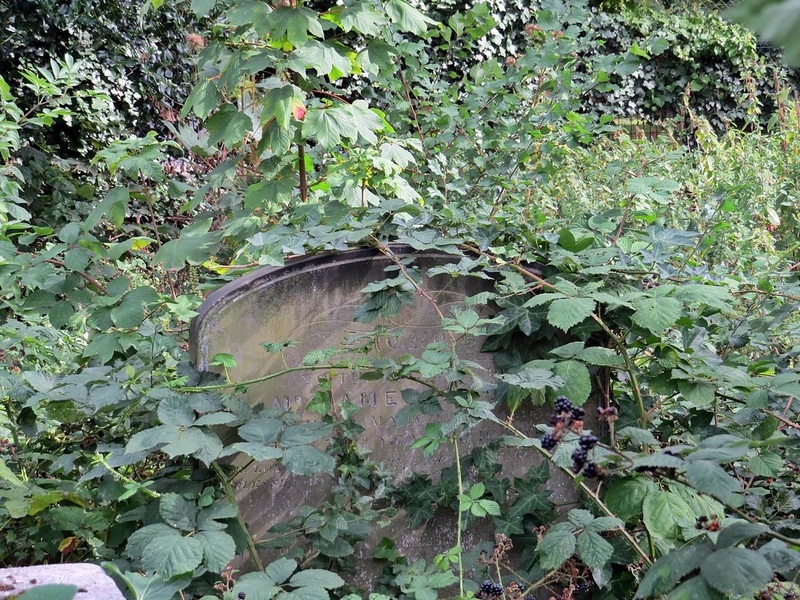 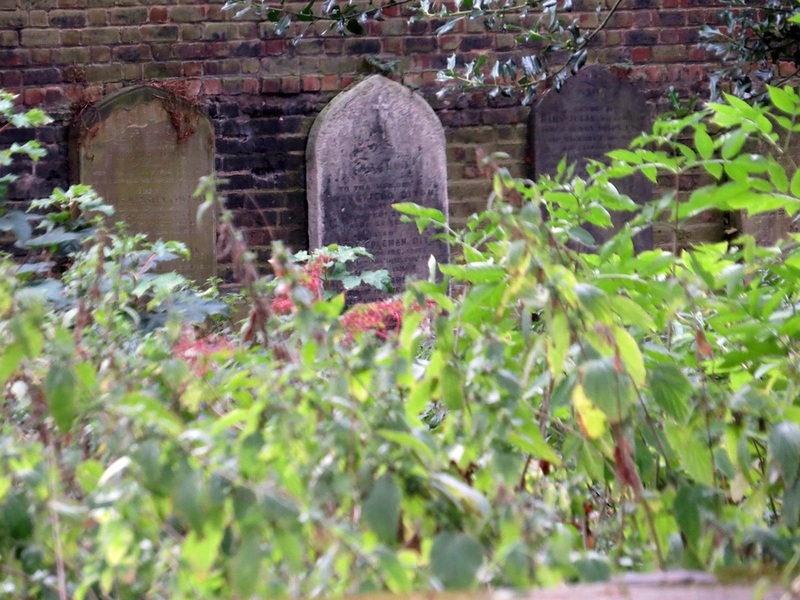 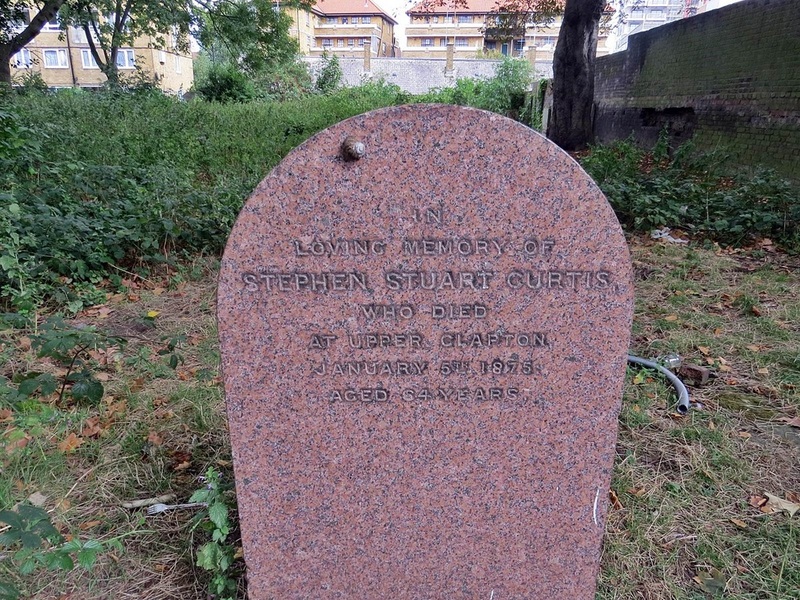 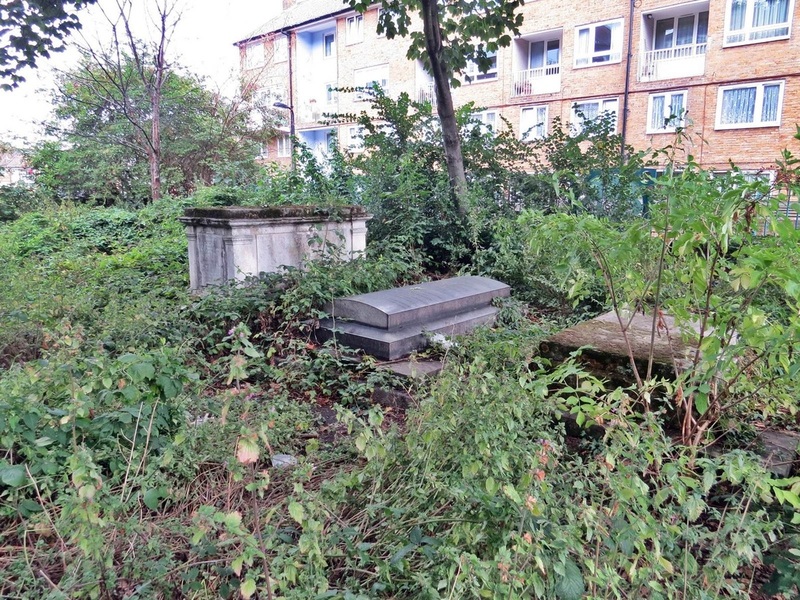 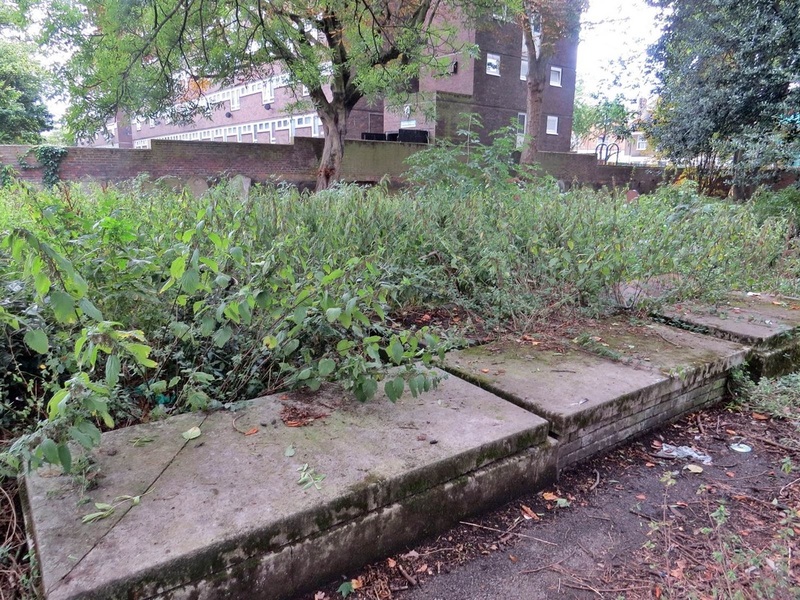 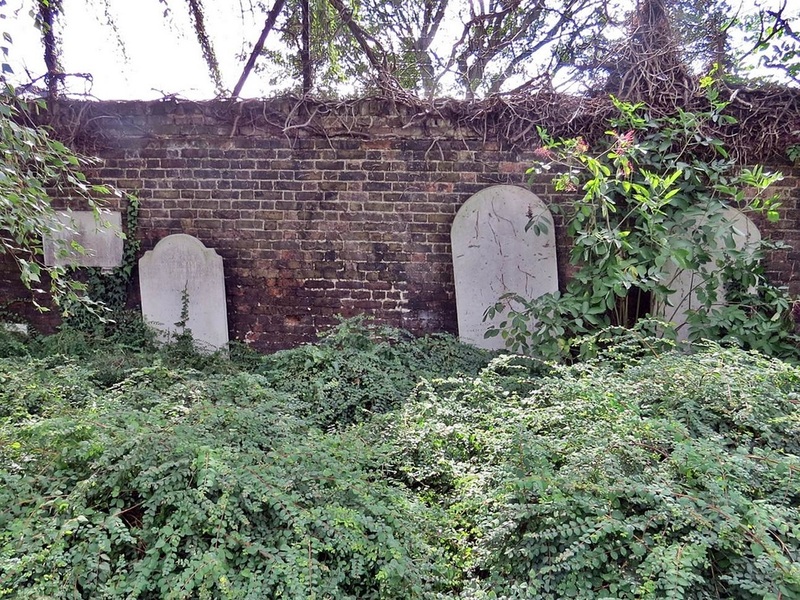 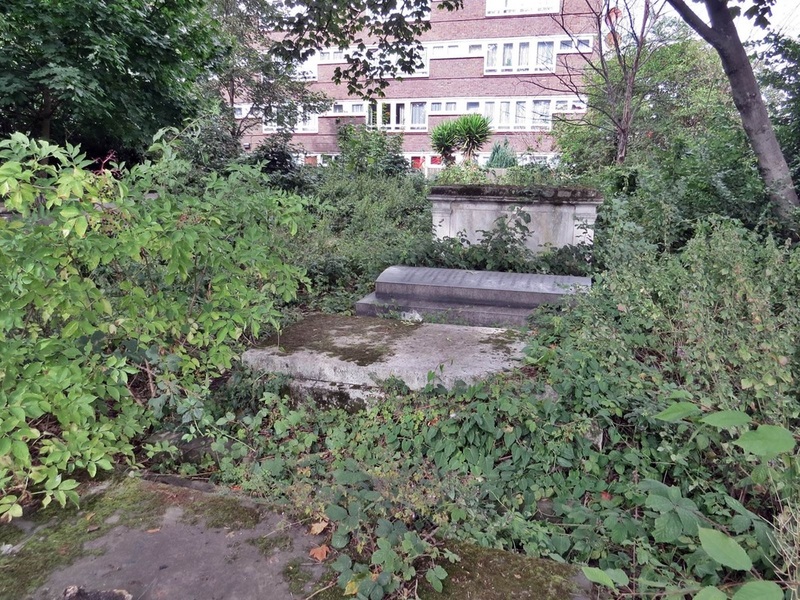 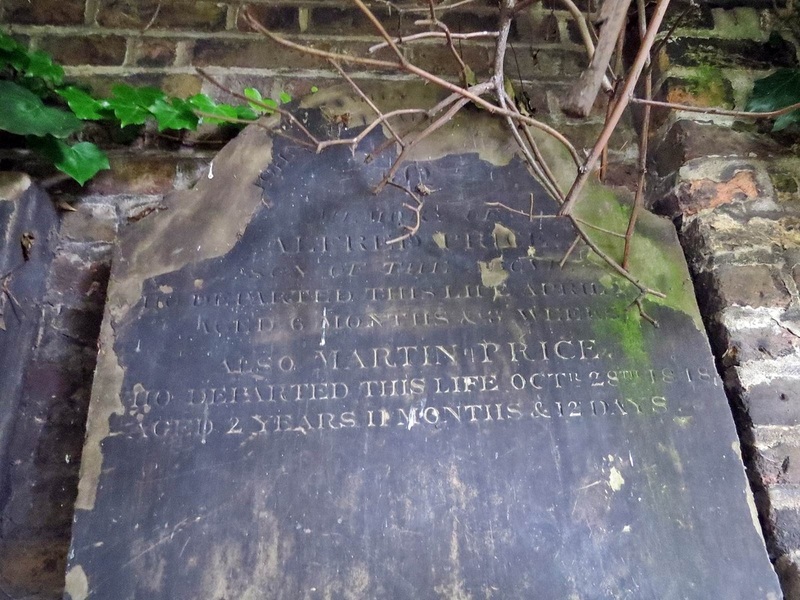 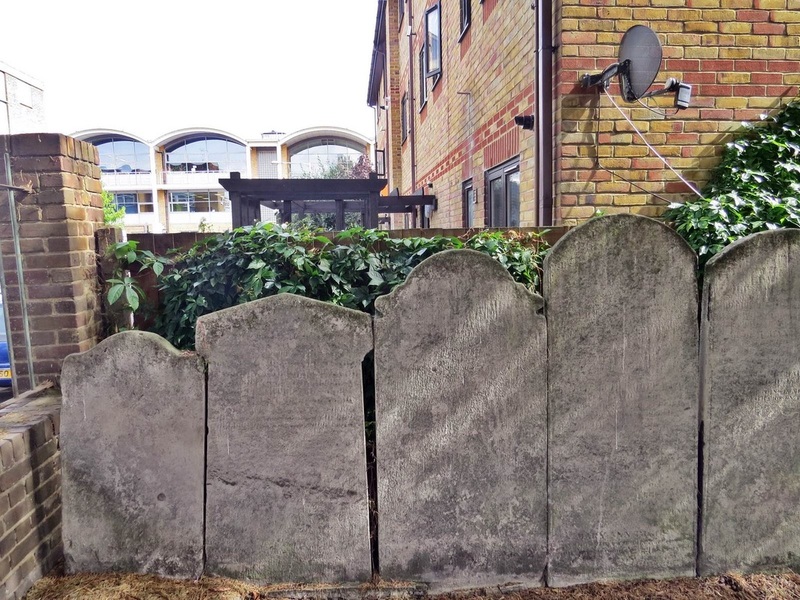 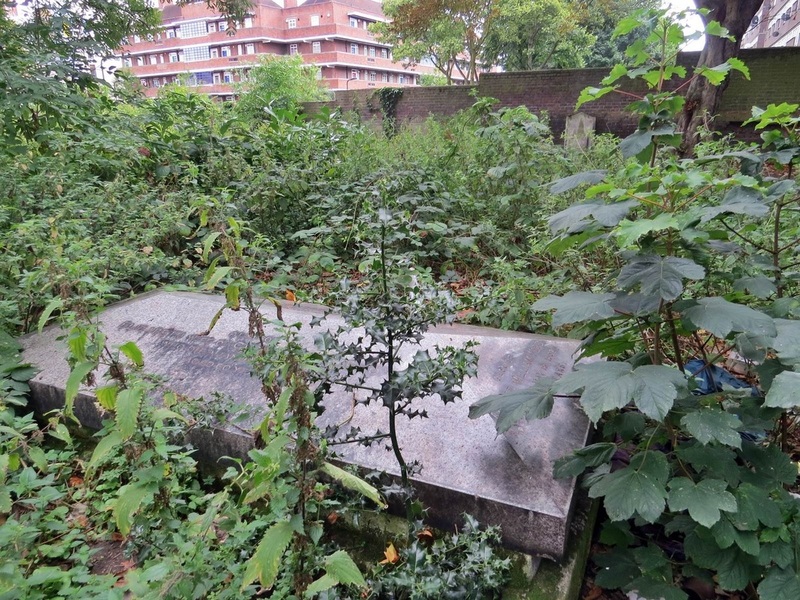 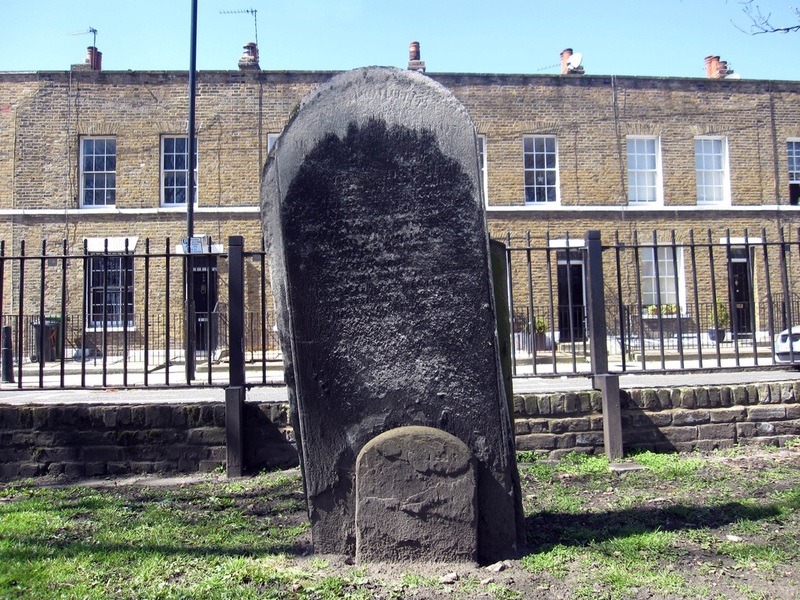 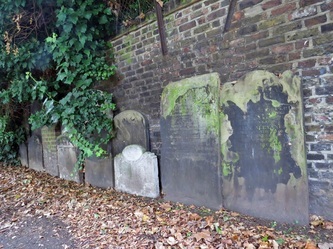 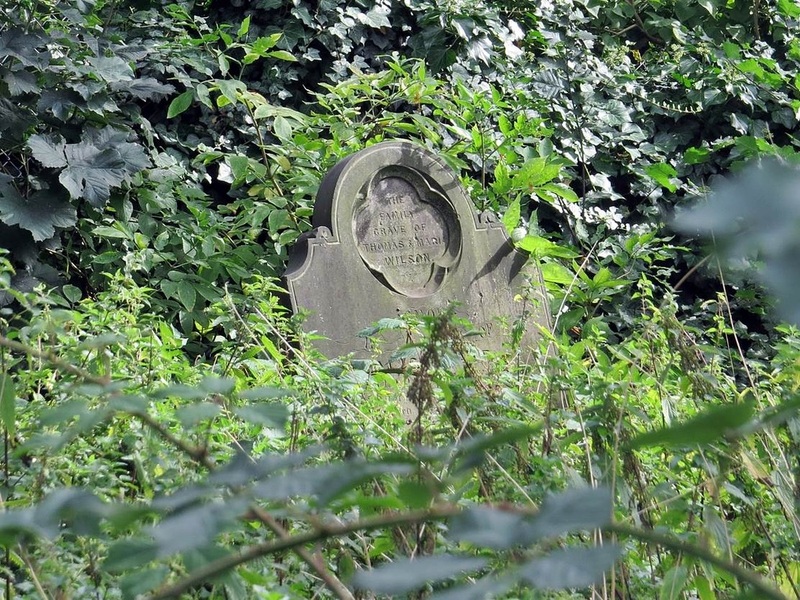 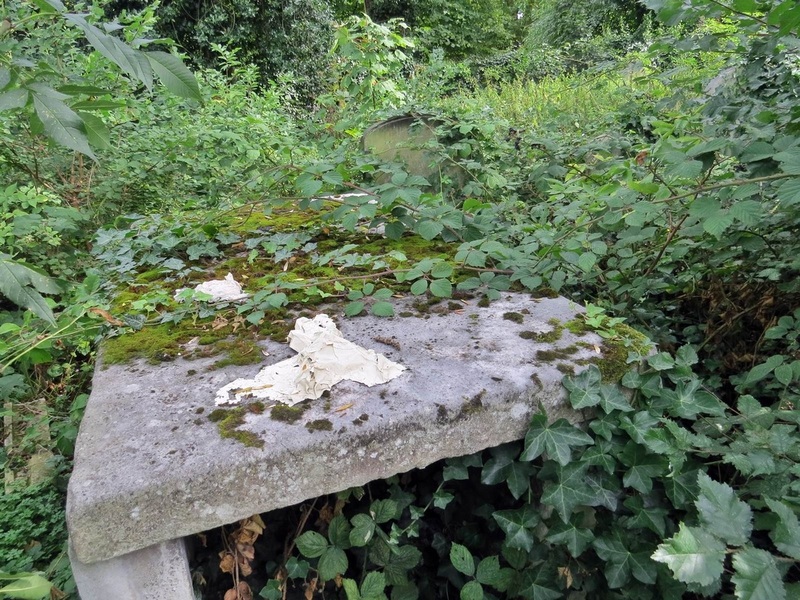 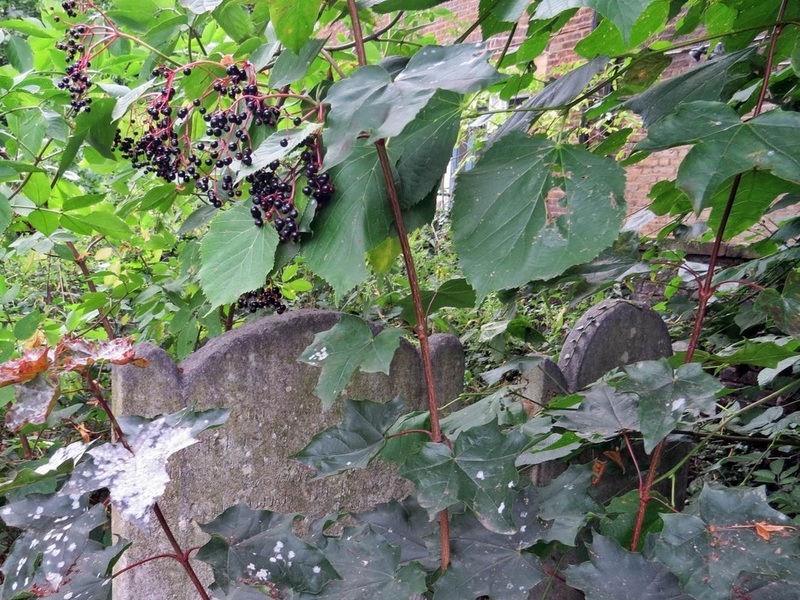 This site was formerly a non-conformist burial ground belonging to a church known as Stepney Meeting.The ruins of Stepney Meeting in the grounds of Stepney Farm can be seen on the Cemeteries, Churches & Chapels section on this website. 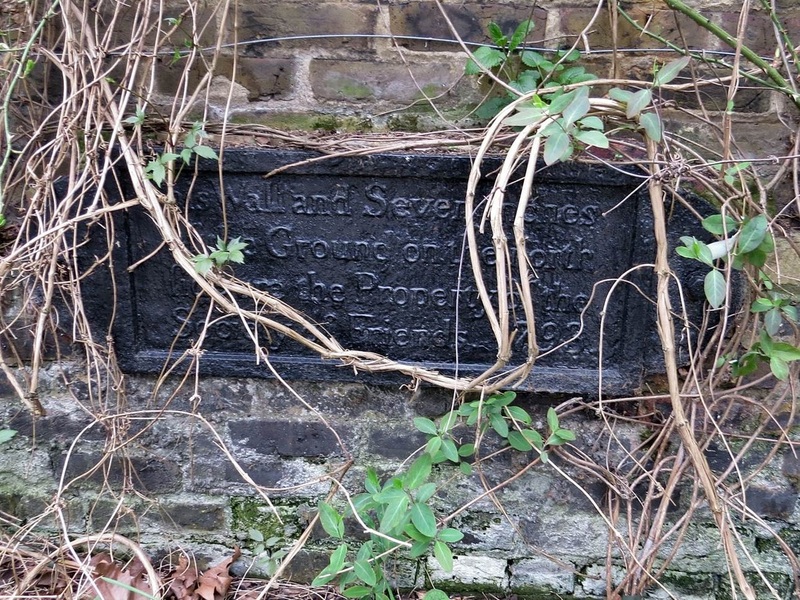 In the 17th Century Stepney was a stronghold of Puritanism and supported Parliament in the Civil War. 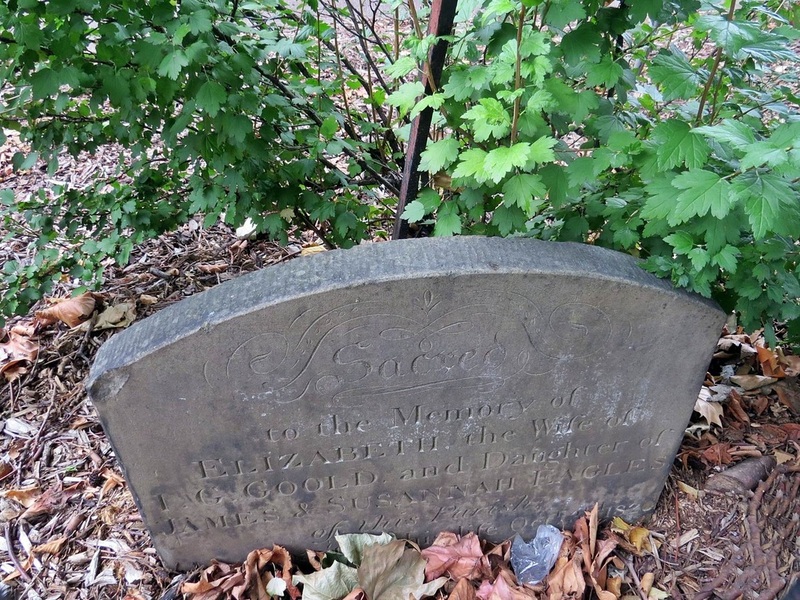 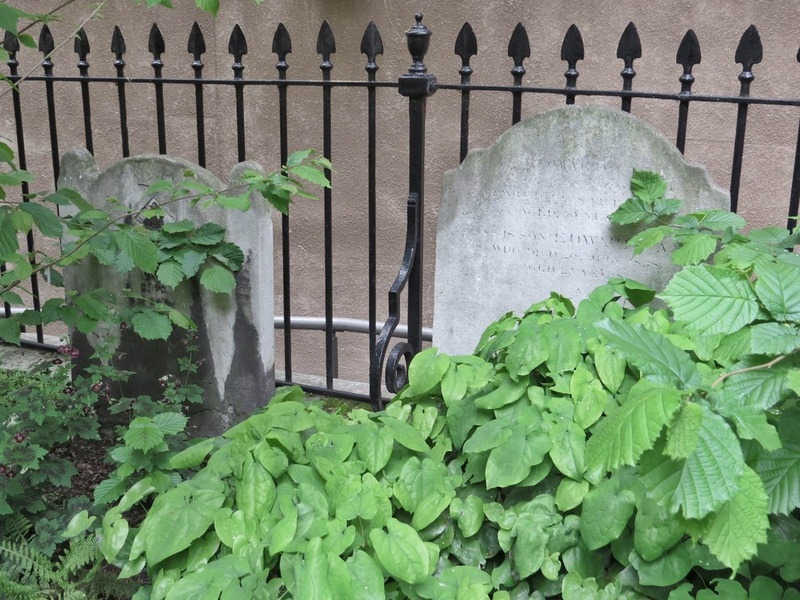 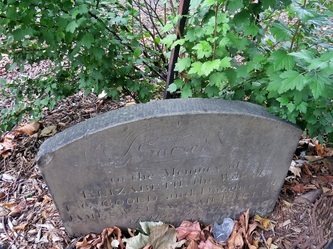 This burial ground was opened in 1779 and closed in 1853. St Dunstan in the West is a church to the south of this site in nearby Fleet Street. 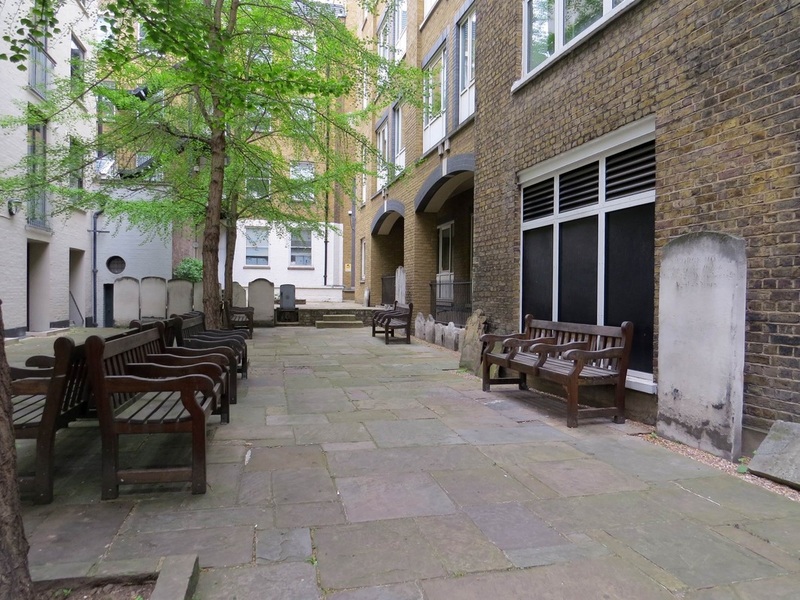 St Dunstans dates back to medieval times but was rebuilt in 1831 in order to accomodate the widening of Fleet Street. 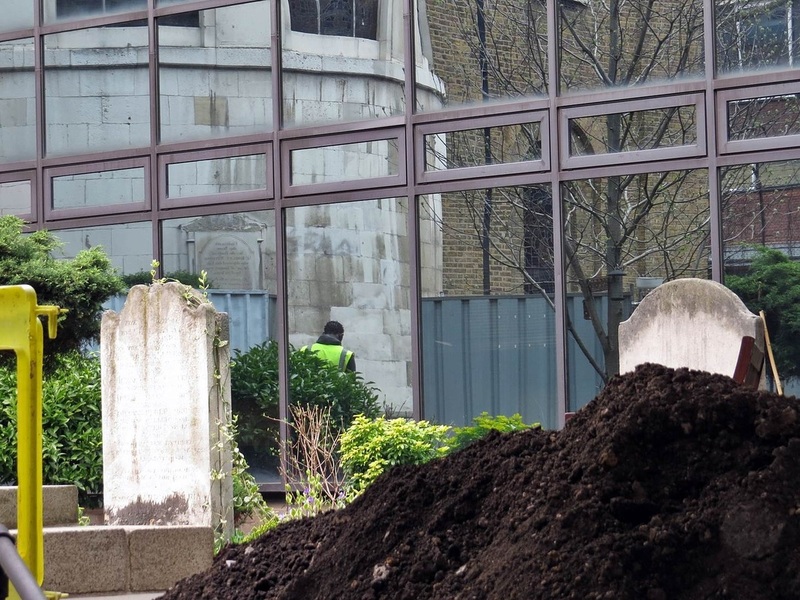 This is the remaining piece of the burial ground and now surrounded by offices. 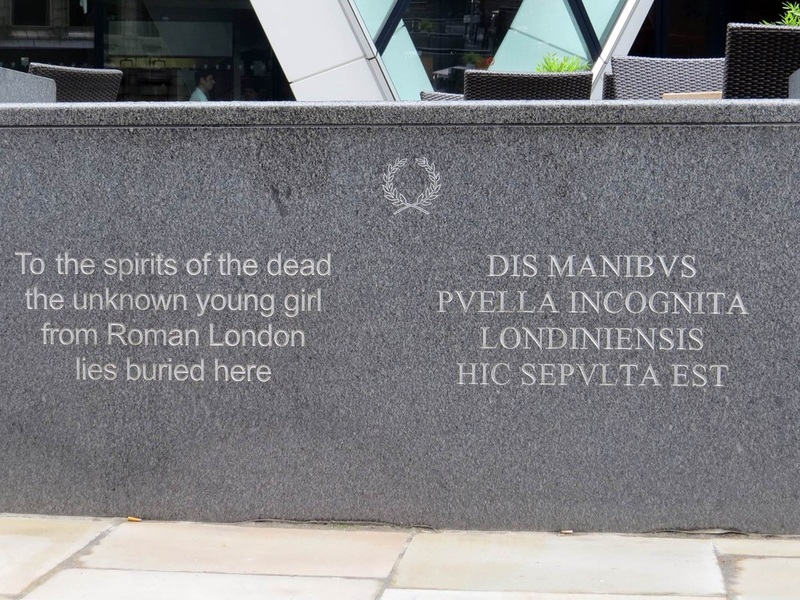 The skeleton was that of a young woman of around 13-17 years of age and appeared to be an isolated burial and not part of a cemetery.The burial would have lain just outside an early boundary ditch marking the edge of the Roman city.Pottery found in association with the burial has been dated to AD 350-400. 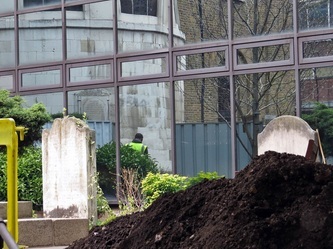 A service for the reburial was attended by the Lady Mayoress of the City of London & took place at St Botolphs Church in Aldgate and was followed by a procession to the burial site where there was a dedication with music. 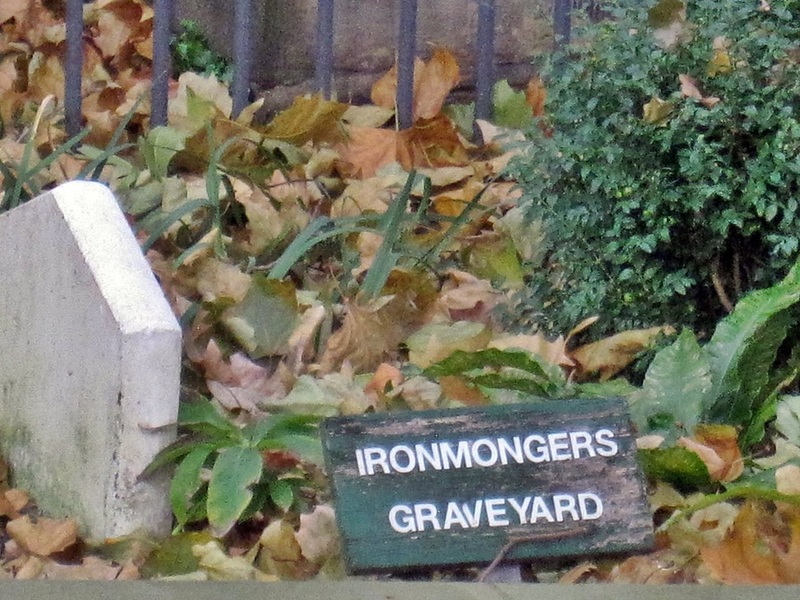 Not to be confused with the existing East London Cemetery and Crematorium in Plaistow. 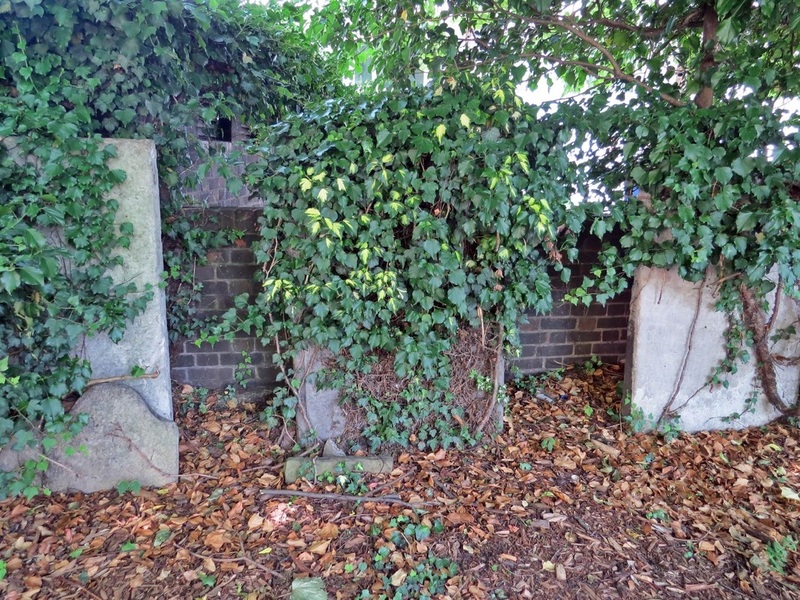 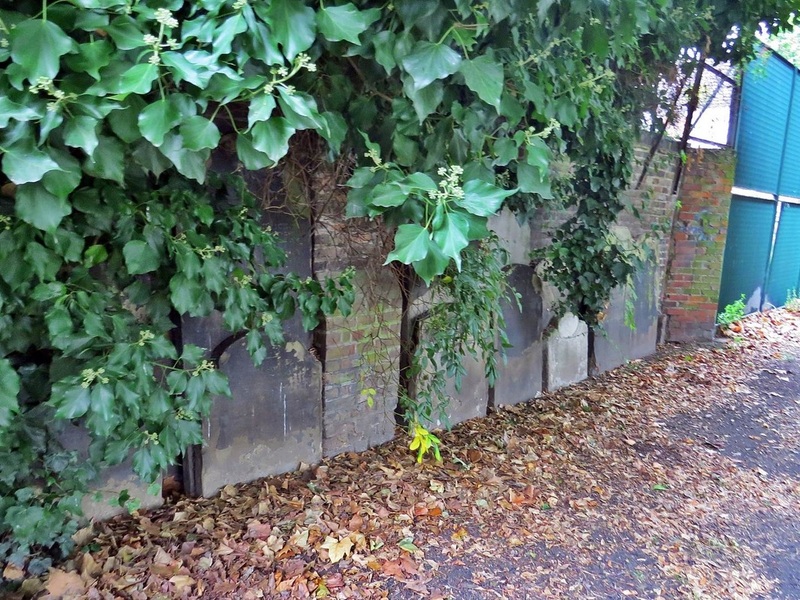 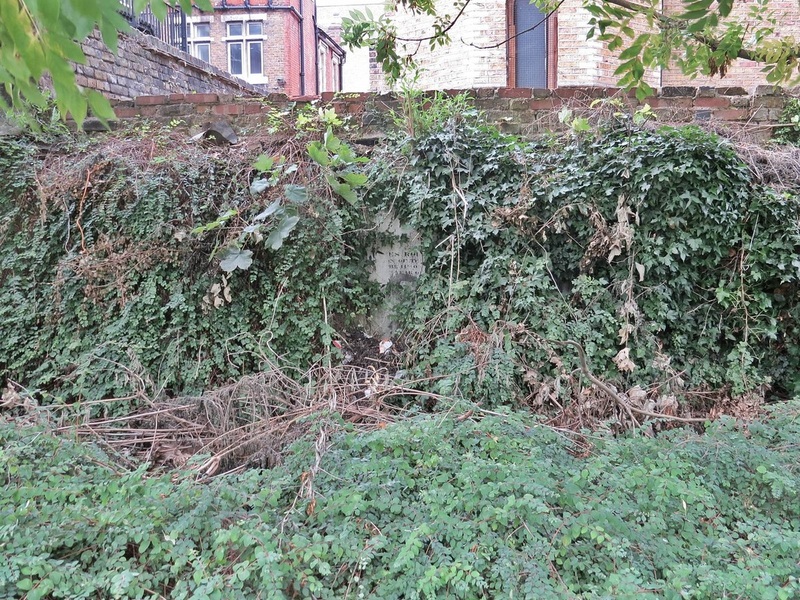 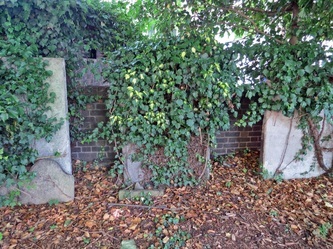 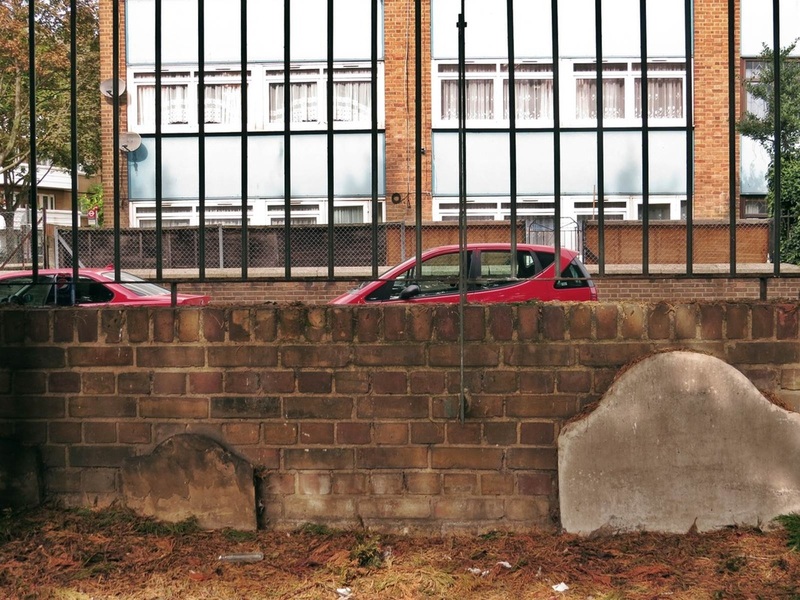 There remain some headstones against the wall adjoining what remains of St Faith's Church (built just to the north of the ground in 1891 but it was bombed in the war), and St Faith's House (now Arbour Youth Centre). 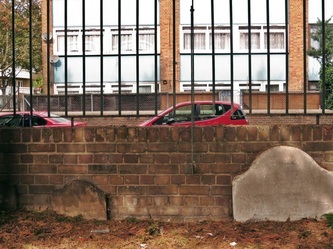 Finsbury - Mount Mills Burial Pit - a plague burial ground that is now car park and residential gardens. 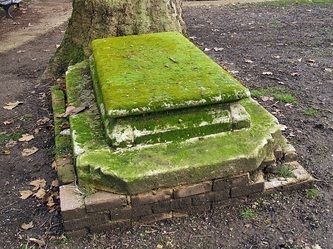 Finsbury - St Bartholomews Hospital Burial Ground. 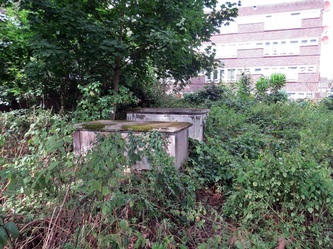 This was used for the internment of unclaimed bodies at the hospital. The raised site is now a playground.